Miharu castle (三春城) is located at Shiroyama hill of 400 meter above sea level, in the center of Miharu town. 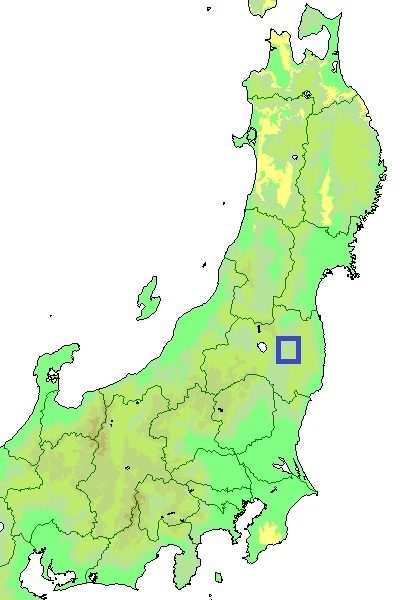 Miharu town places at the center of current Fukushima prefecture, and the town itself is a small town in the valley but had played important role as a crossing point of north and southward road connecting Shirakawa area and Koriyama area, and east and west ward road between Aizu Wakamatsu area and Soma or Iwaki area at eastern coast. 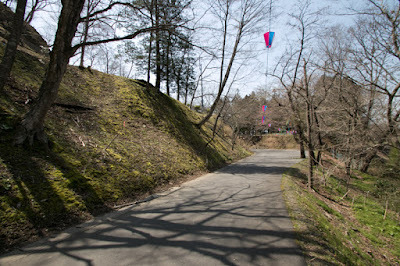 Today vertical route moved to the western coast of Abukumagawa river, but horizontal line still remains as Banetsu Expressway road passes near the town. 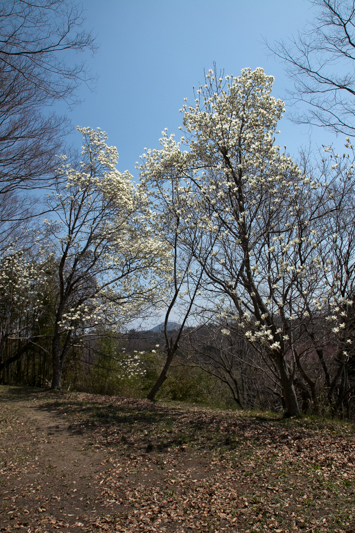 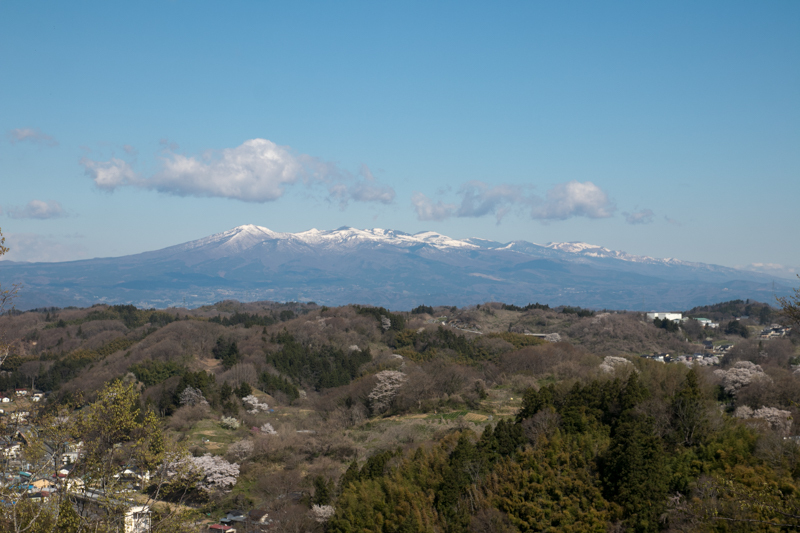 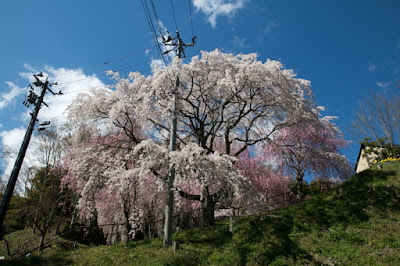 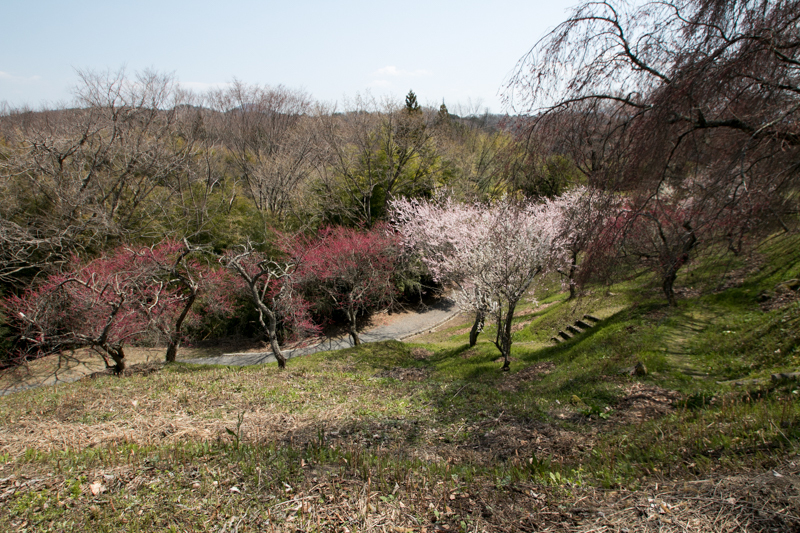 The name of Miharu means three springs, because in spring plum, peach and cherry blossom blooms at the same timing in this area. 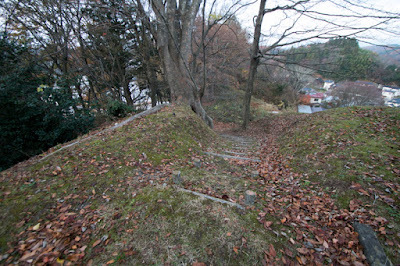 Precise situation is unknown but it is said that Miharu castle was built by Yoshiaki Tamura (?-1561) in 1504. 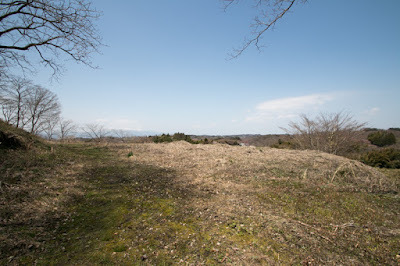 Tamura clan appealed that it was a descendant of Tamuramaro Sakanoue (758-811), who was the first general appointed as Shogun and activated in campaign at Tohoku region around AD 800, but it is not clear if this is true or not. Anyway some retainer might have relationship with Sakanoue Tamuramaro continued as Tamura clan as a local lord of Tamura county.. 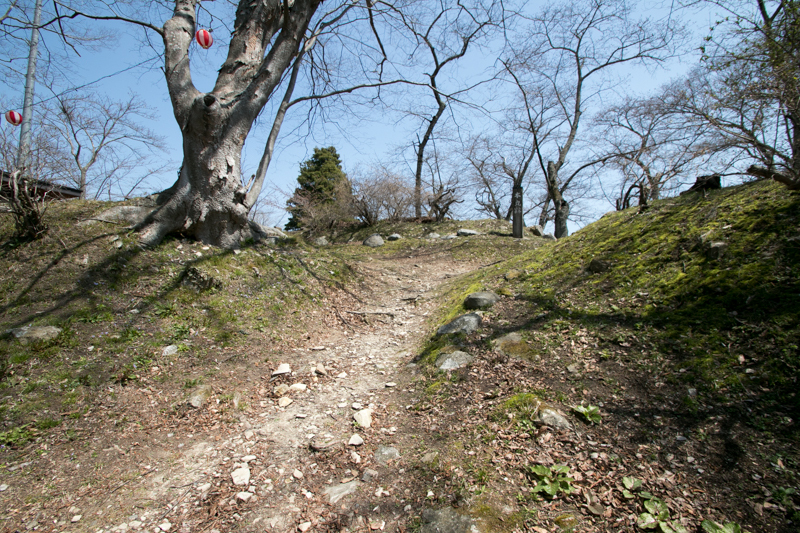 In Muromachi era, main family of Tamura clan declined and Miharu area was divided by many small local lords. 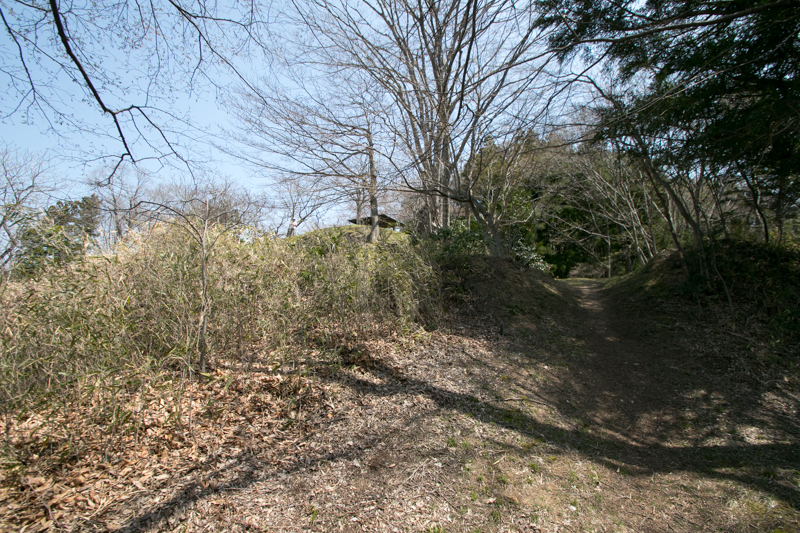 Among these small local lords, Tamura clan gradually grew their power and became a warlord at the period of Yoshiaki Tamura. 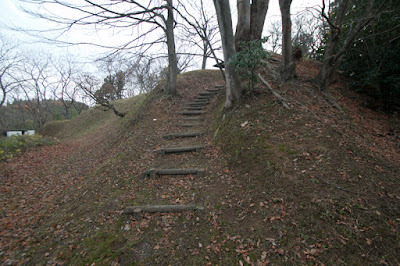 Yoshiaki moved his main base from Moriyama castle at current Koriyama city to Miharu city, at the center of Tamura county and crossing point of roads. 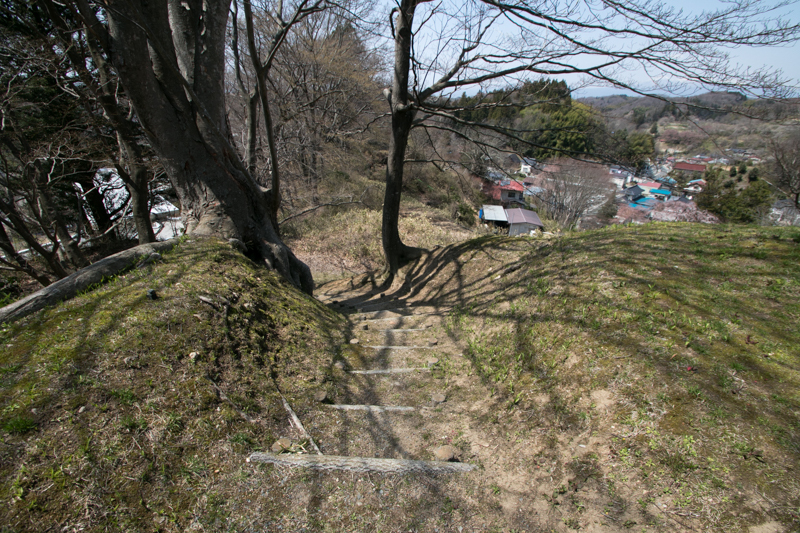 After that, Tamura clan aggressively attacked surrounding small lords and expanded their territory throughout the former half of 16th century. 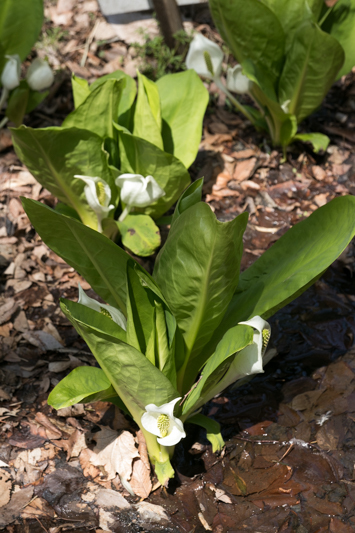 But at the same time, because of its geographical condition, Tamura clan had to face strong warlords at surrounding areas. 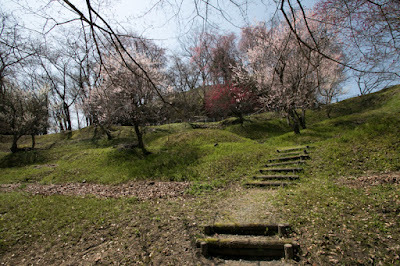 At the north there was Date clan which was a distinguished family of Tohoku region even though it temporally declined because of internal conflict, and At westward Ashina clan of Kurokawa Castle (current Aizu Wakamatsu castle) grew into the ruler of Aizu basin and aimed further expansion. At the east Soma clan which was a small but strong lord existed, and Satake clan which was the lord of Hitachi province (Ibaraki prefecture) went out of confusion and also aimed expansion. Among such situation, Tamura clan chose to ally with Date clan and fight with other strong lords. 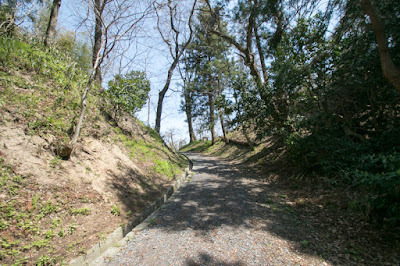 Kiyoaki Tamura (?-1586), the grandson of Yoshiaki, sent his daughter Yoshihime (1568-1653) as a formal wife of Masamune Date (1567-1636). 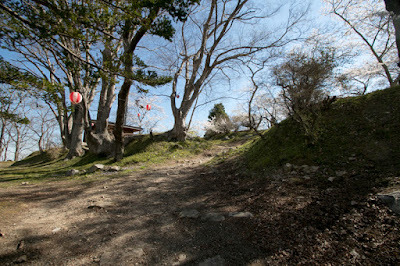 After the death of Kiyoaki without formal supporter, Date supporting retainer and anti Date retainer conflicted and Tamura clan became weak. Looking at this situation, Masamune who barely won at the battle of Koriyama placed his supporter as the lord of Tamura clan, then Tamura clan came to subordinate to Date clan. 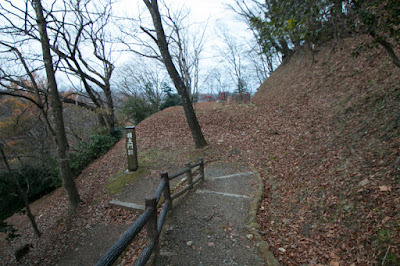 But when central ruler Hideyoshi Toyotomi (1537-1598) forced Masamune to visit his headquarter at Odawara campaign and subordinate in 1590, Masamune himself visited Hideyoshi but did not accompany Tamura clan, to prevent continuation of Tamura clan as an independent lord. As a result, the territory of Tamura clan was confiscated then the history of Tamura clan as an independent lord had ended. 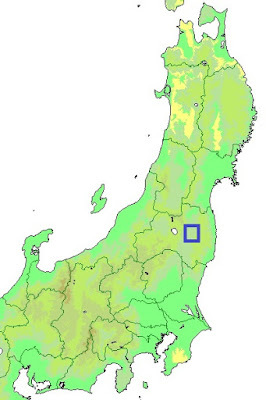 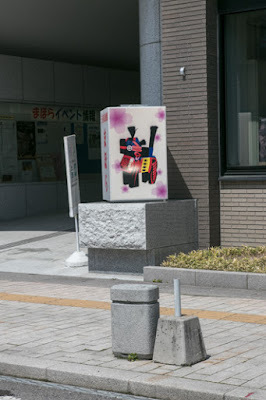 Once Masamune gained former territory of Tamura clan, but next year Masamune was moved to current Sendai area and lost the territory at current Fukushima prefecture. After Date clan, Ujisato Gamo (1556-1595) was appointed as the lord of current Fukushima prefecture including Miharu castle. 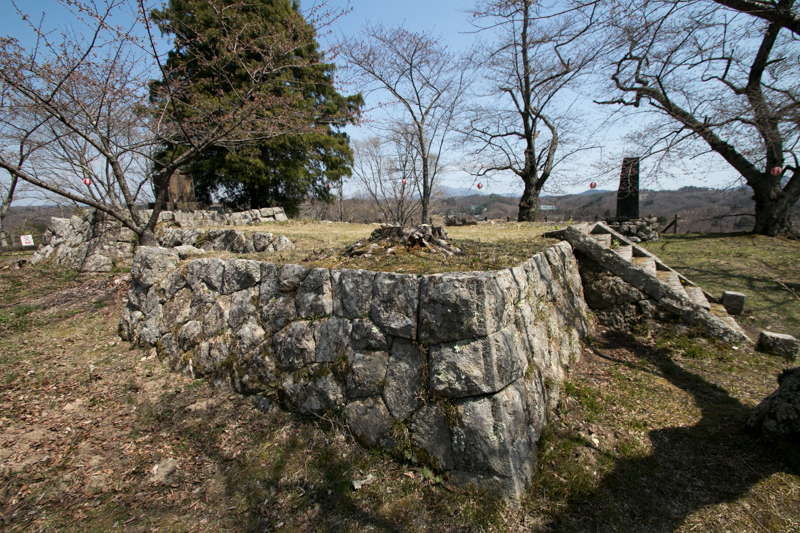 To manage vast and isolated territory, Ujisato reformed major castles of territory including Miharu castle with modern technology such as stone wall or Masugata gate (combined gate) as local military bases. 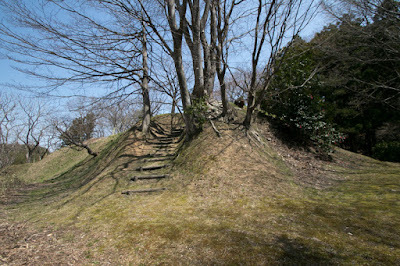 At this time Miharu castle turned into a modern castle, along with other neighbor castles such as Nihonmatsu castle, or Inawashiro castle. 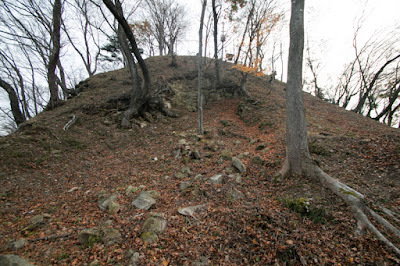 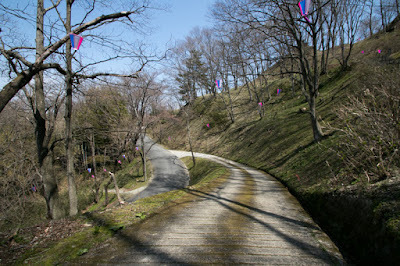 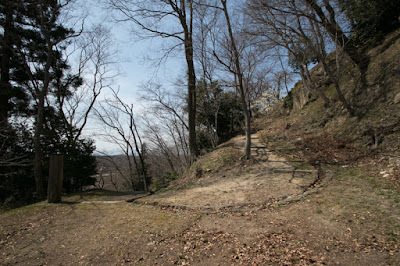 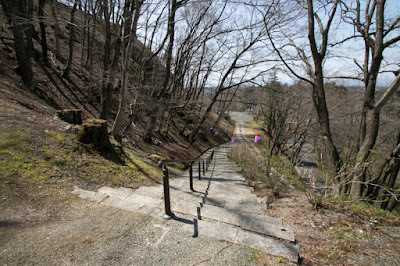 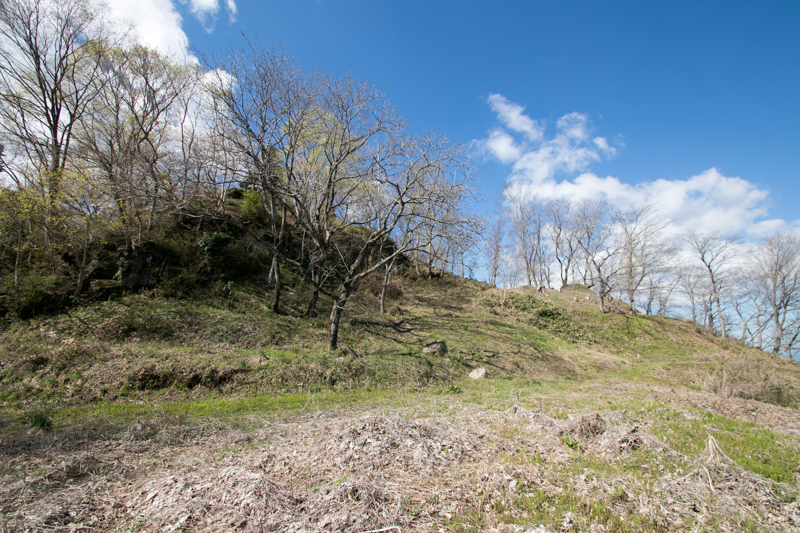 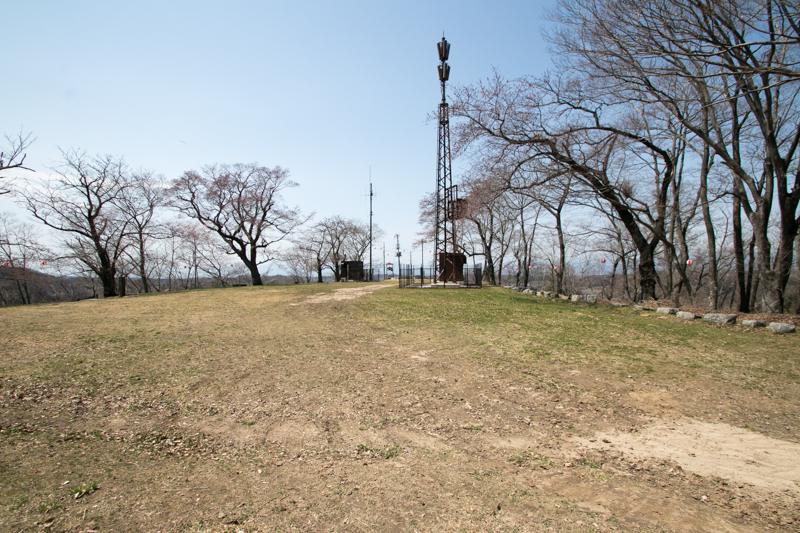 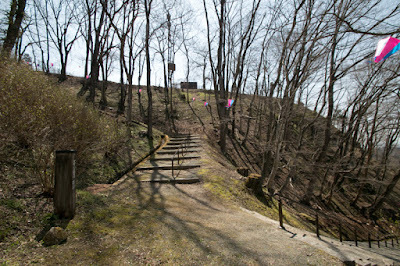 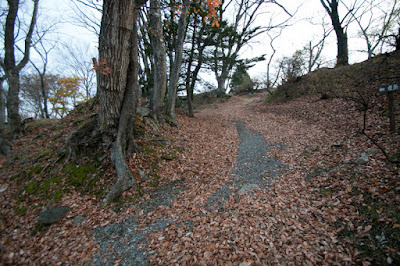 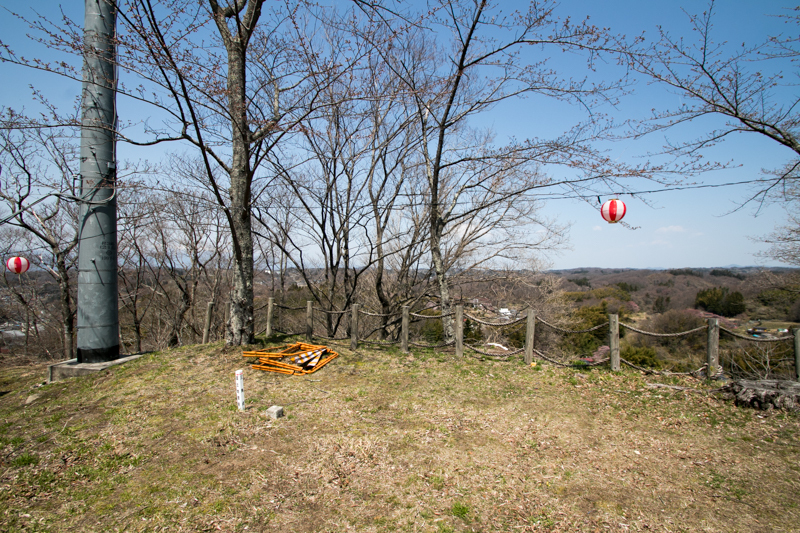 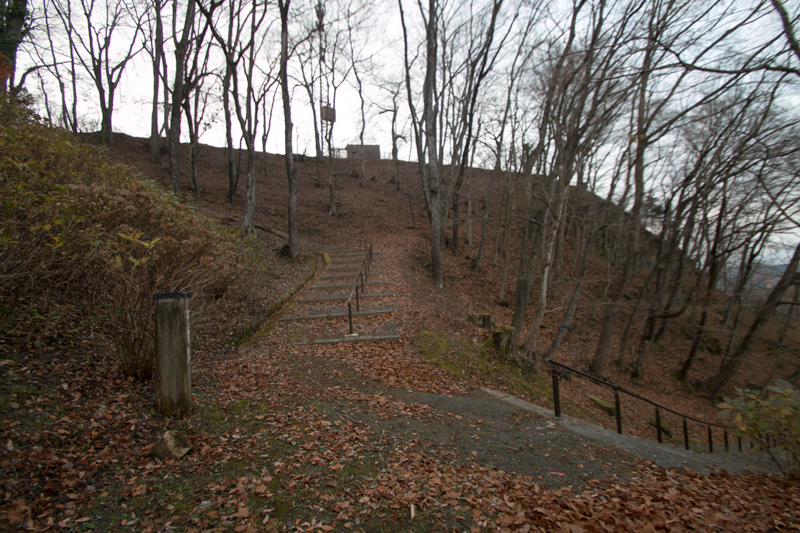 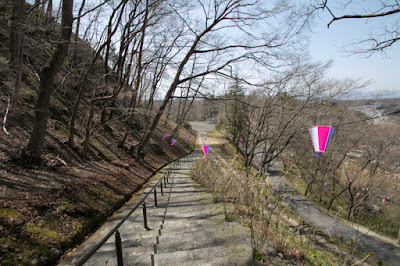 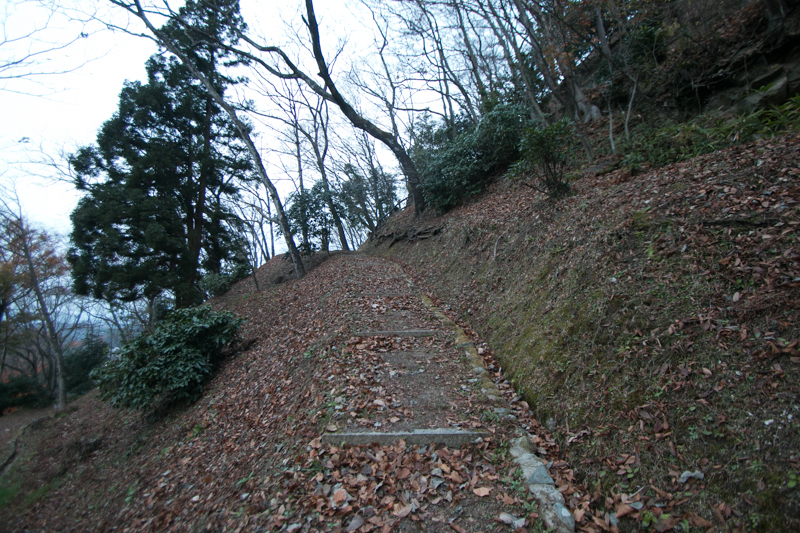 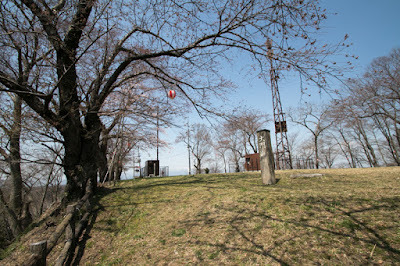 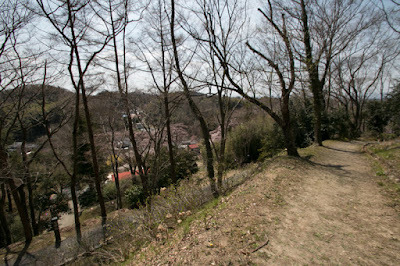 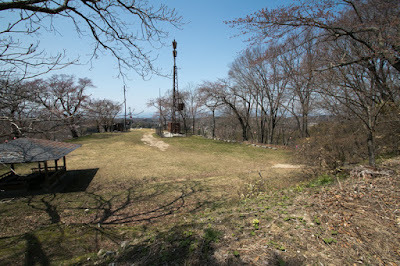 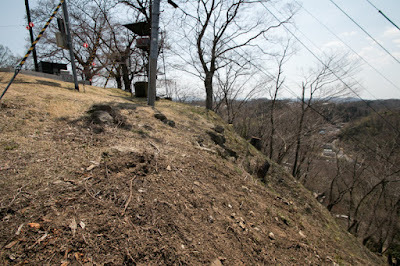 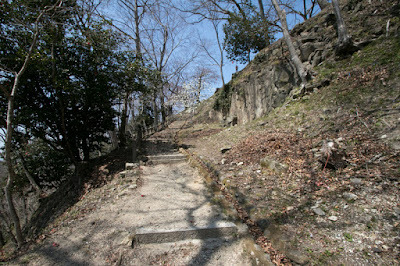 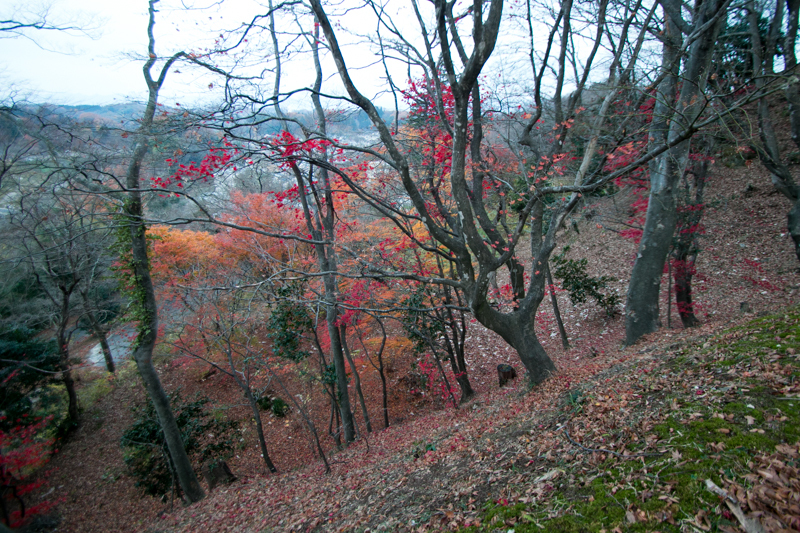 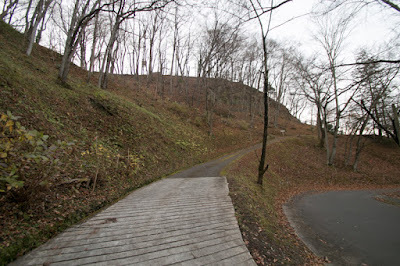 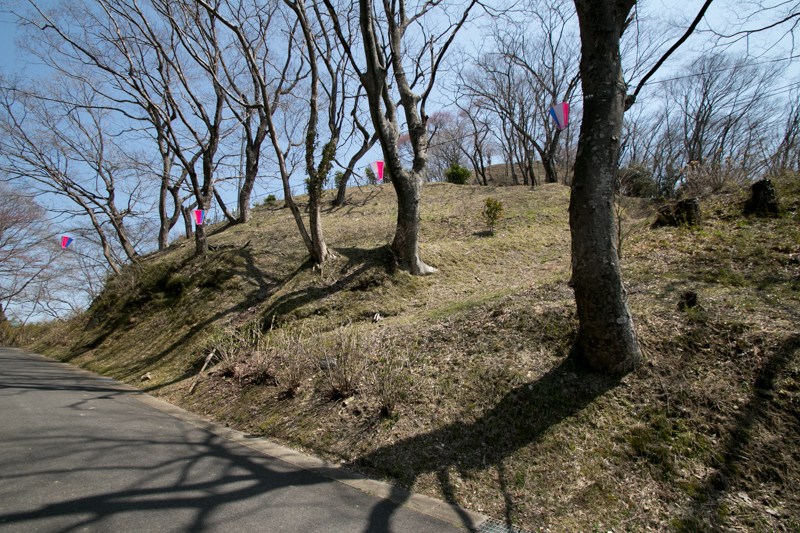 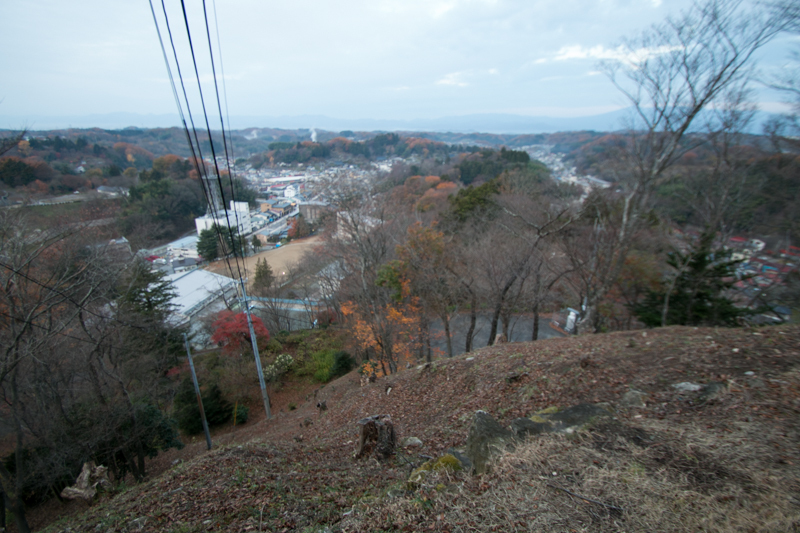 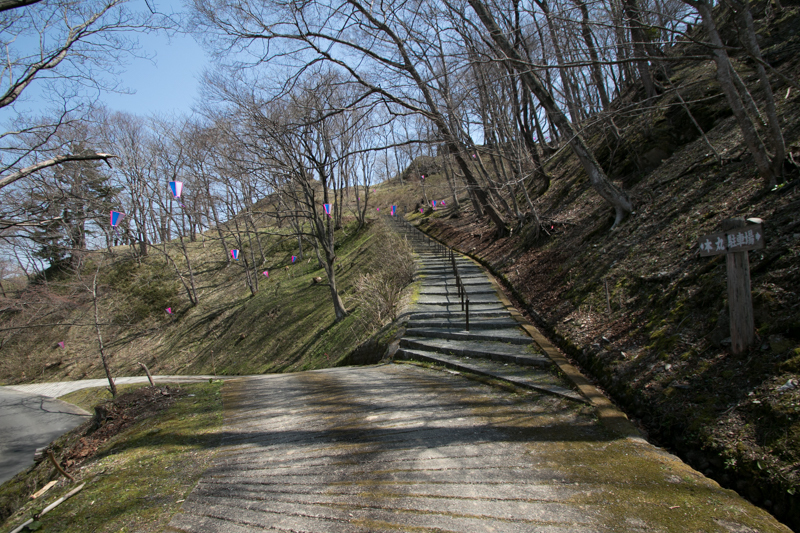 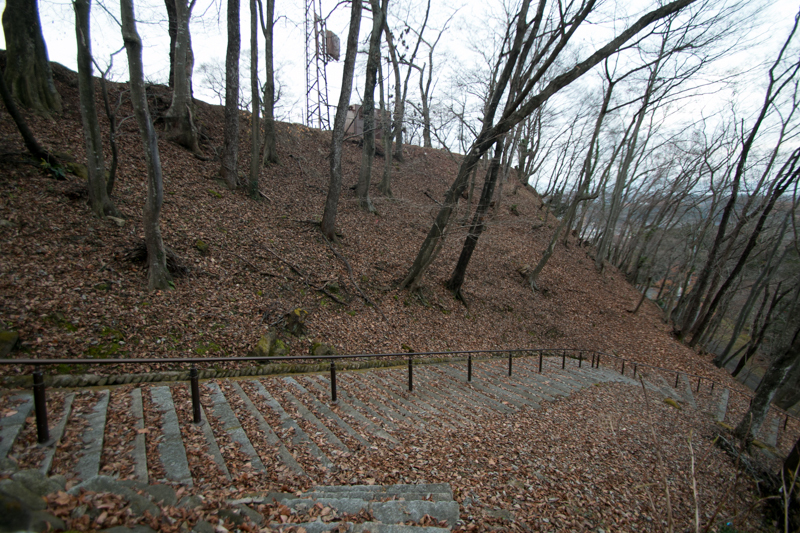 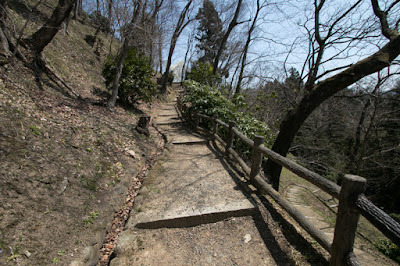 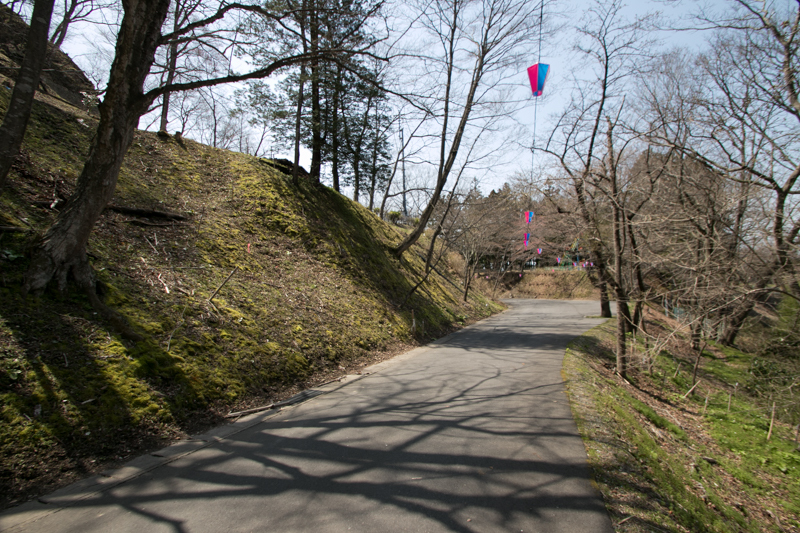 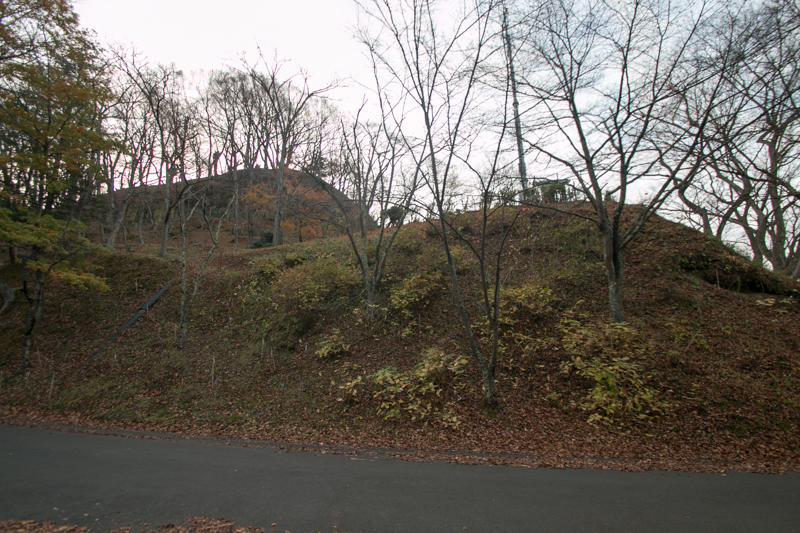 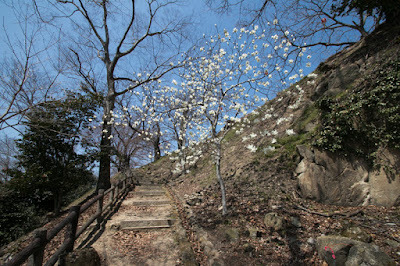 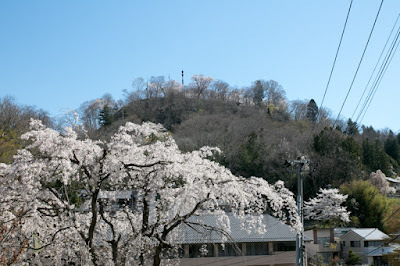 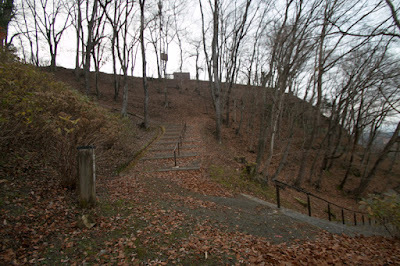 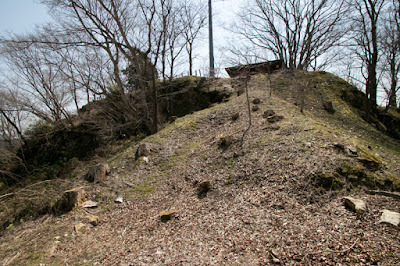 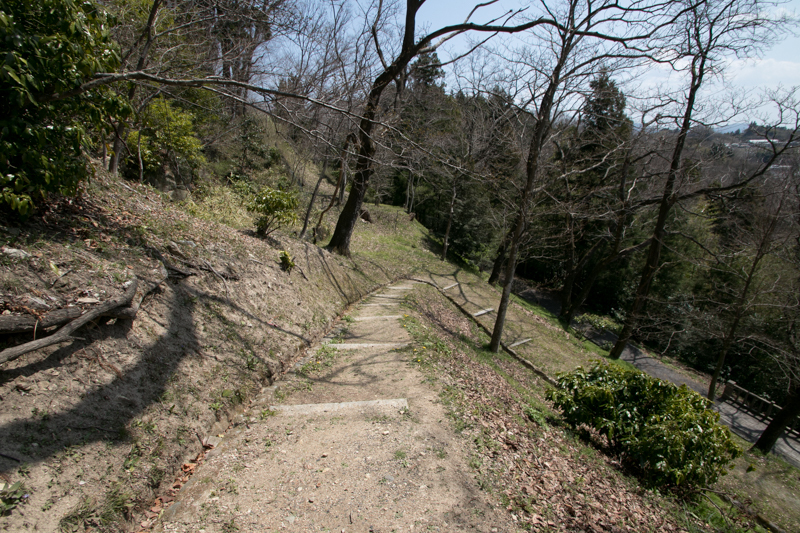 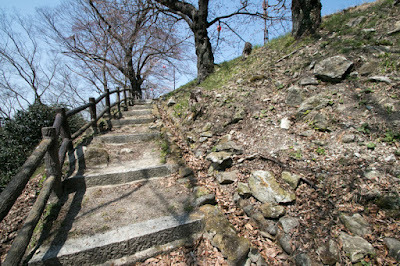 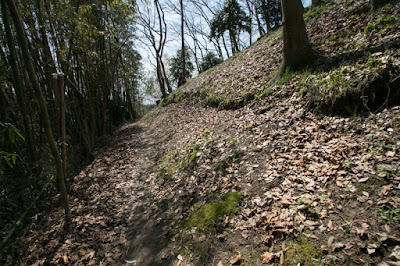 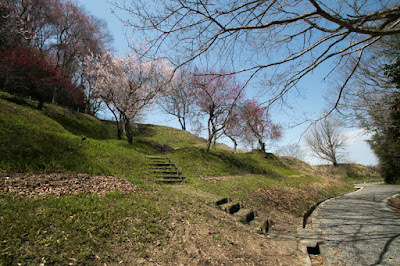 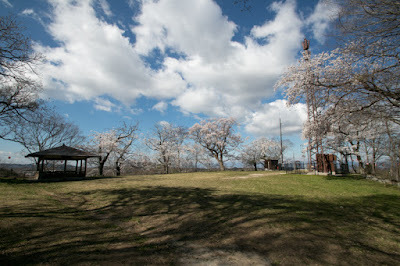 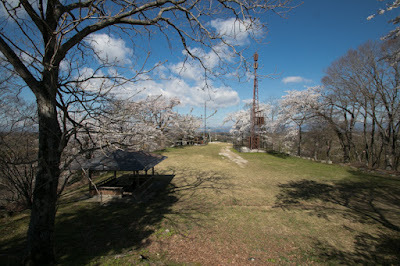 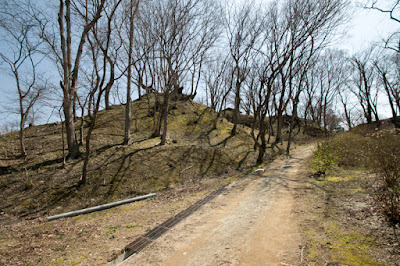 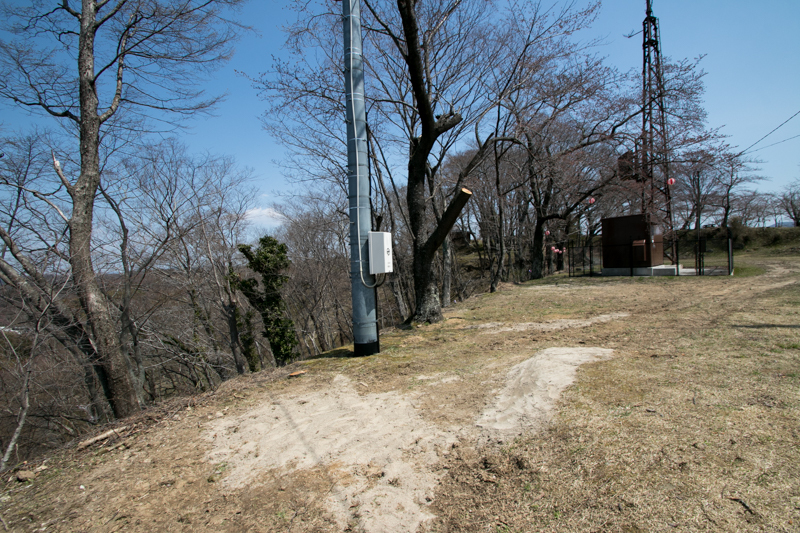 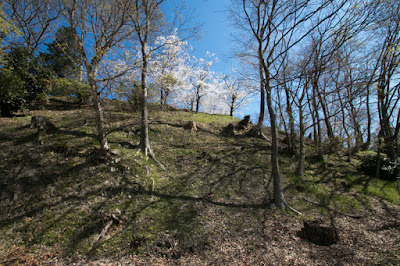 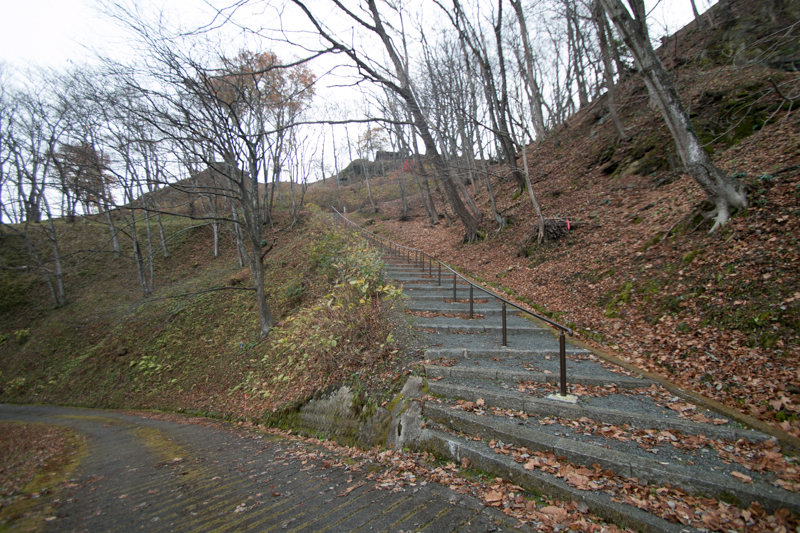 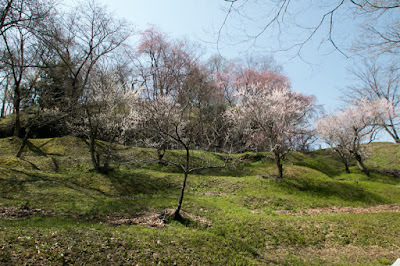 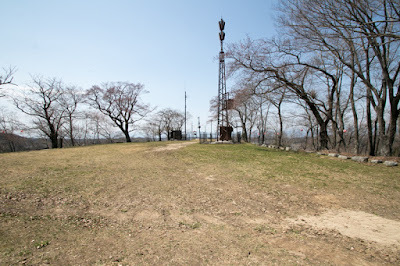 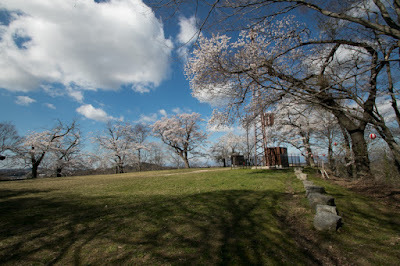 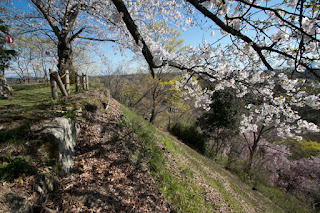 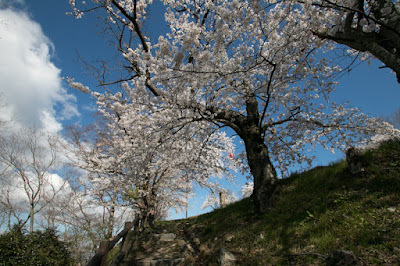 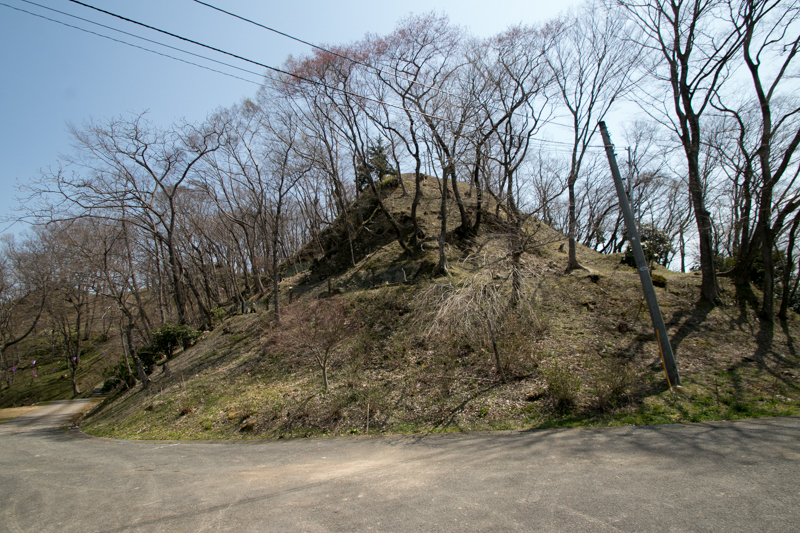 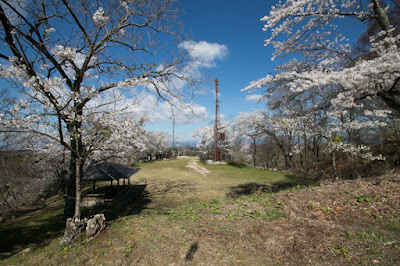 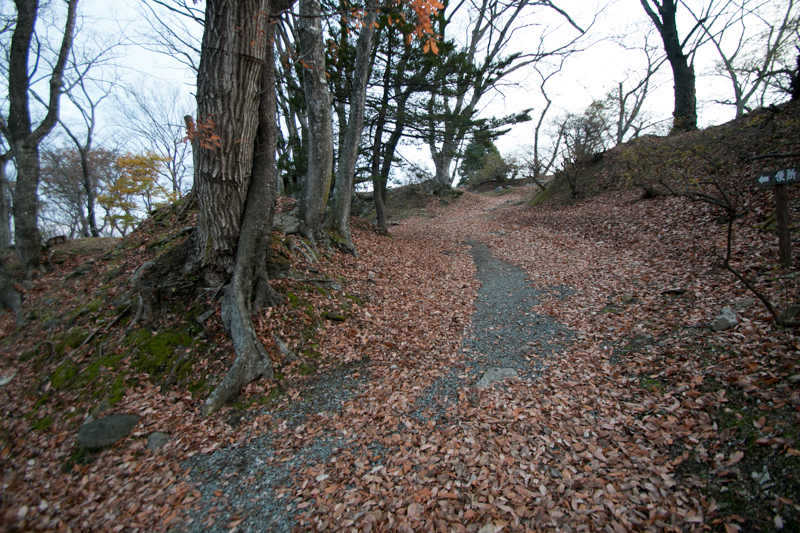 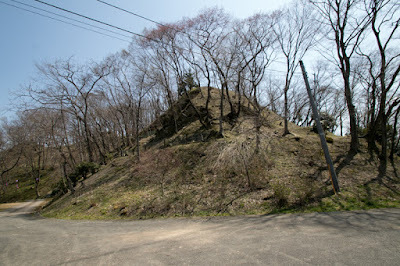 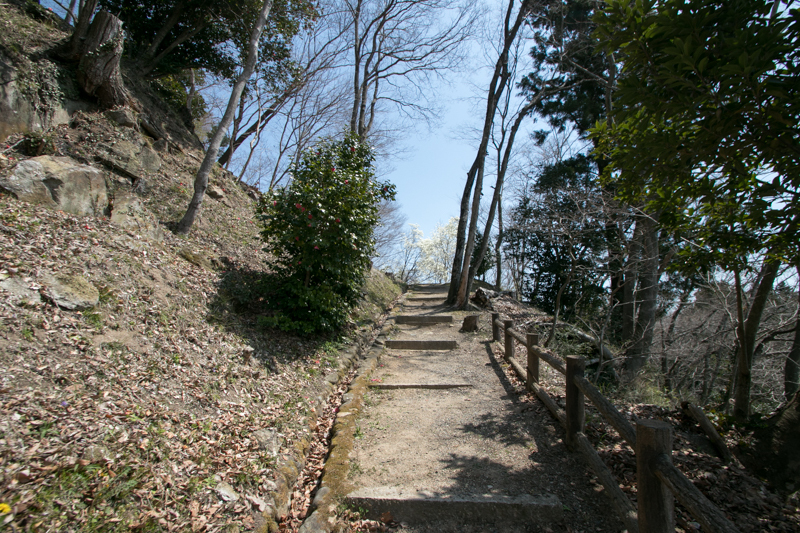 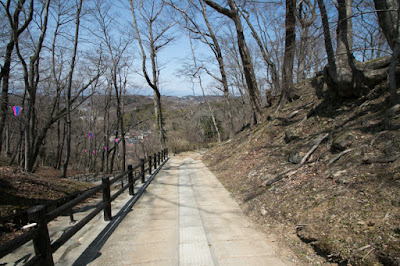 Shiroyama hill where Miharu castle stands is about 80 meter high from hillside. 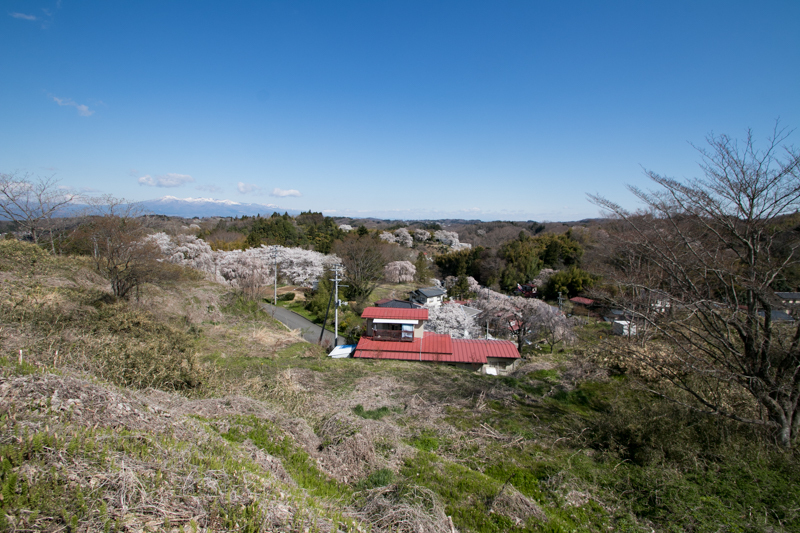 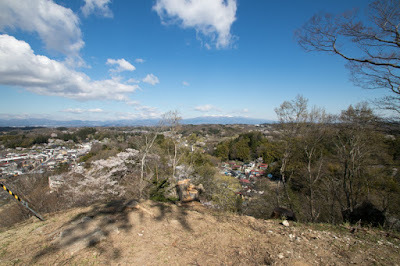 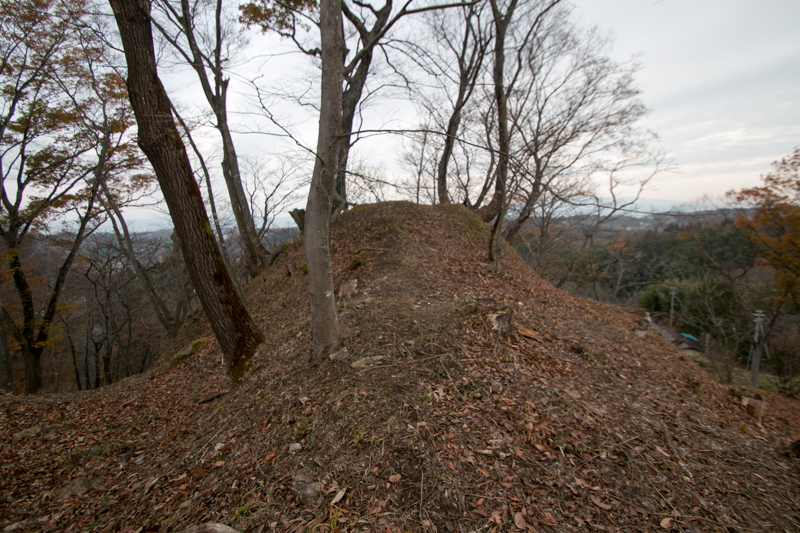 Upper half of the hill is a corn shaped peak with flat top, and core area of the castle is built using this flat area of 100 meter long and 50 meter wide. 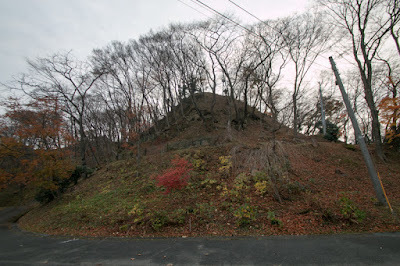 The shape of the peak is L shaped, and hilltop area is divided into upper and lower terrace at each line of L letter. 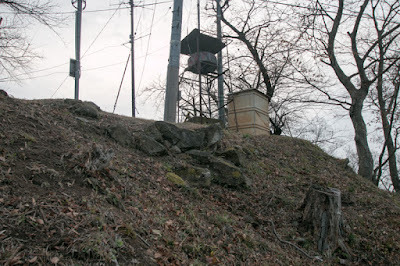 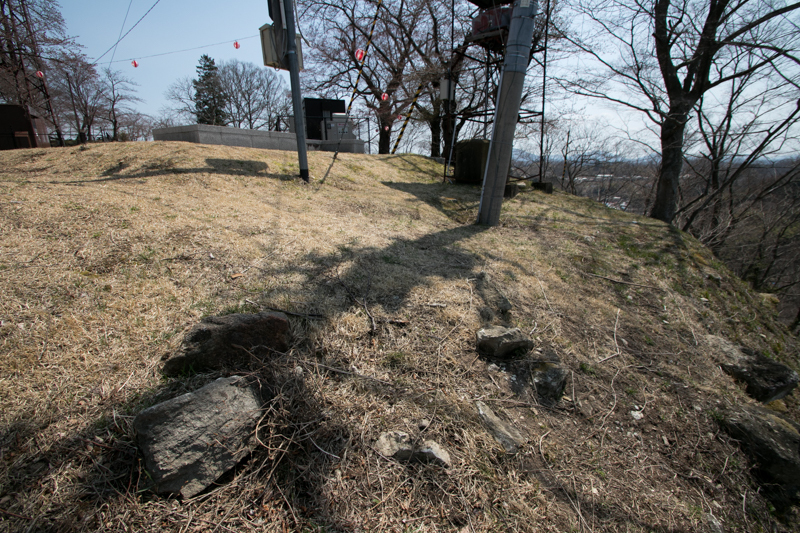 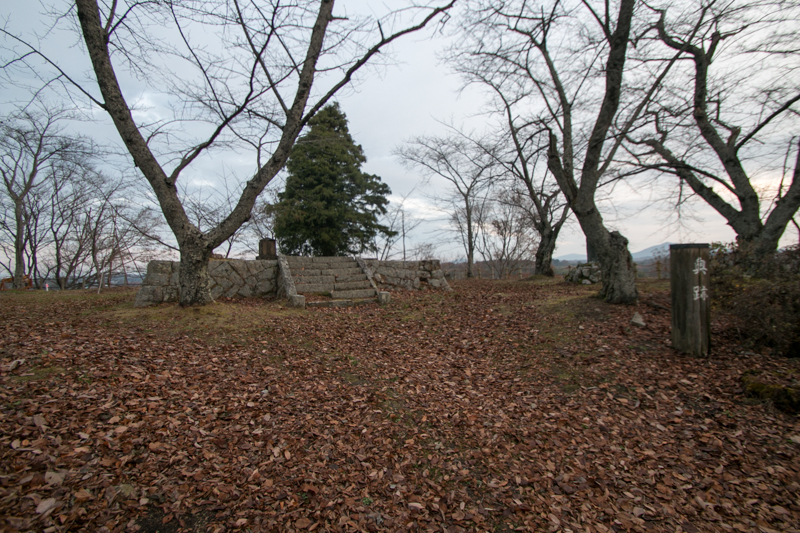 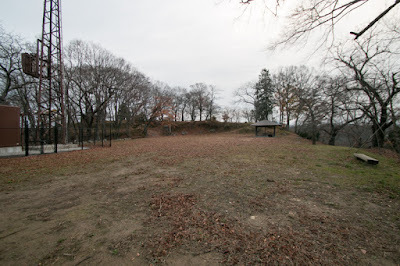 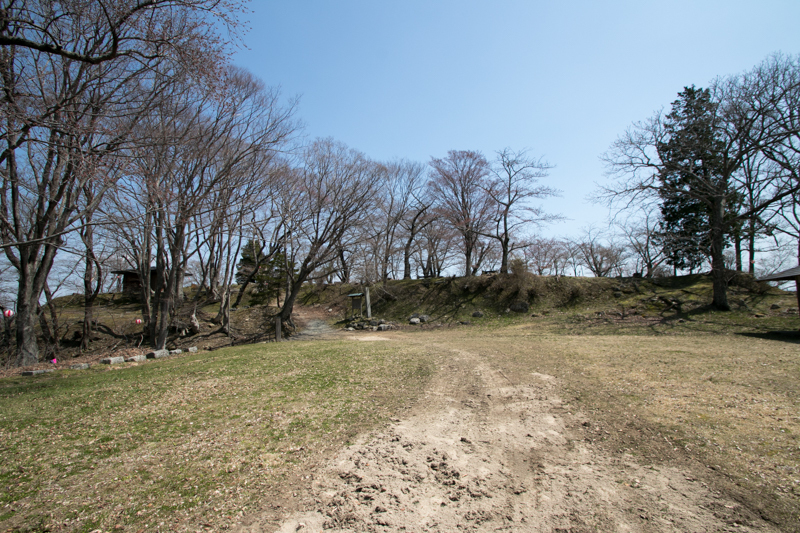 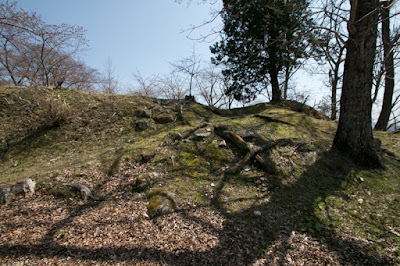 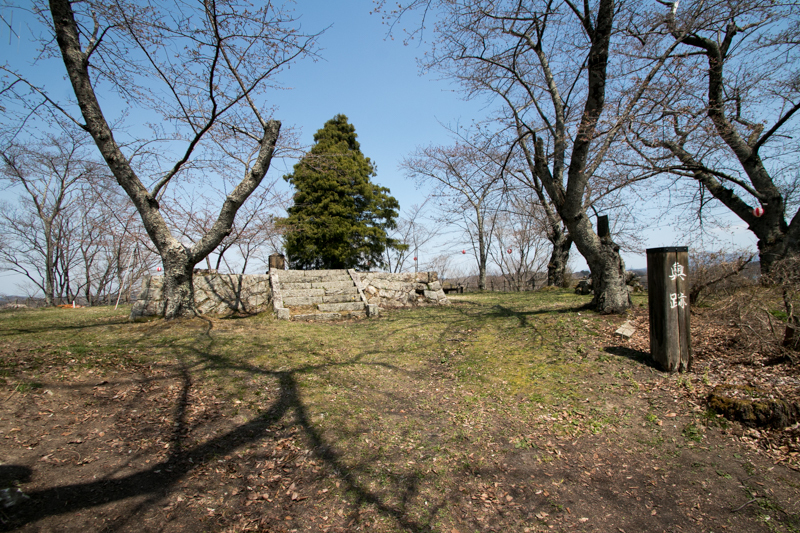 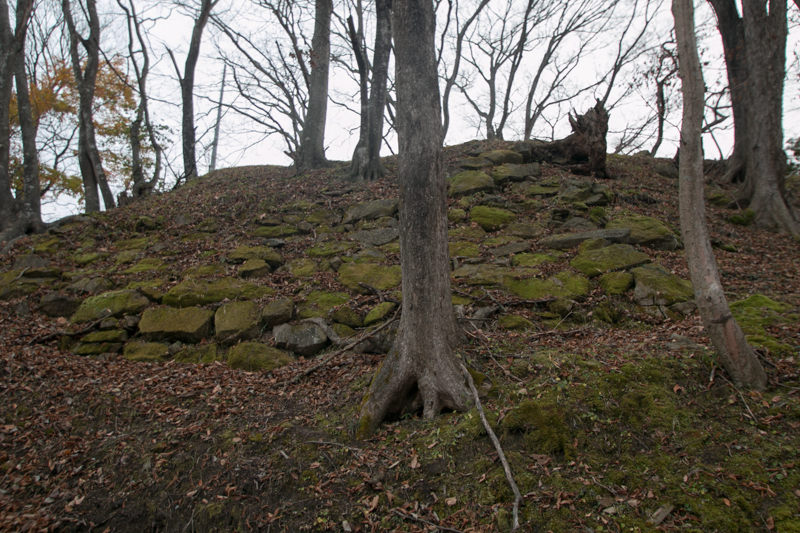 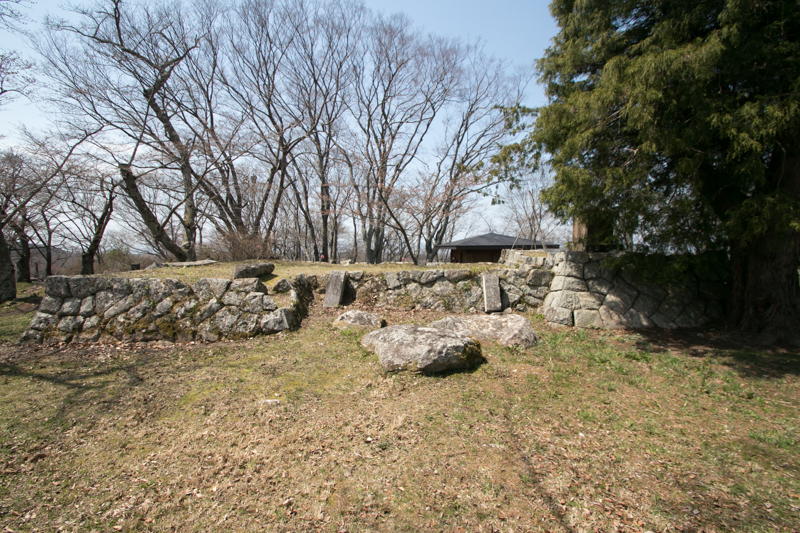 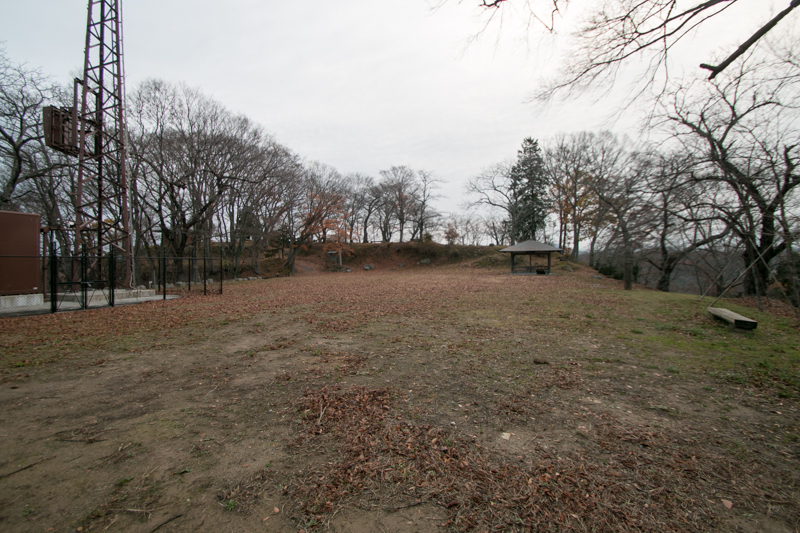 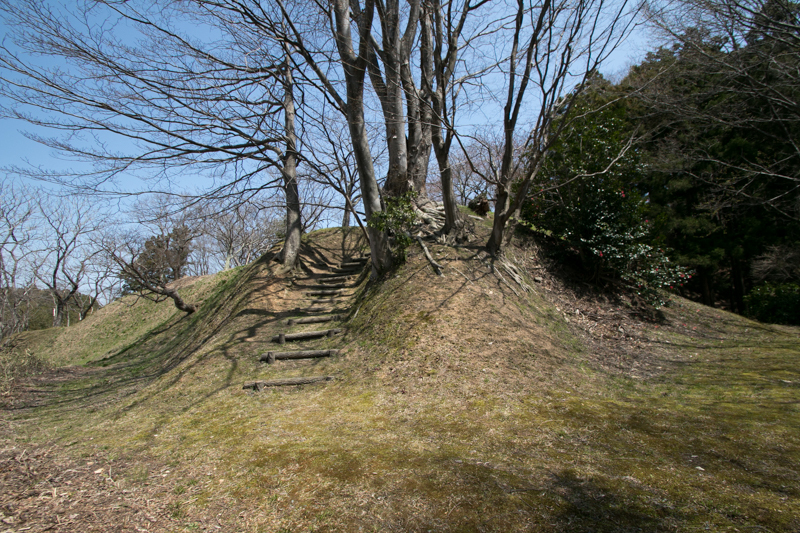 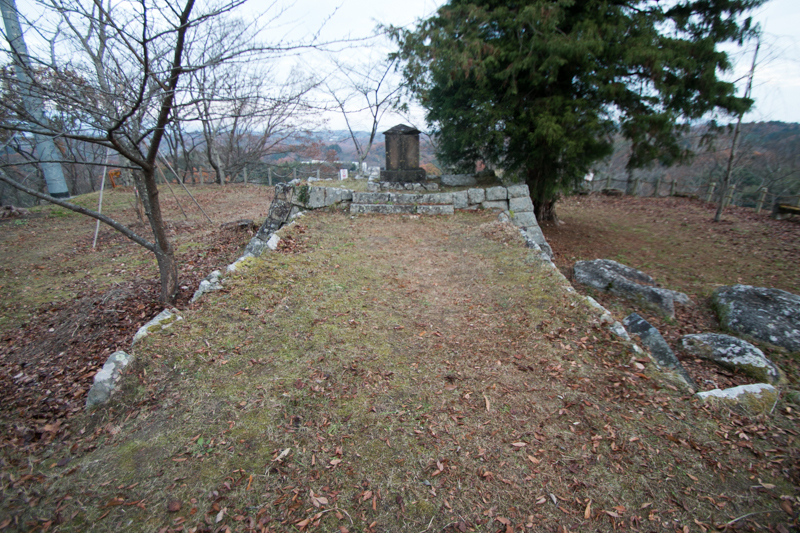 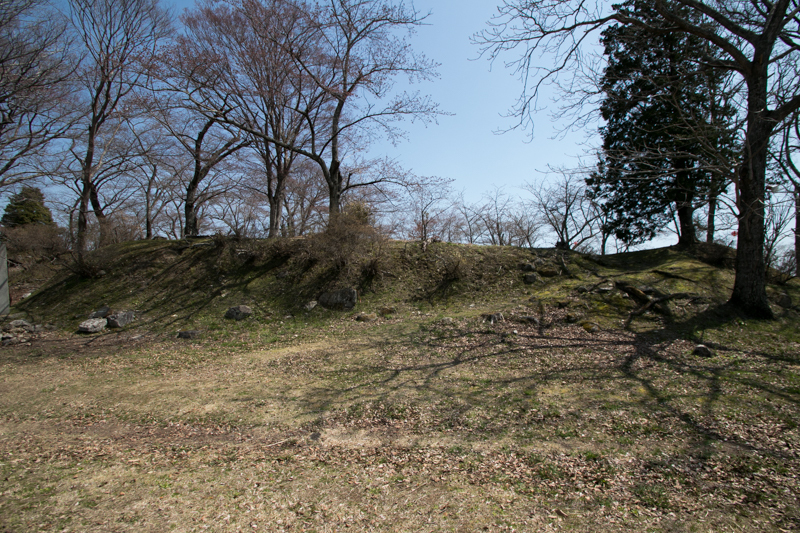 At the upper terrace there might be a hilltop residence of the lord, and at the tip of lower terrace which faces the direction of town there was a three story turret which was the symbol of Miharu castle over the stone wall basement. 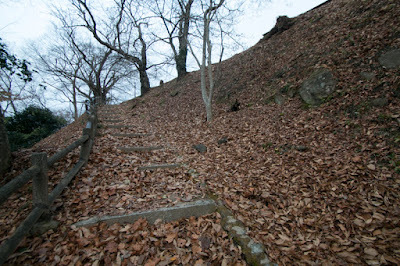 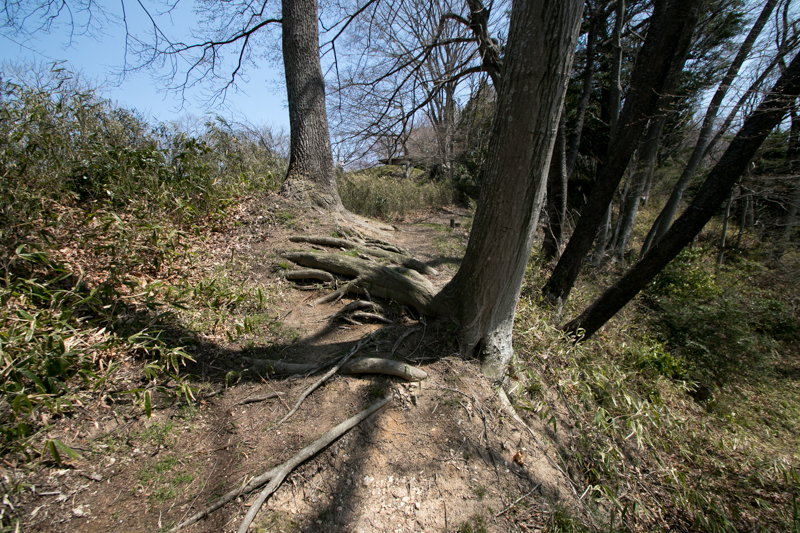 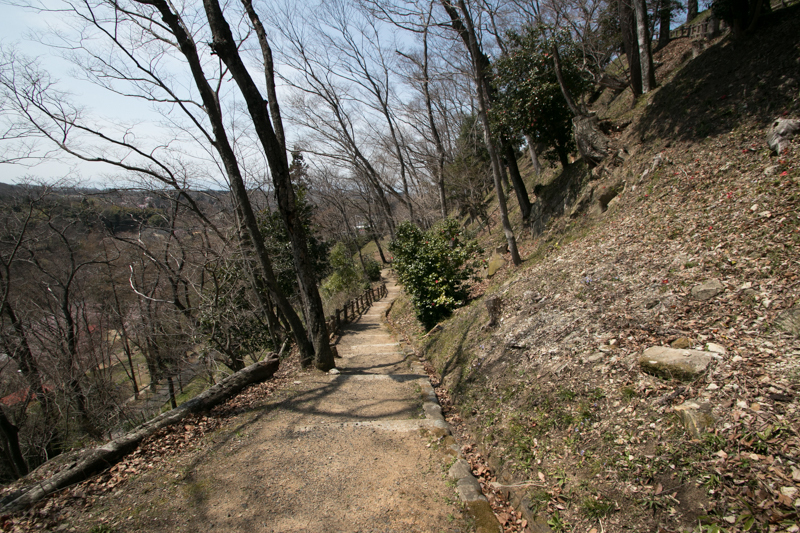 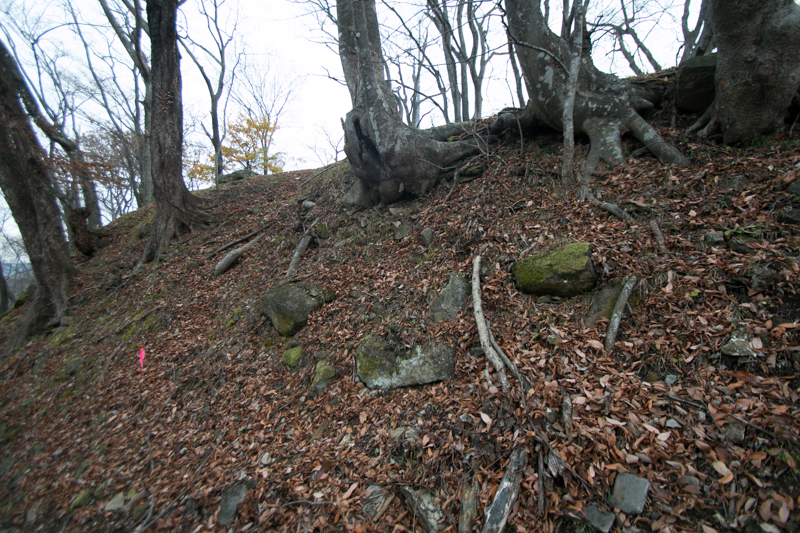 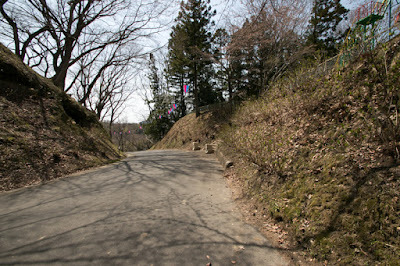 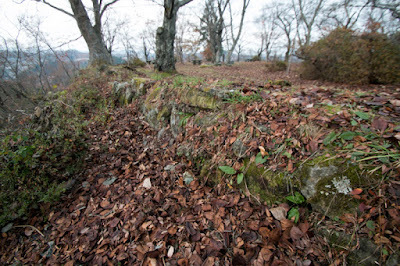 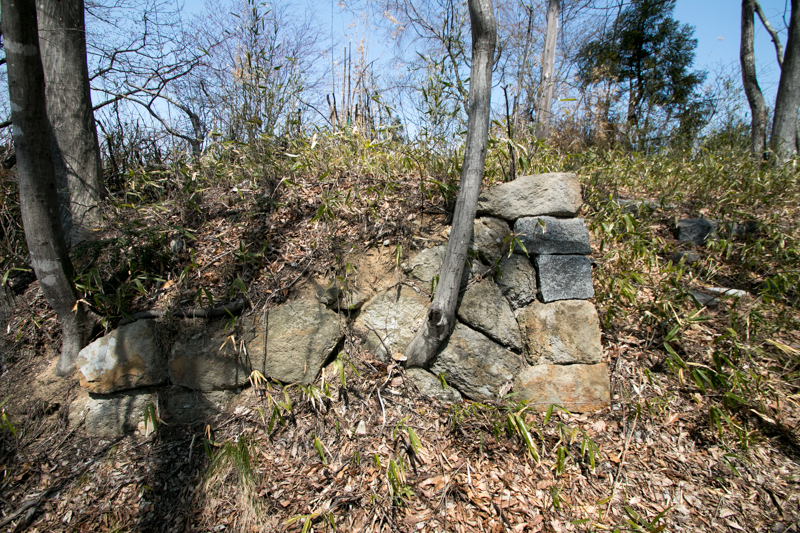 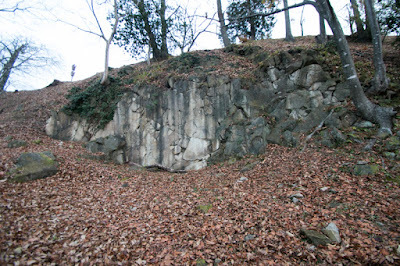 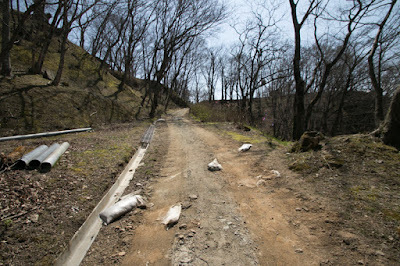 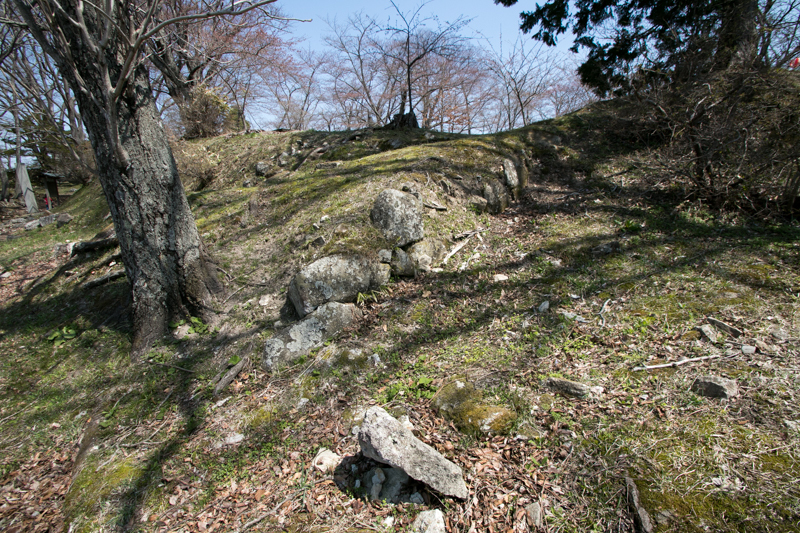 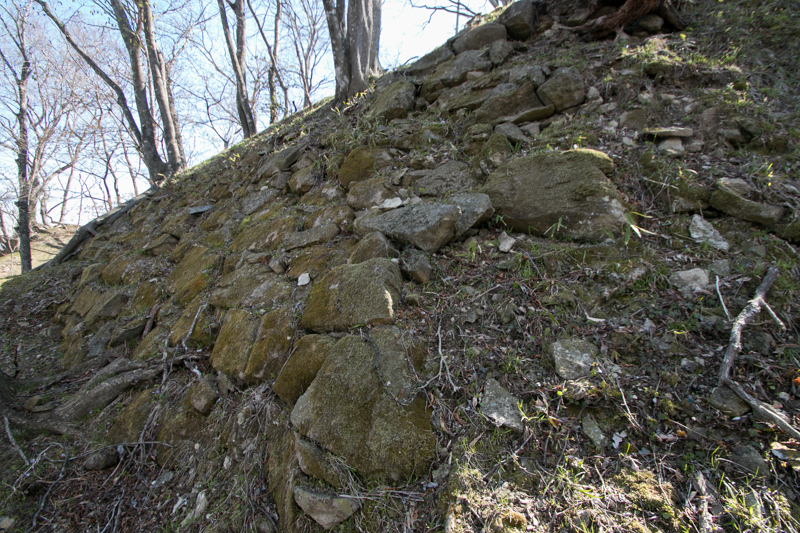 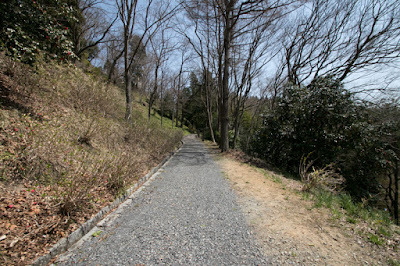 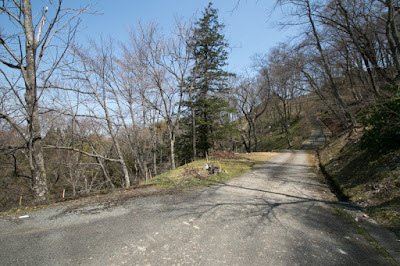 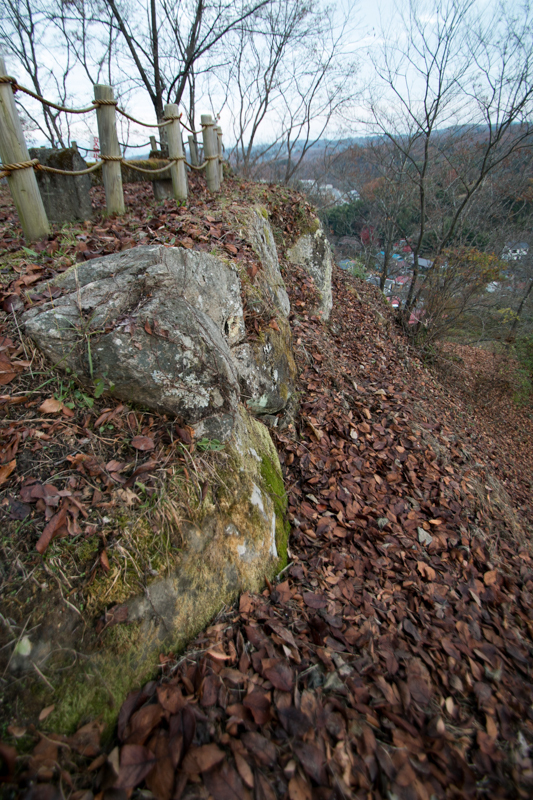 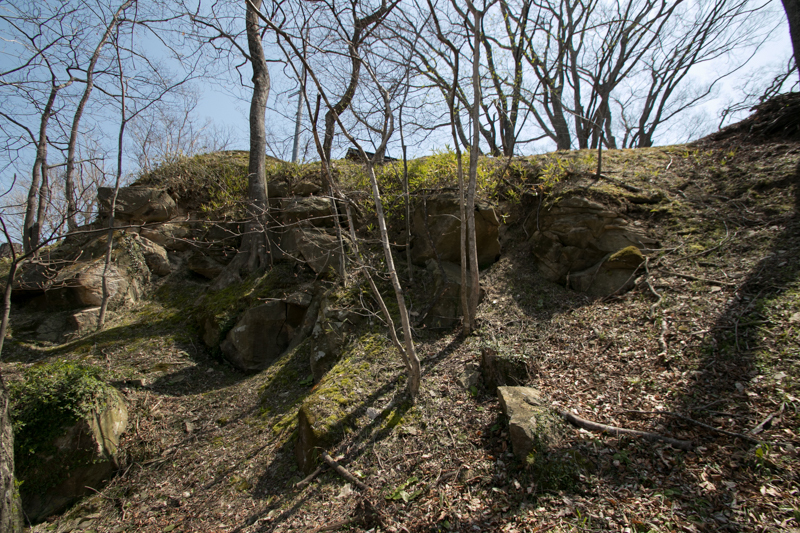 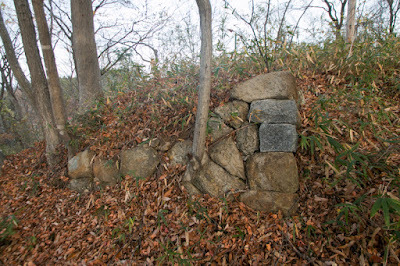 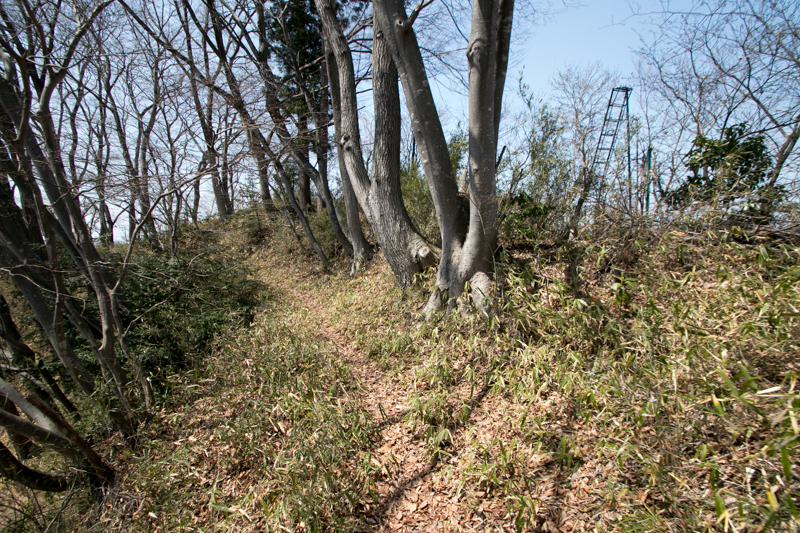 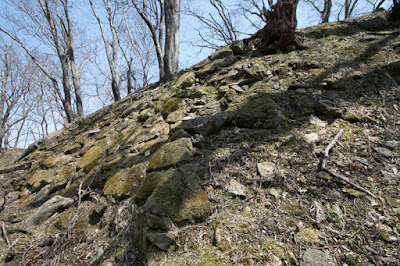 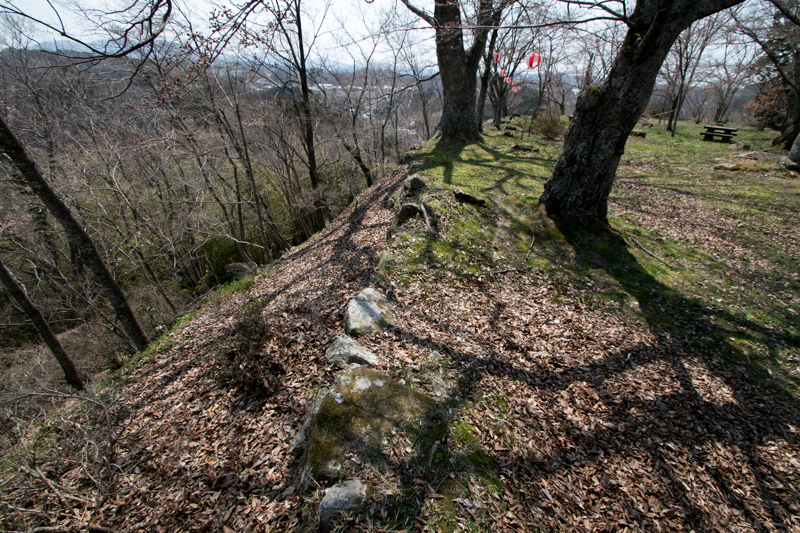 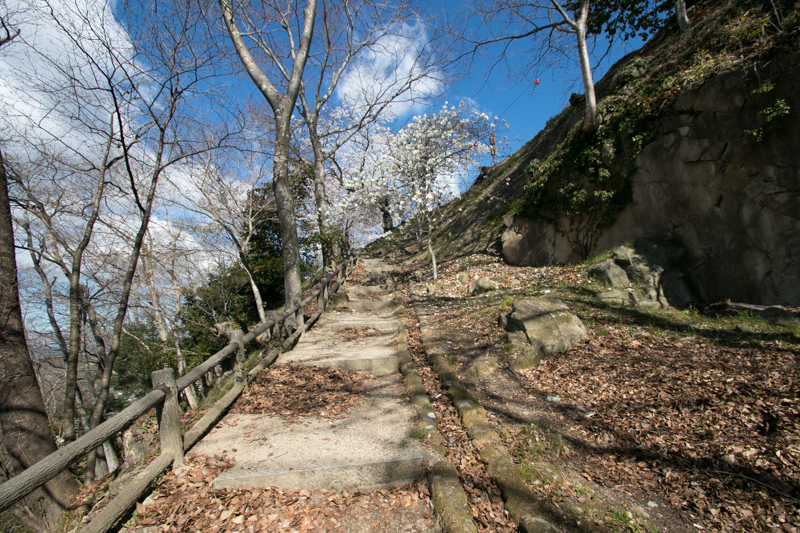 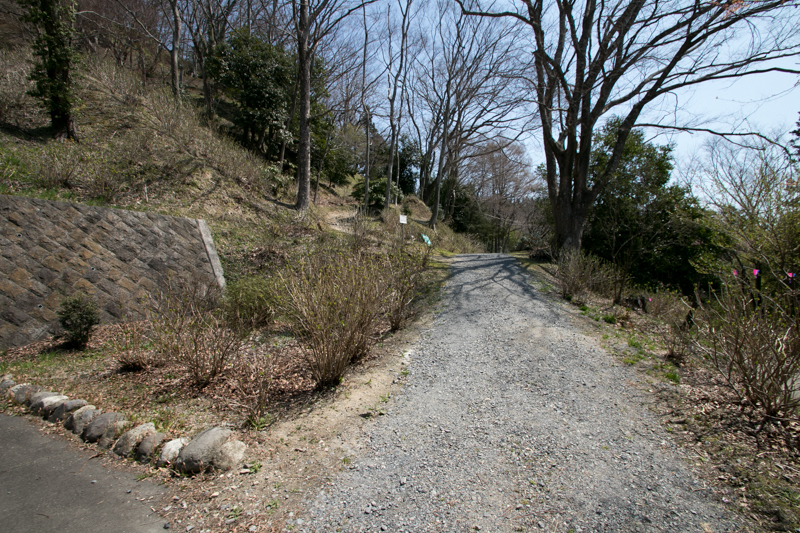 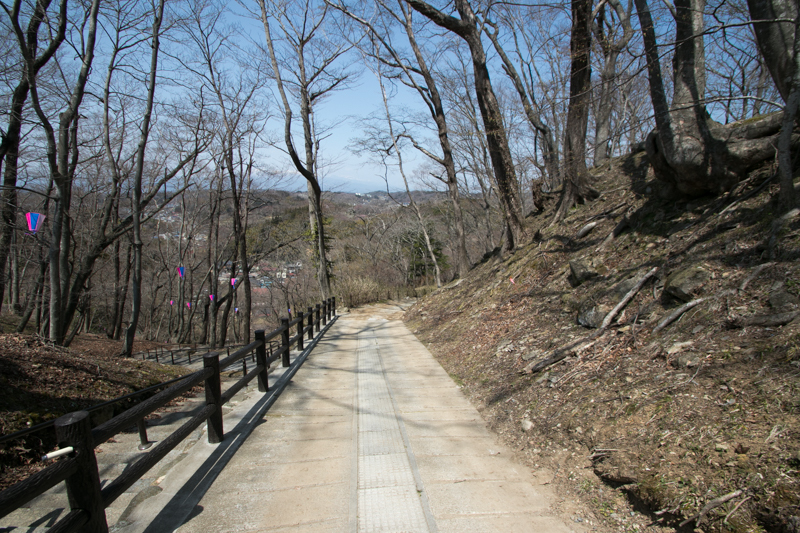 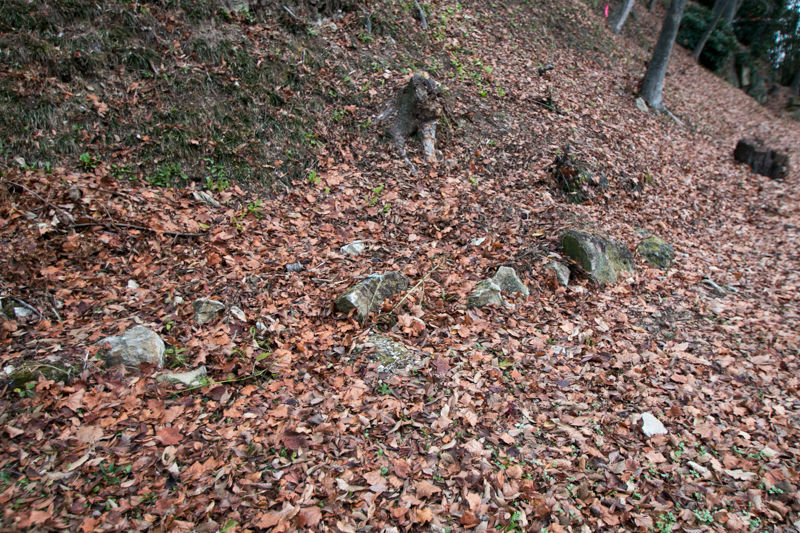 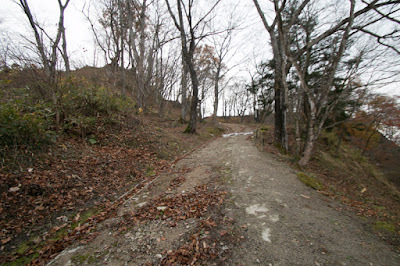 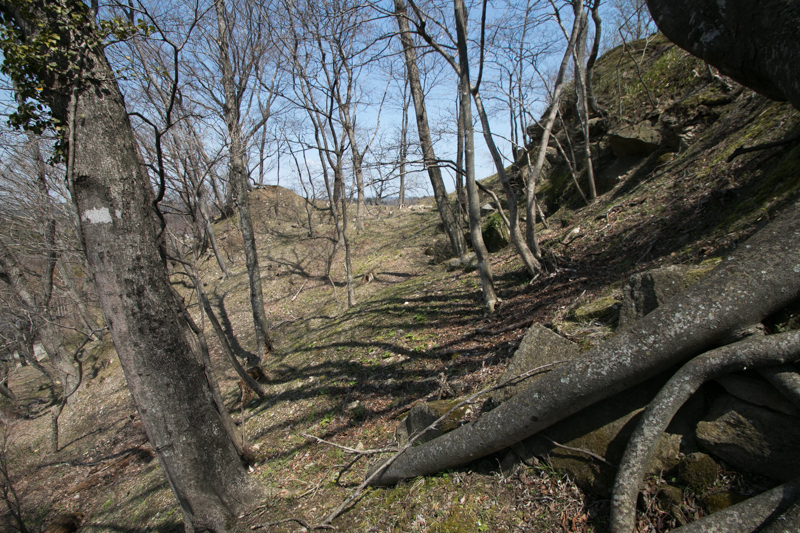 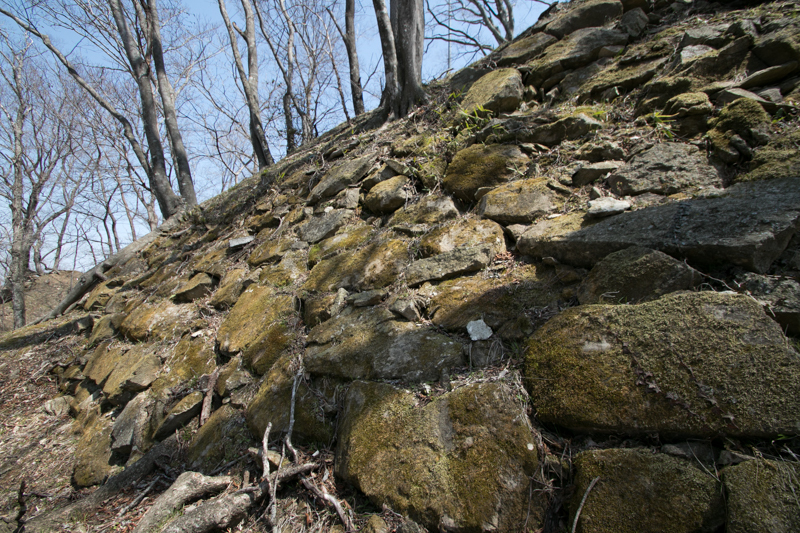 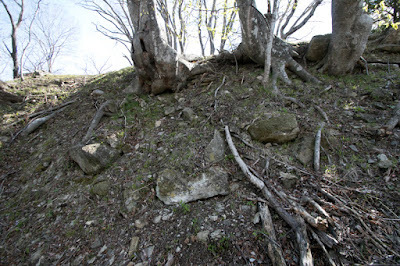 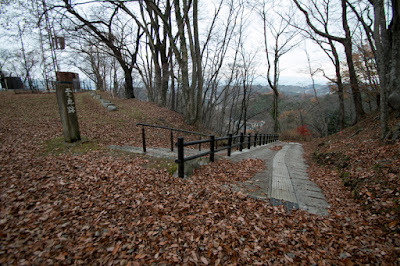 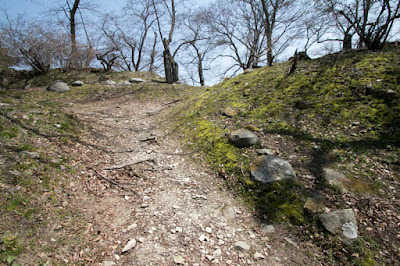 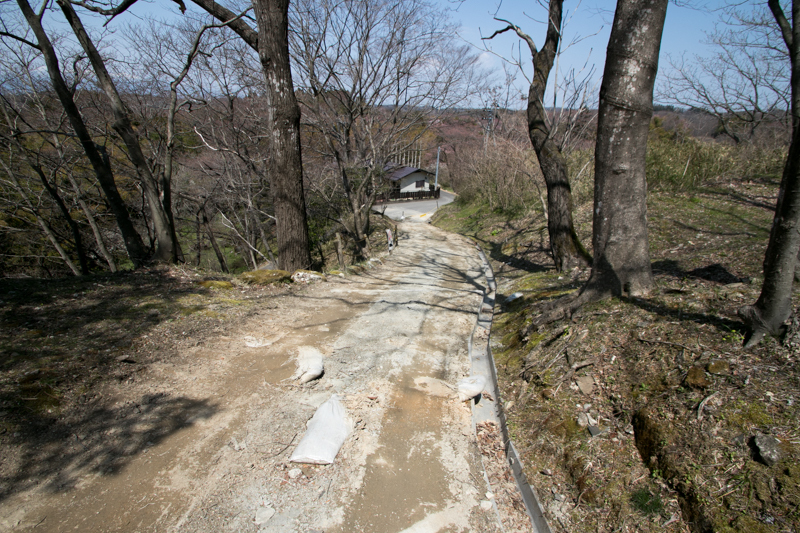 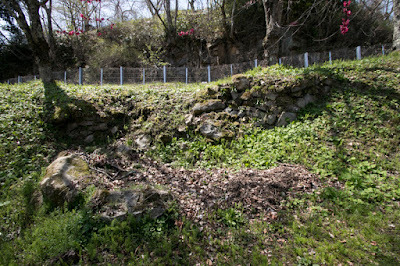 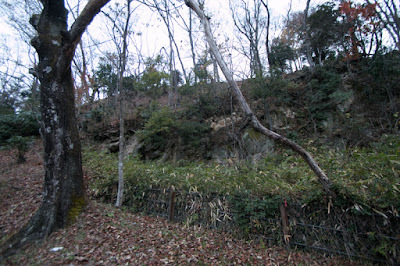 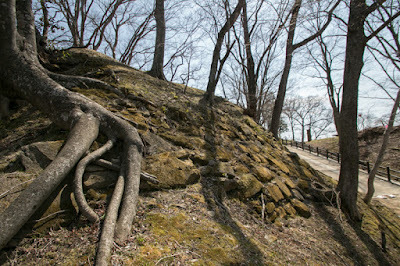 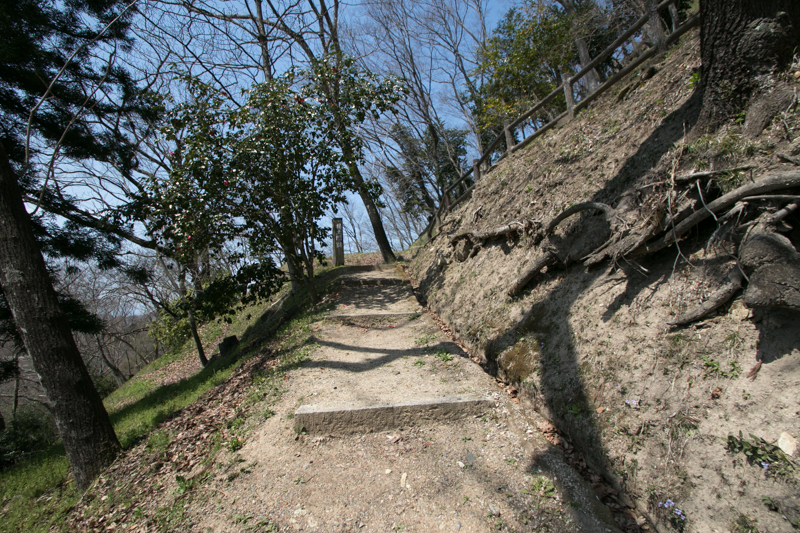 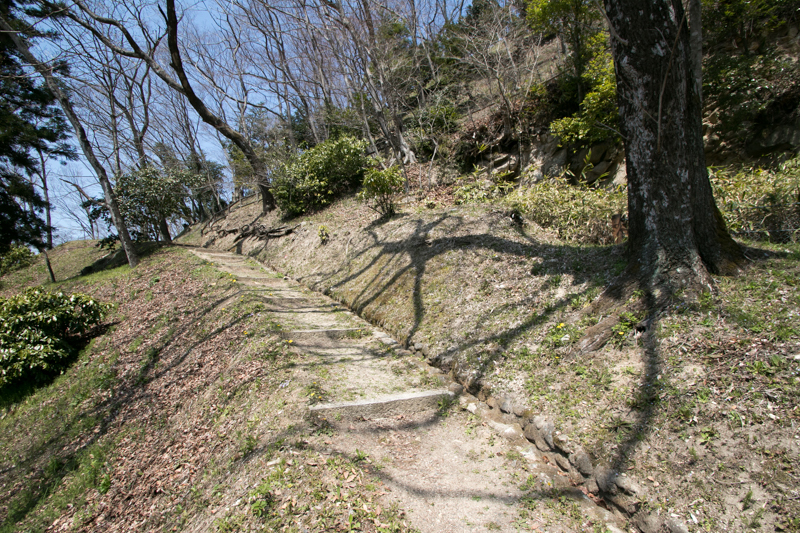 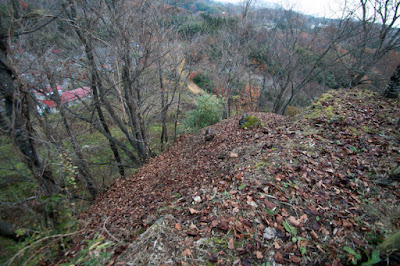 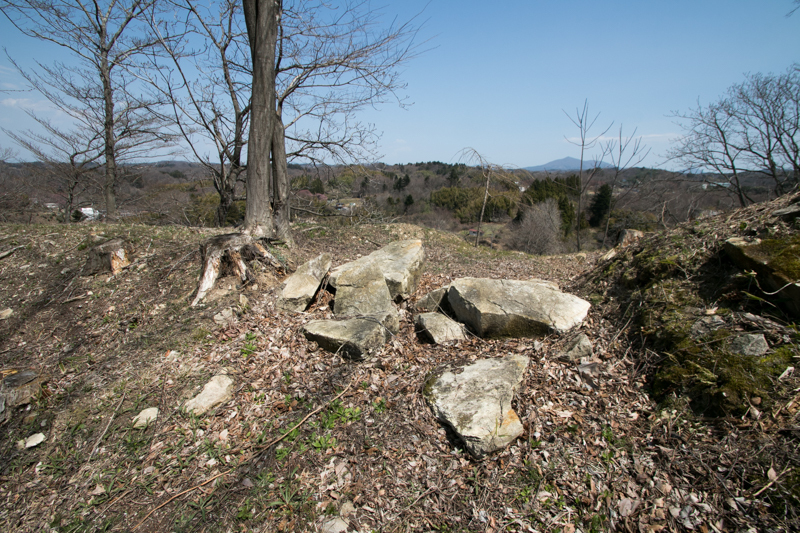 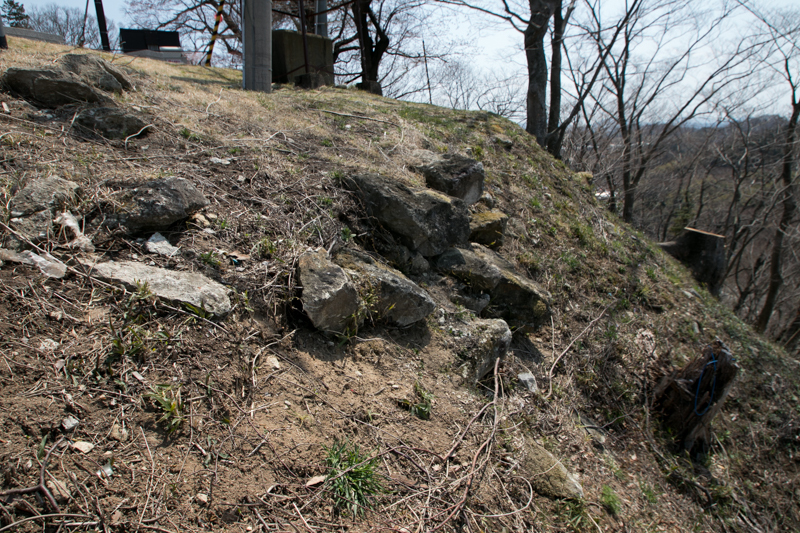 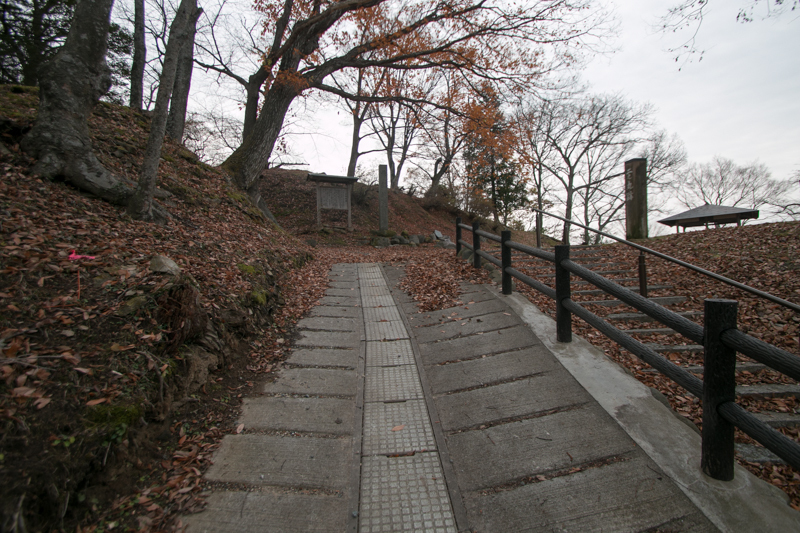 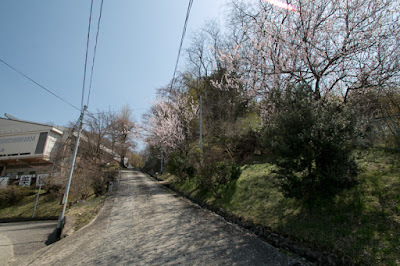 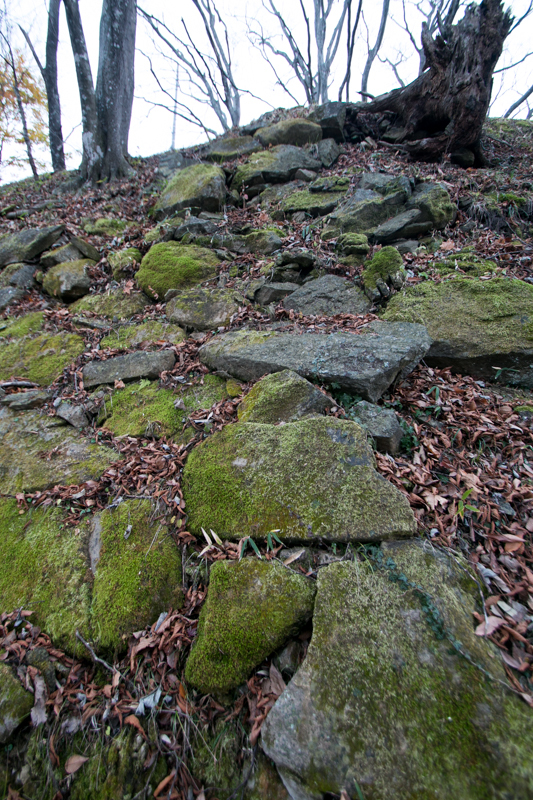 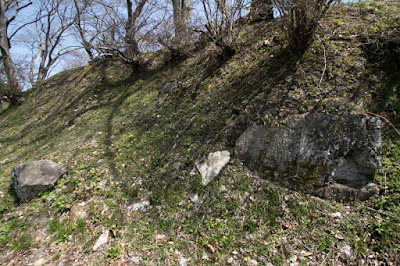 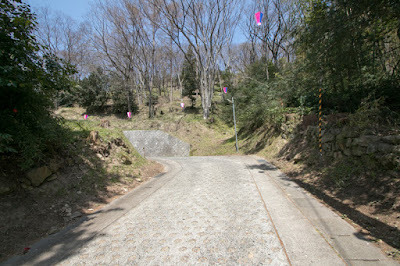 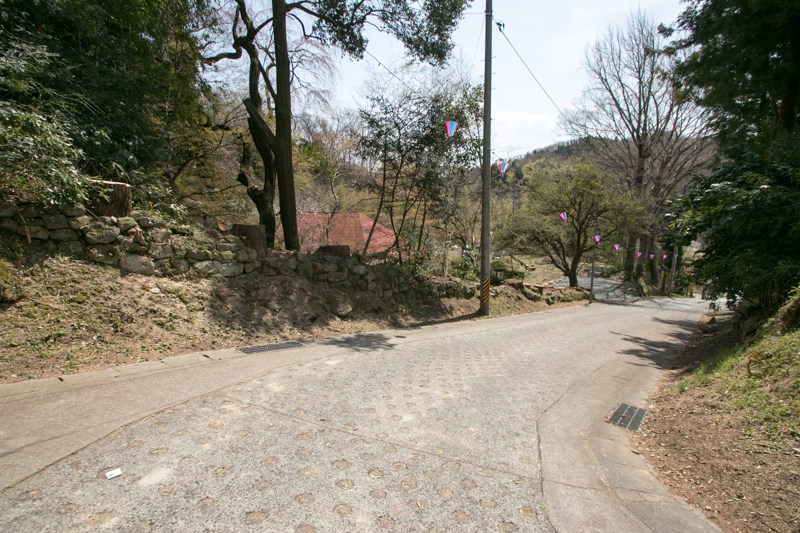 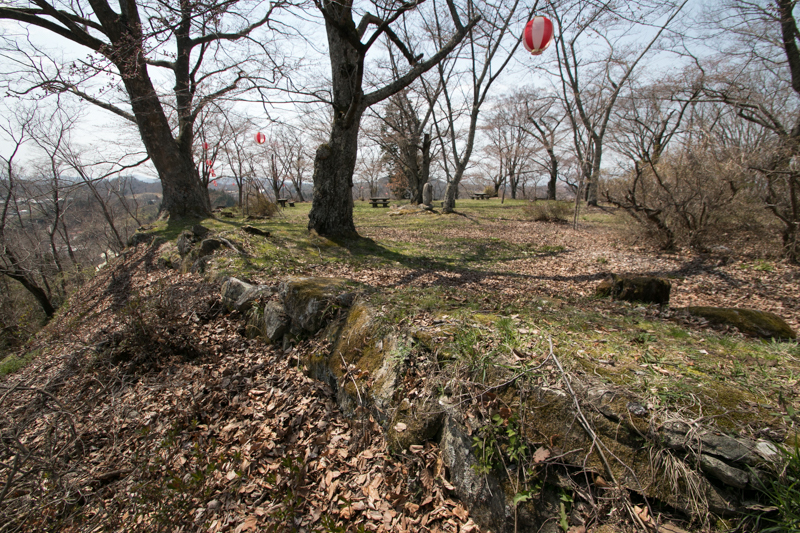 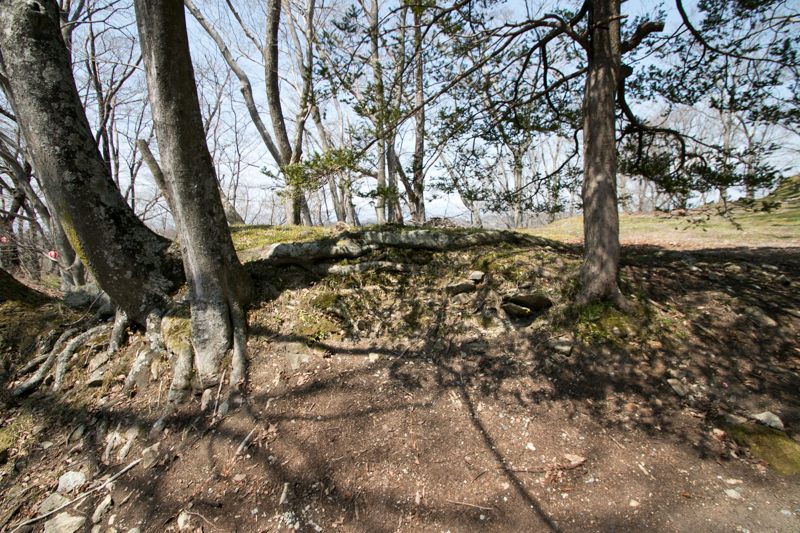 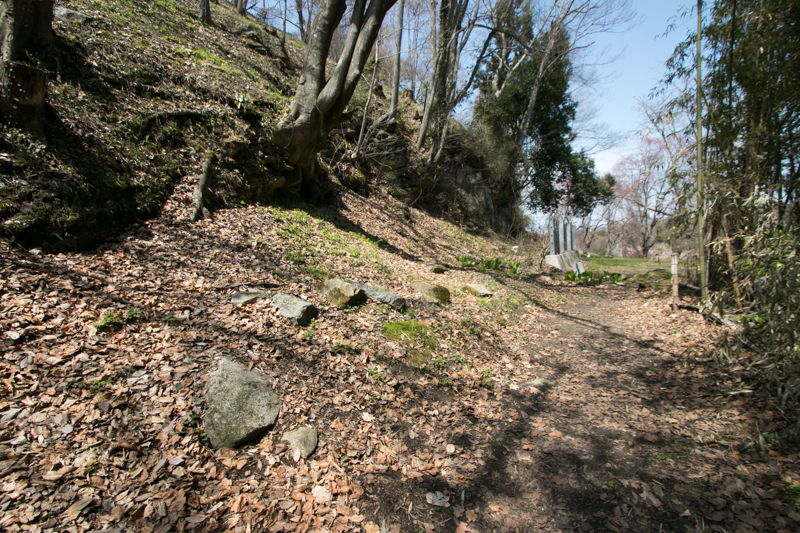 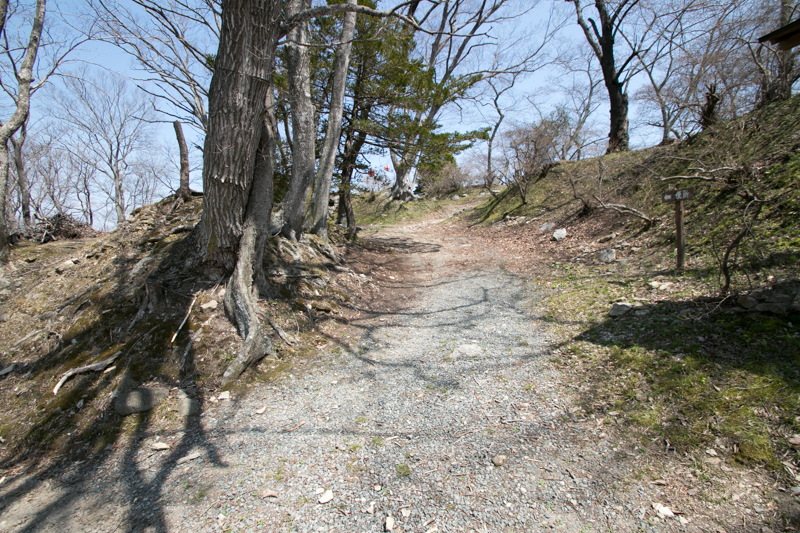 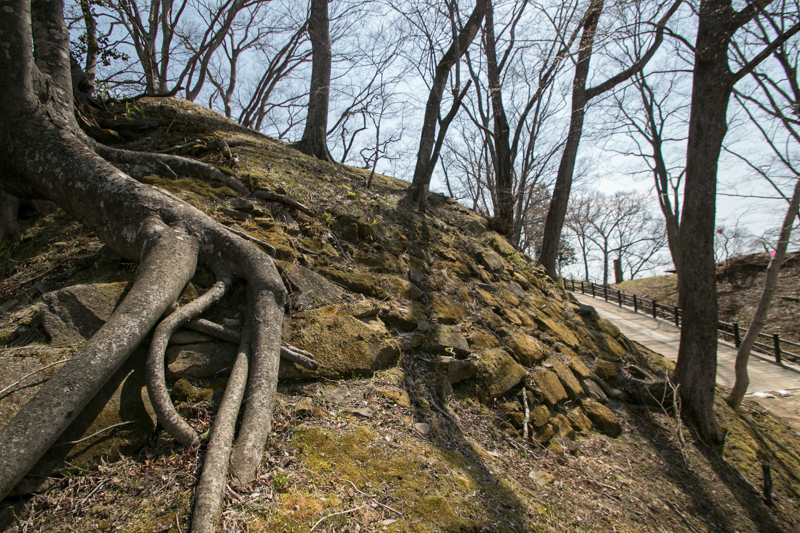 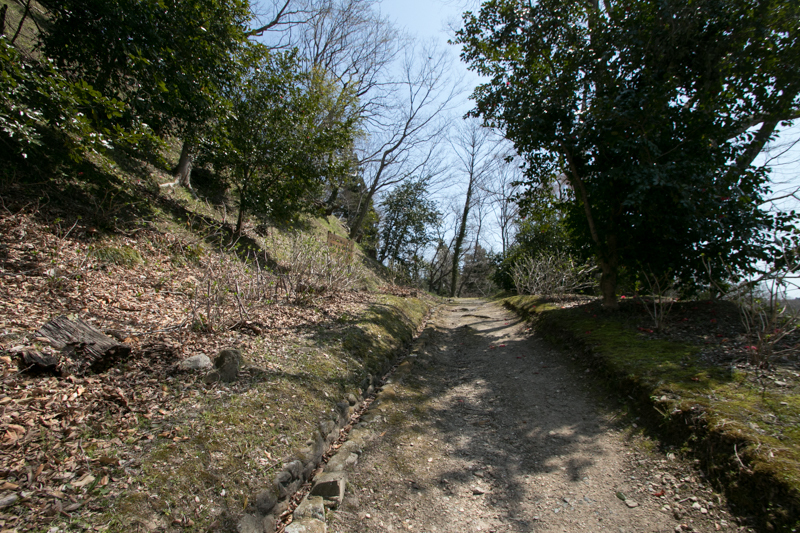 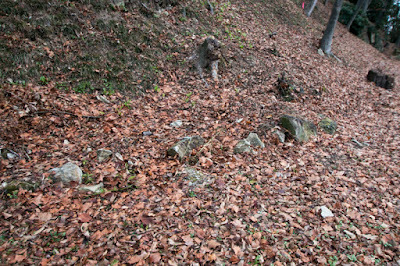 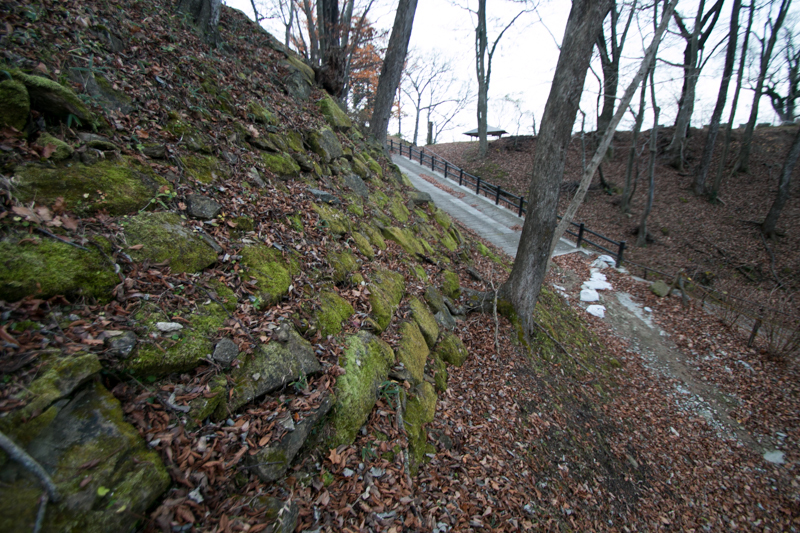 At the climbing up road to hilltop area from northwest ward, a stone wall consist of rough stones might be built at Gamo period still remains. 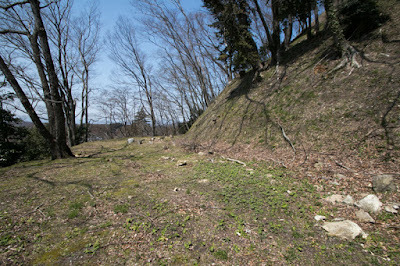 At the lower half of the hill, a gentle ridge spread toward north, west and south east from hilltop, and outer terraces such as secondary area or third area (expressed as East Residence) were built using these ridges. 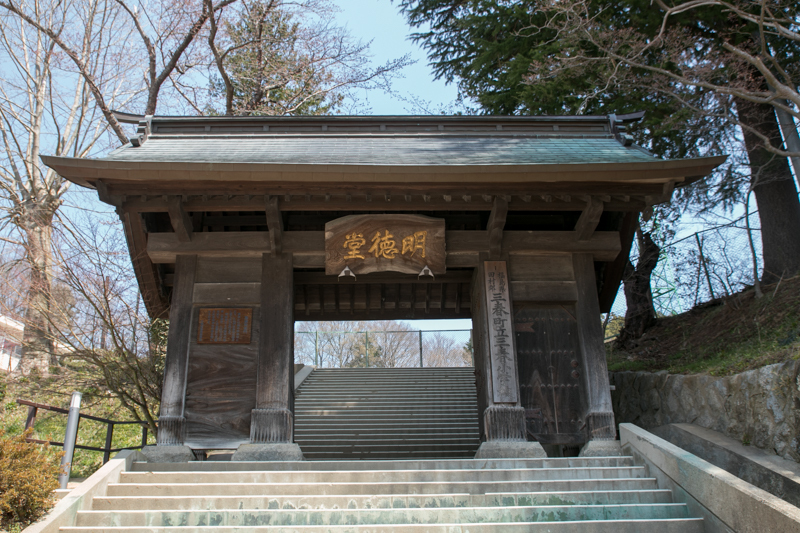 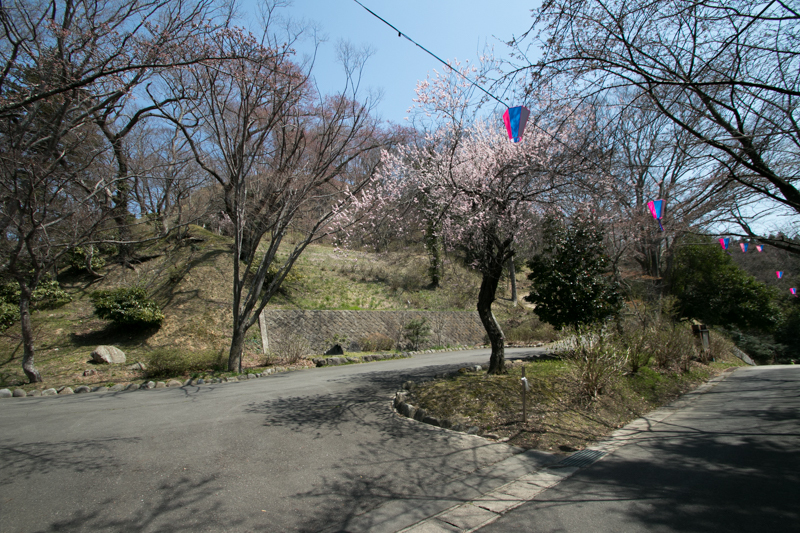 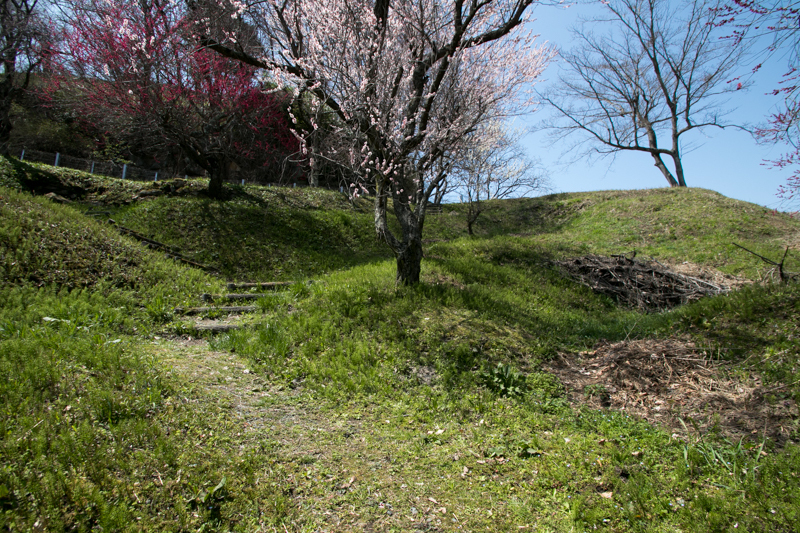 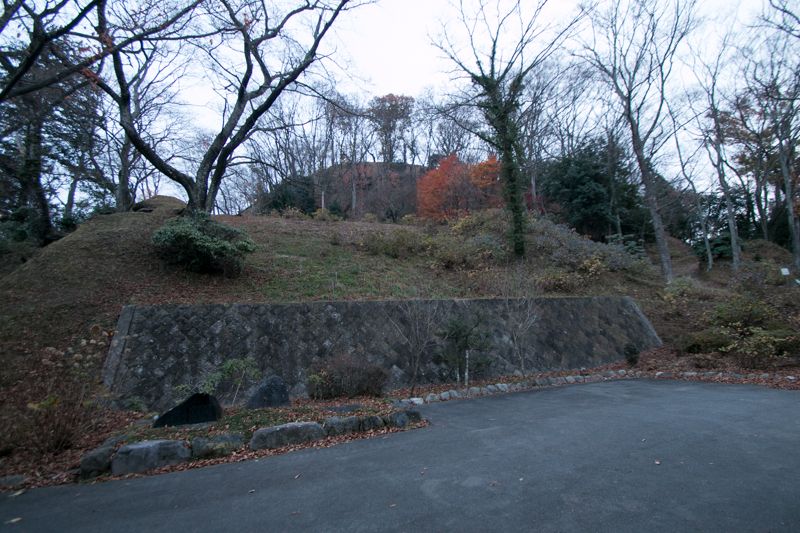 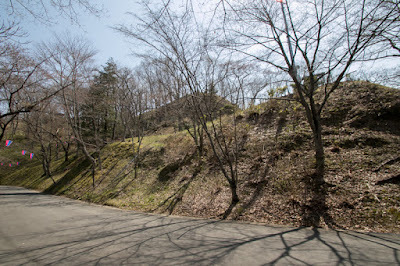 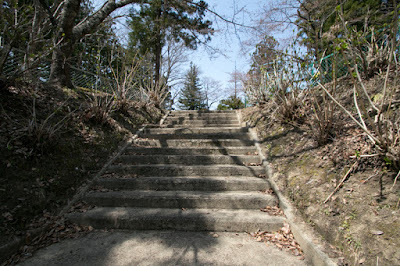 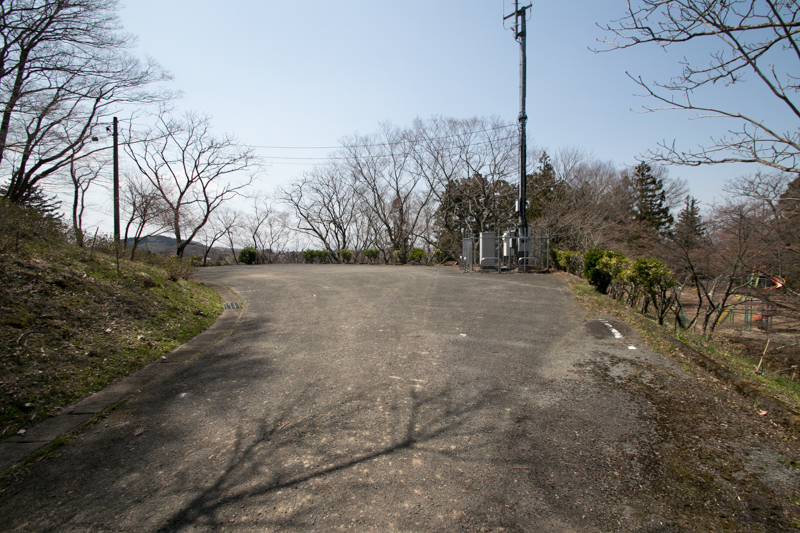 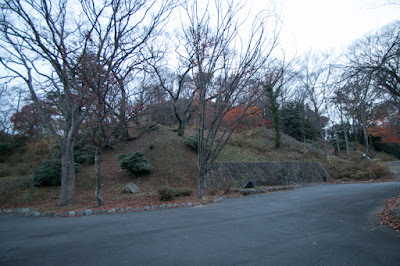 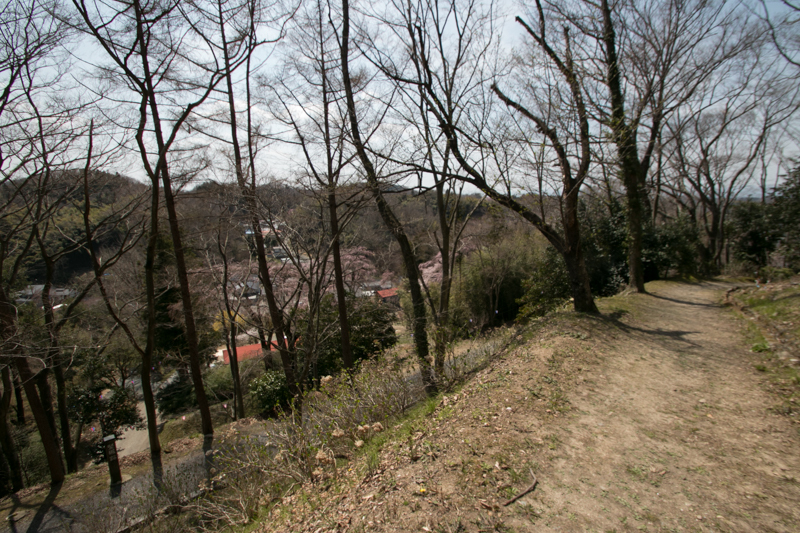 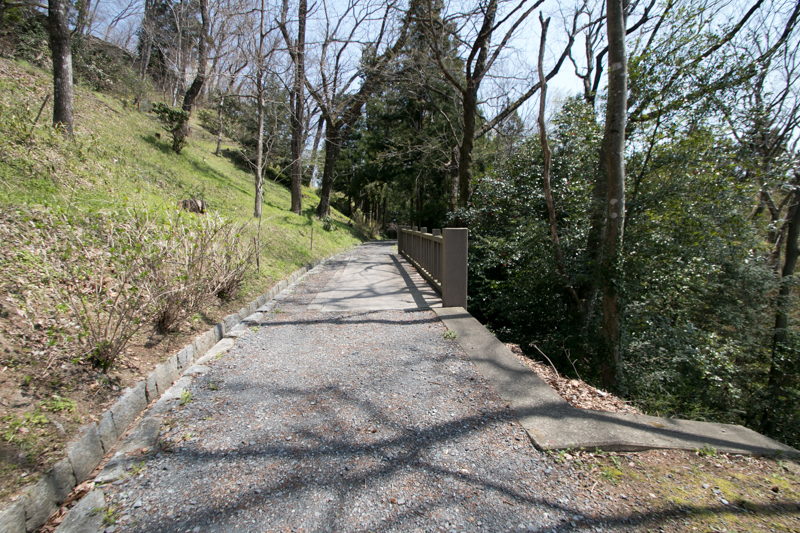 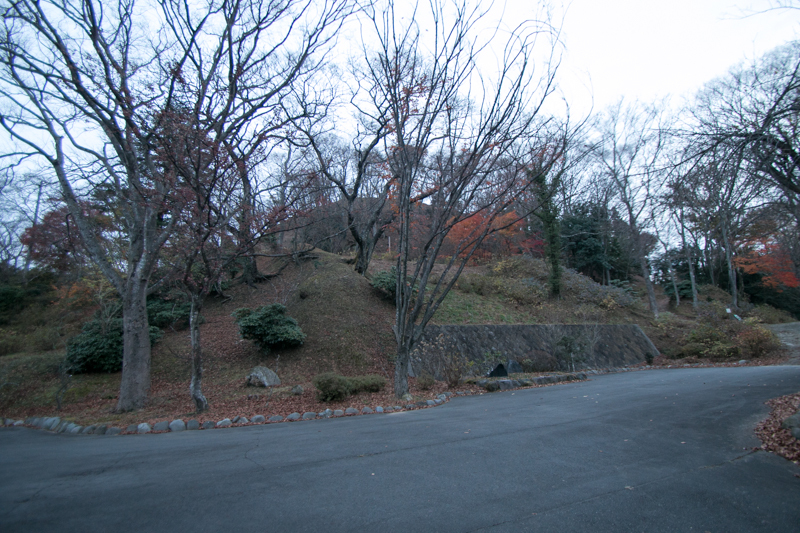 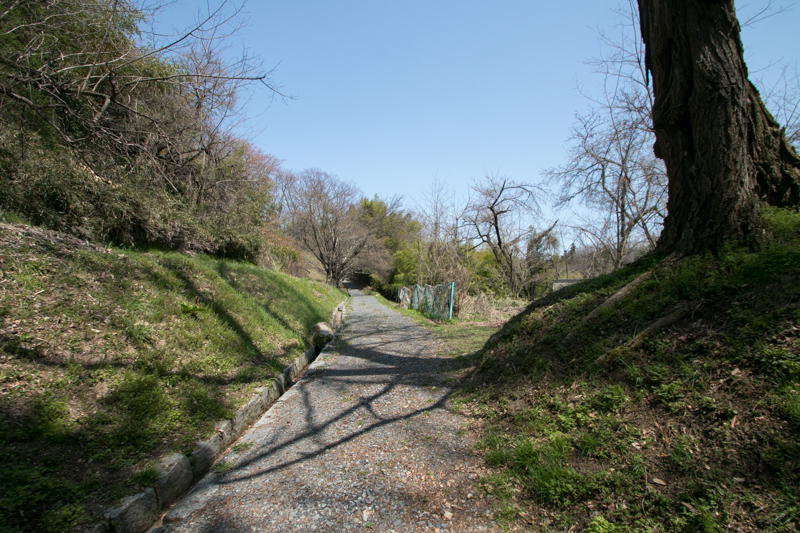 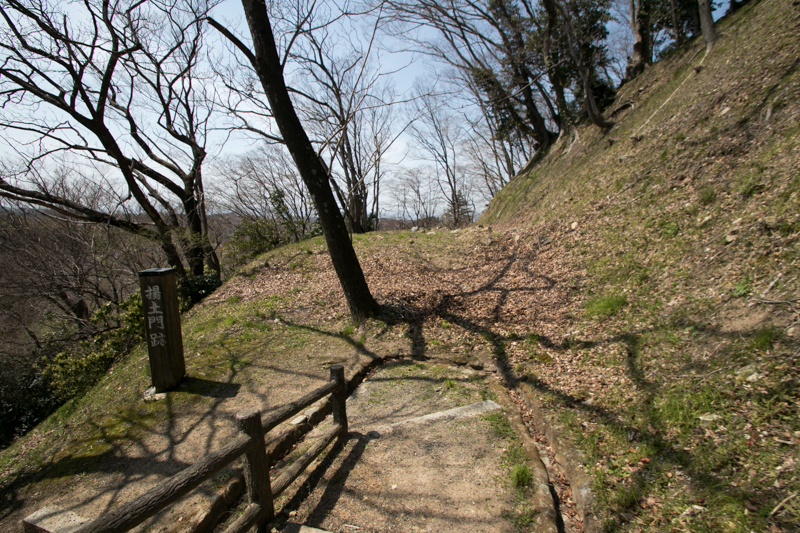 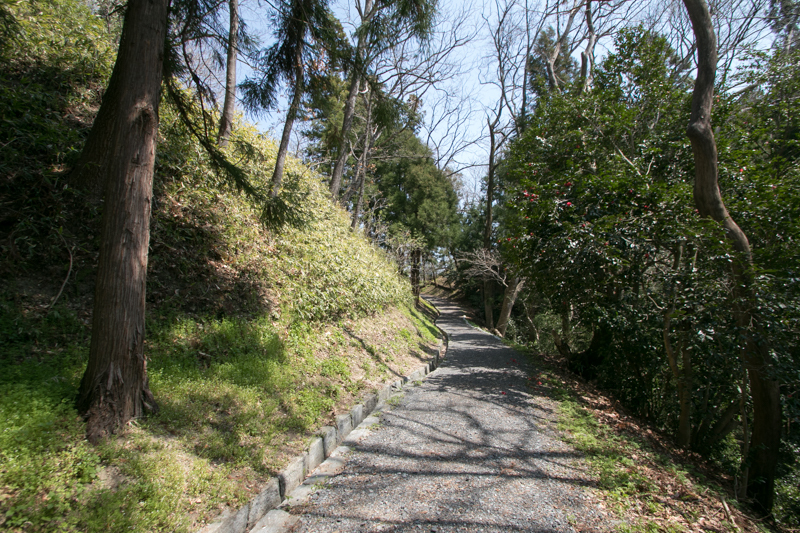 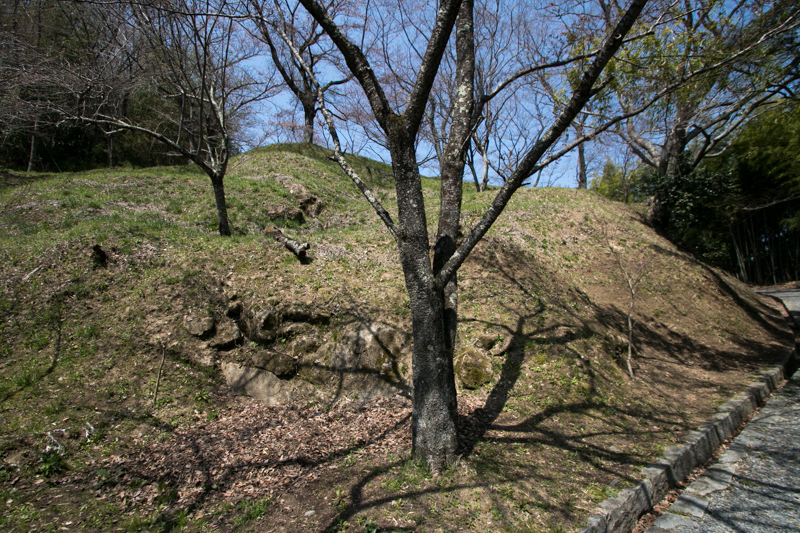 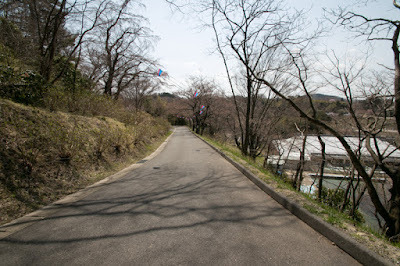 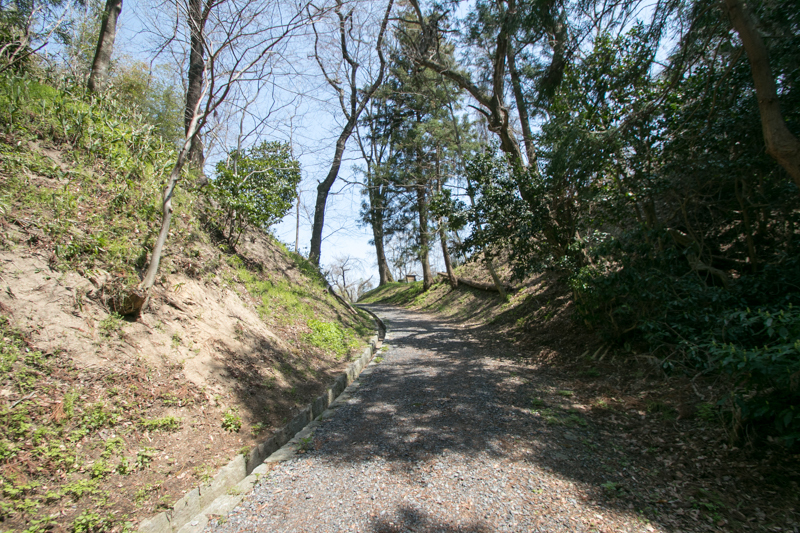 The main entrance of the castle existed at south slope of the hill, at the next of residence of the lord where is used as a ground of elementary school now. 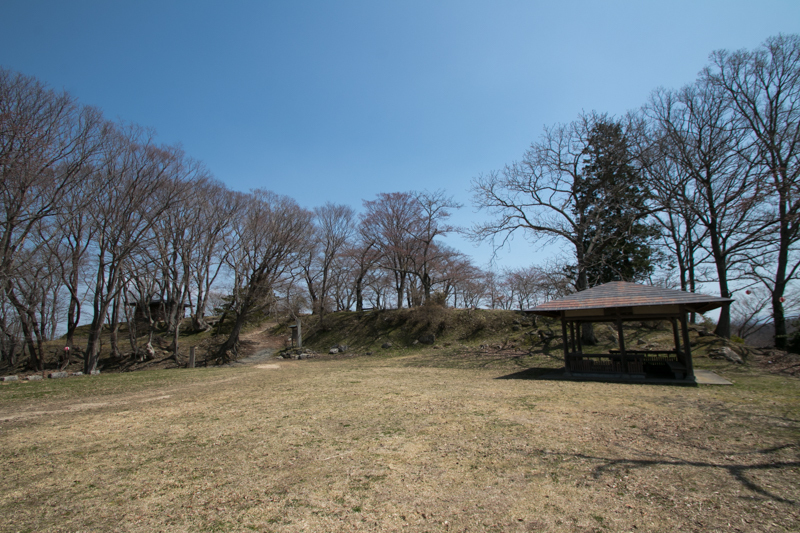 Total size of the castle is about 300 meter long and 200 meter wide then this castle was not so large castle compared with the territory of Tamura clan. 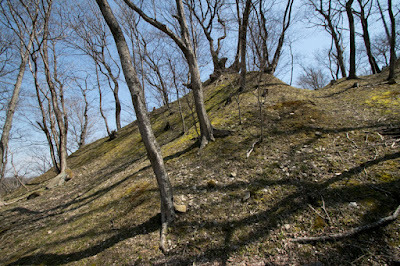 But pointed shape hill is striking looked up from hillside, and the shape of the castle with buildings stands together at the tip of corned shaped hill might be seen as a castle of hermit described in ink painting of ancient China. Compared with militant style of neighbor castles such as Nihonmatsu castle or Shirakawa castle totally renovated as latest military fortresses, Miharu castle kept original style in medieval era and seems calm. 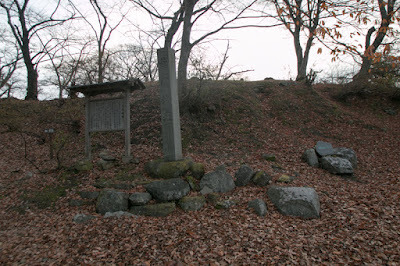 After the death of Ujisato Gamo in 1595, Kagekatsu Uesugi (1556-1623) was appointed as a lord of current Fukushima prefecture by Toyotomi government. 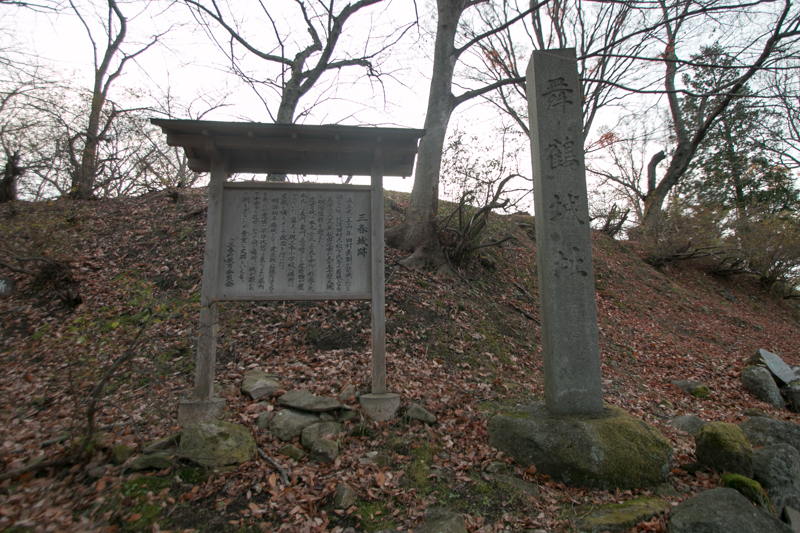 But after the death of Hideyoshi Toyotomi, as a result of the battle of Sekigahara, Uesugi clan lost the territory in Fukushima prefecture. 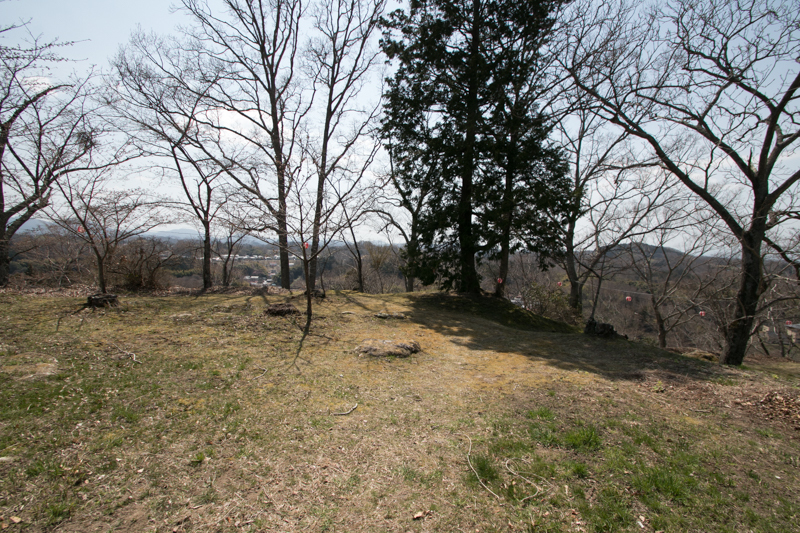 After a short recovery of Gamo clan, Kato clan once became the lord of Miharu castle along with Aizu Wakamatsu castle, but next year Miharu area became an independent domain and Matsushita clan became the lord. 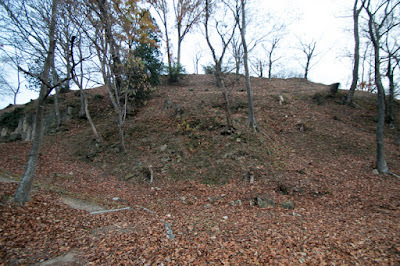 In 1645, Akita clan was transferred from Shishido domain of Hitachi province (Ibaraki prefecture) to Miharu castle and became the lord of Miharu domain. 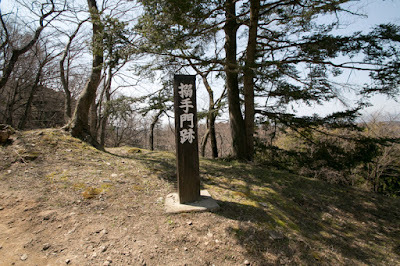 Akita clan was originally a descendant of Ando clan, which held large territory at Japan Sea coast of Tohoku region from current Akita area toward Oshima peninsula of Hokkaido island. Akita clan once survived as a lord of Dewa province (Akita prefecture) under Toyotomi government, but after the battle of Sekigahara in 1600, as a result of dispute with Mogami clan which was the lord of Dewa province (Yamagata prefecture) Akita clan lost former territory and fell into a small lord. 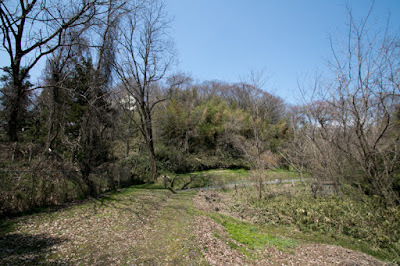 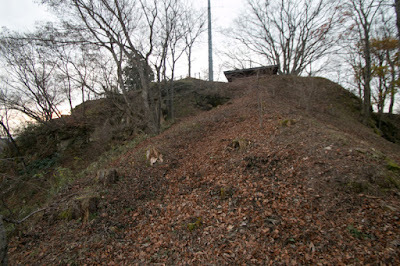 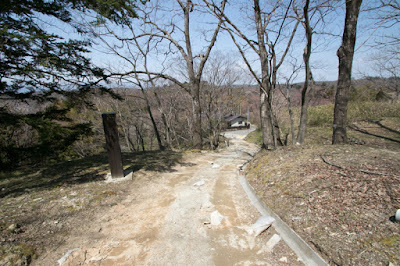 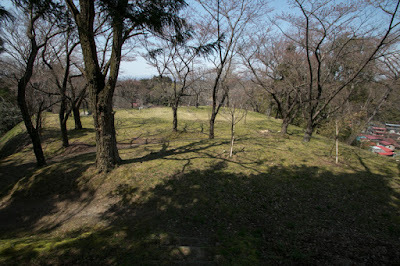 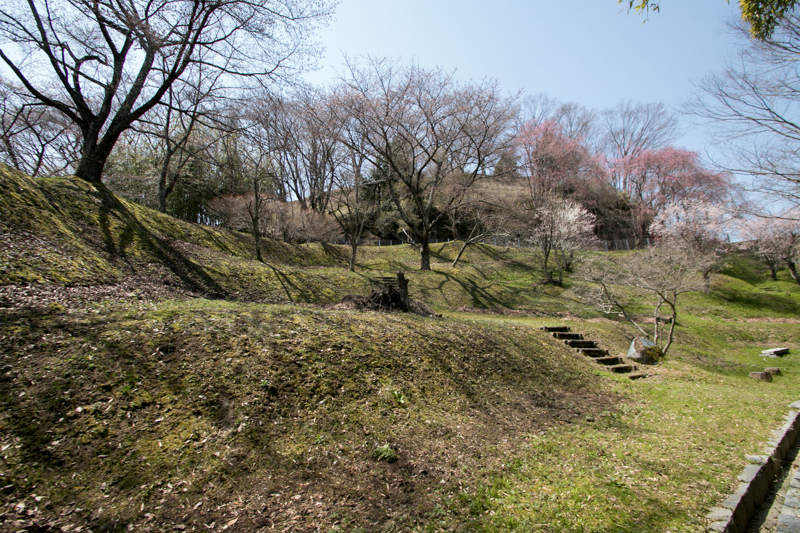 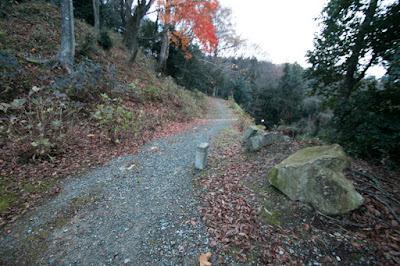 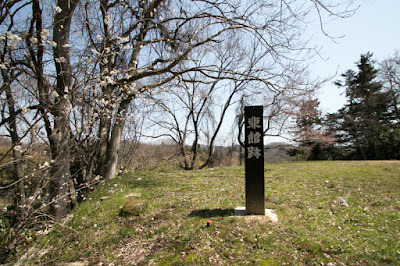 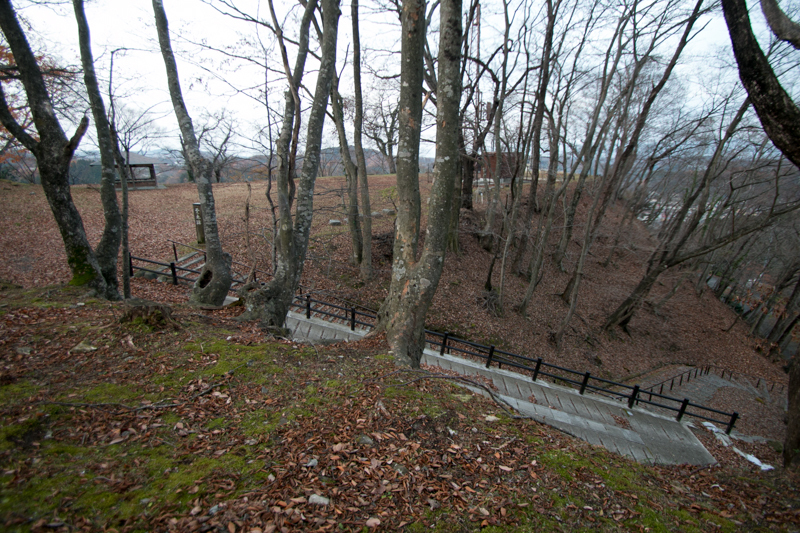 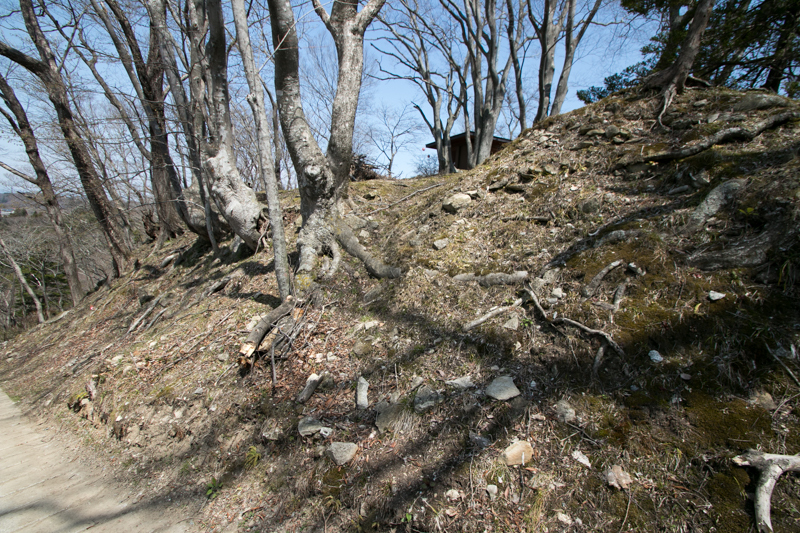 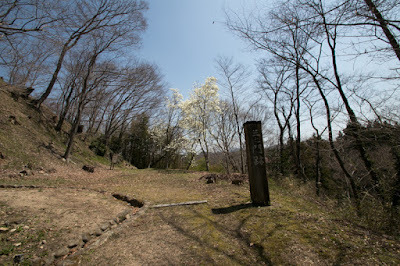 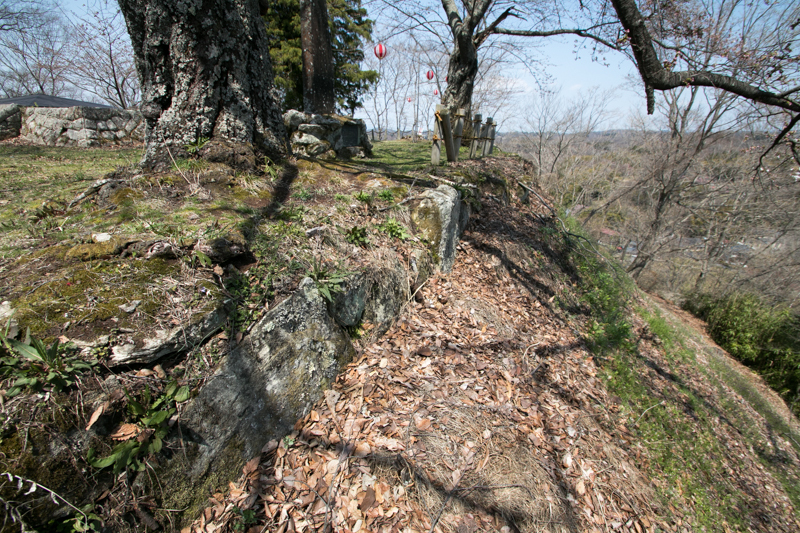 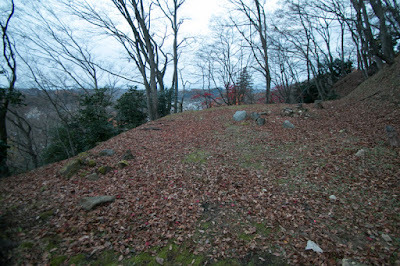 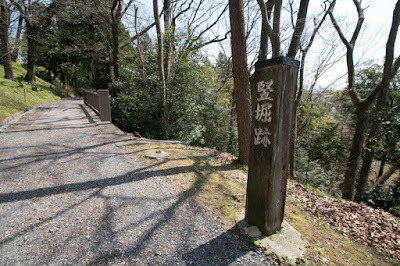 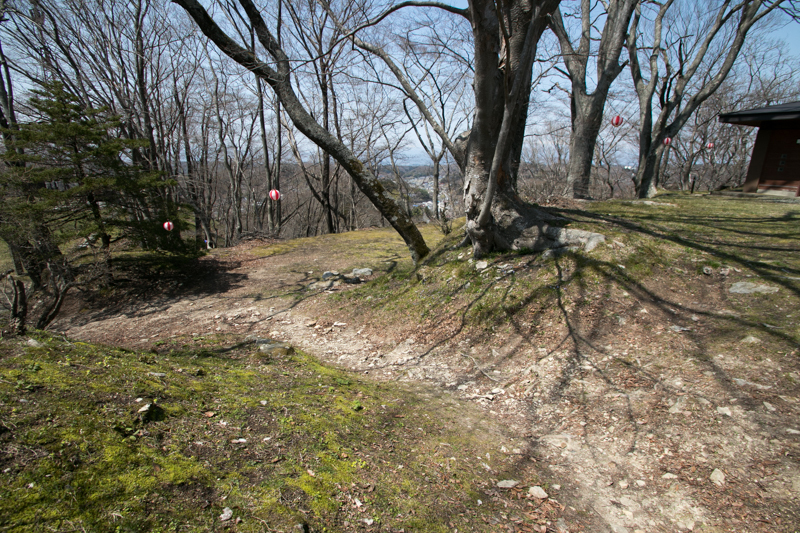 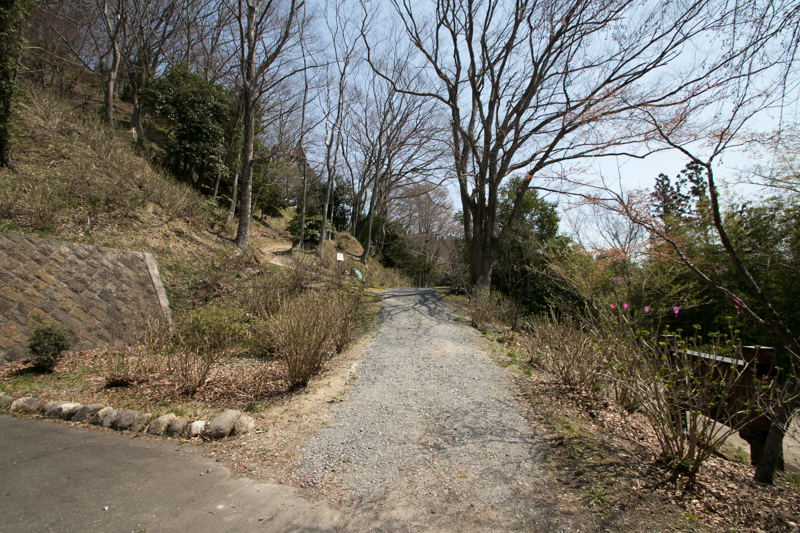 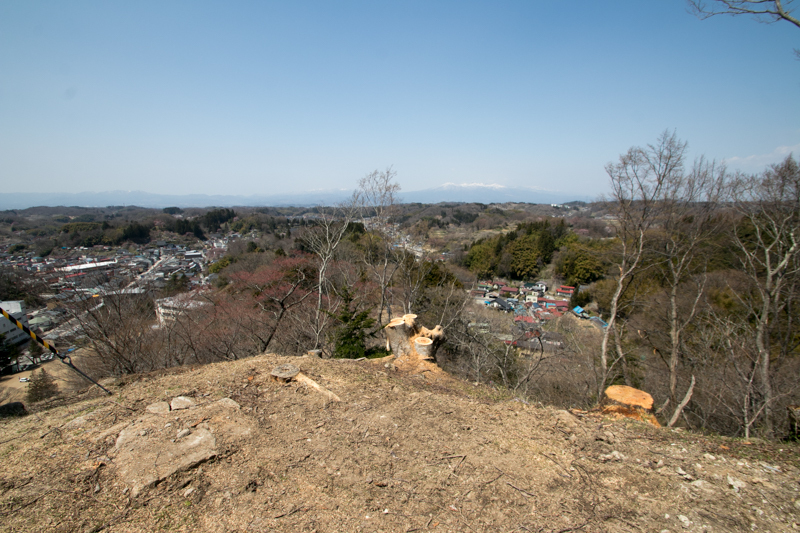 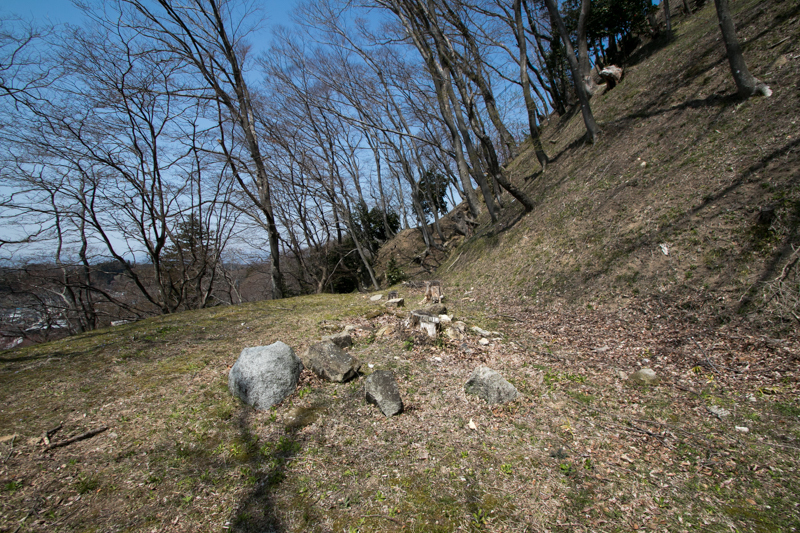 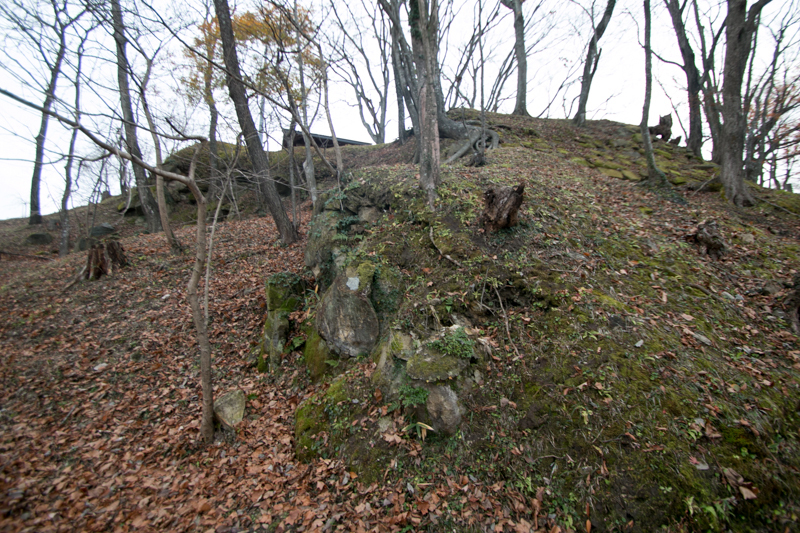 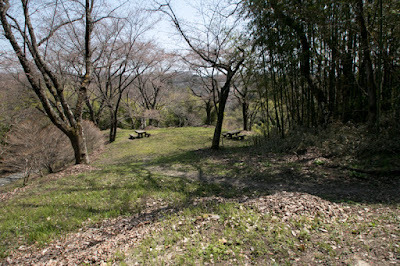 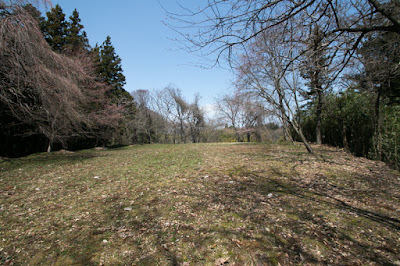 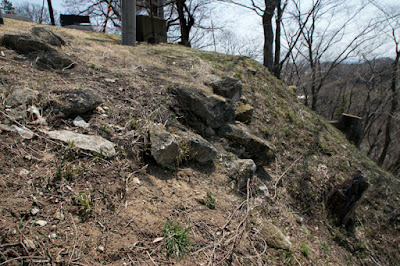 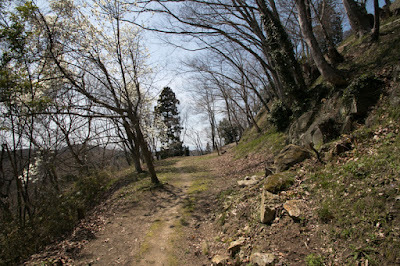 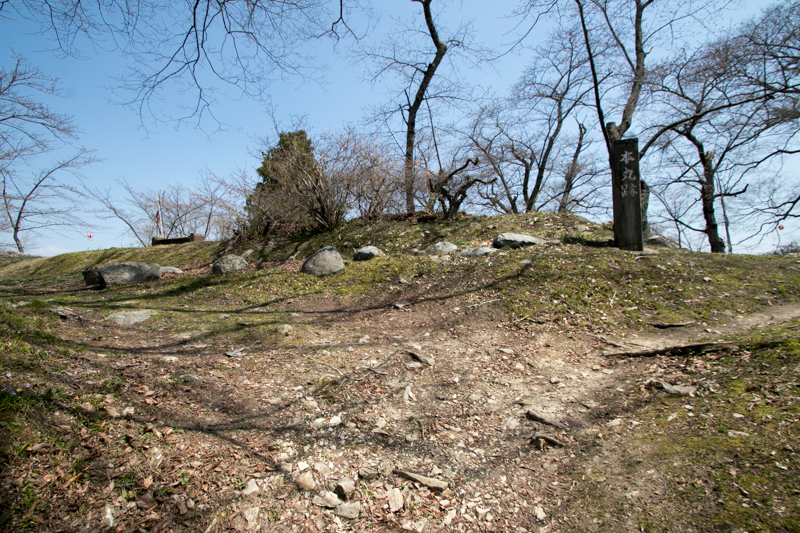 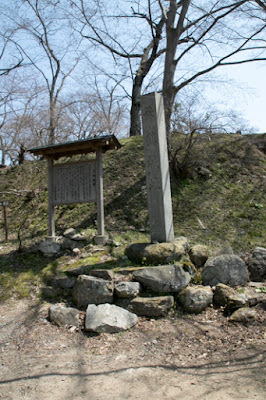 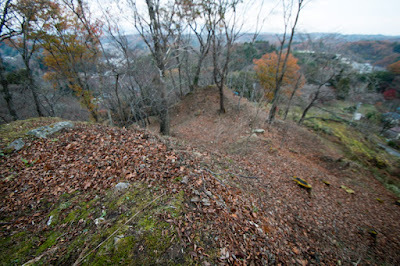 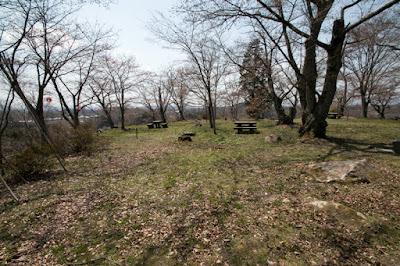 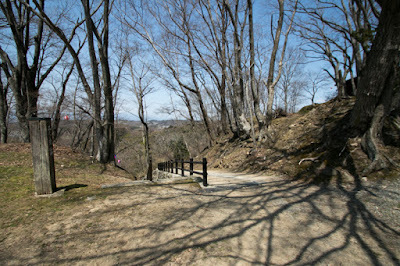 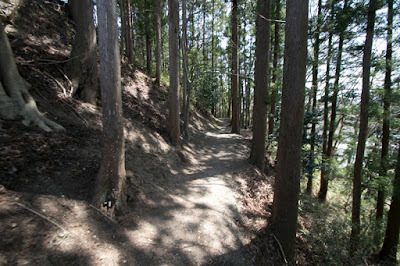 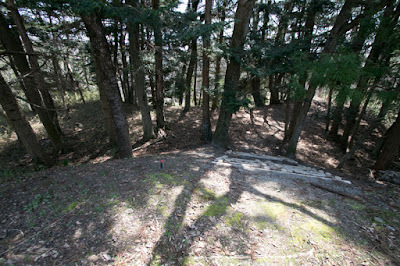 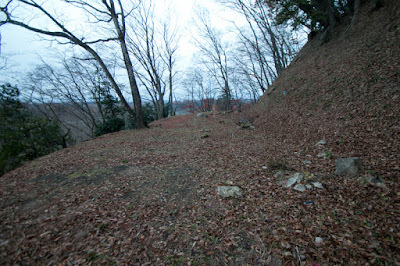 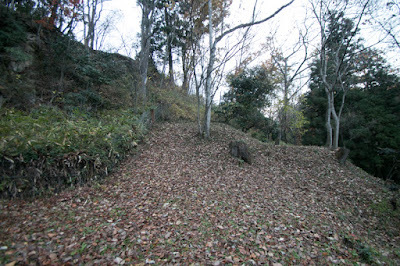 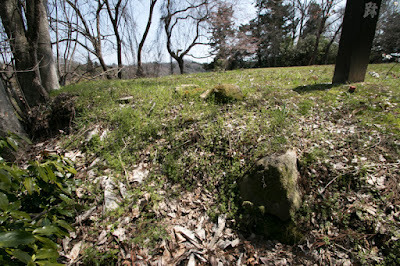 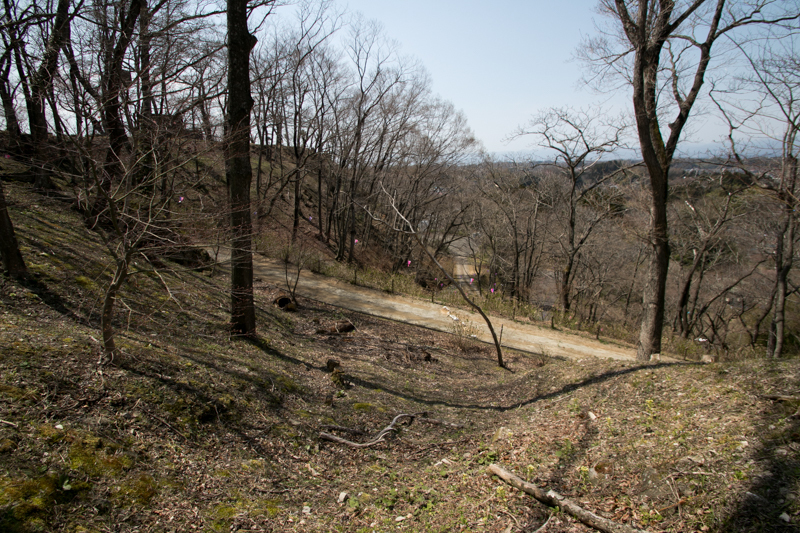 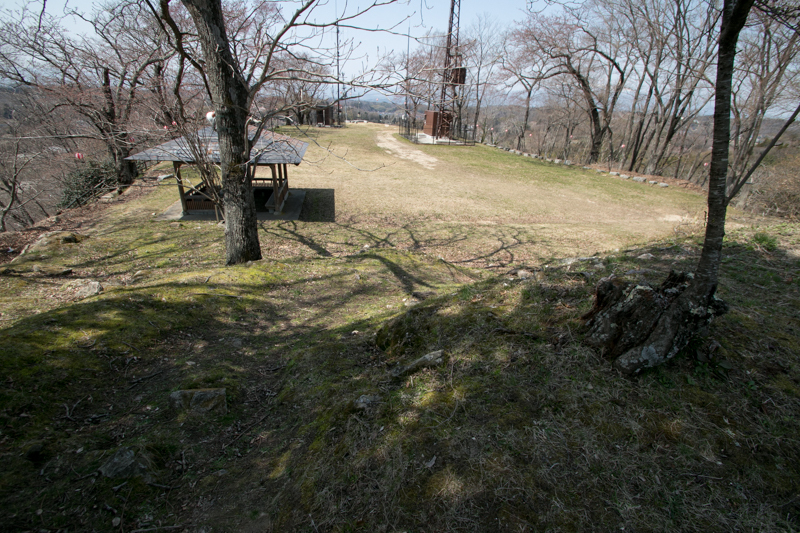 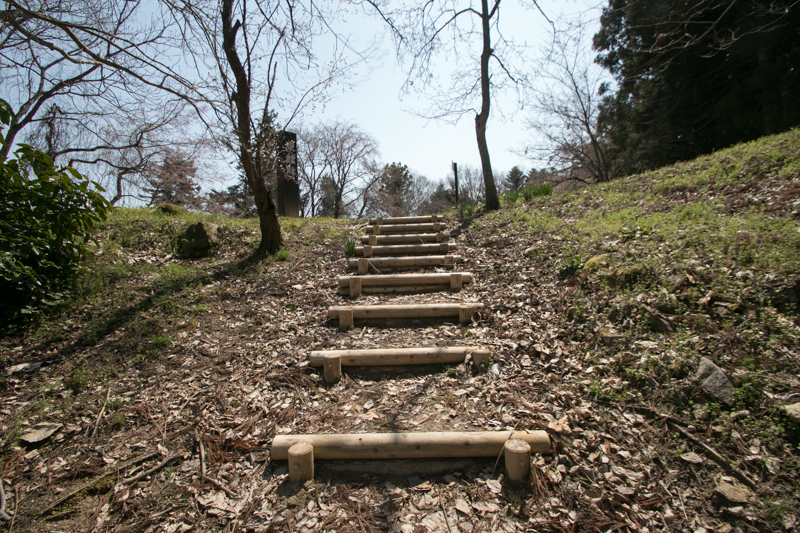 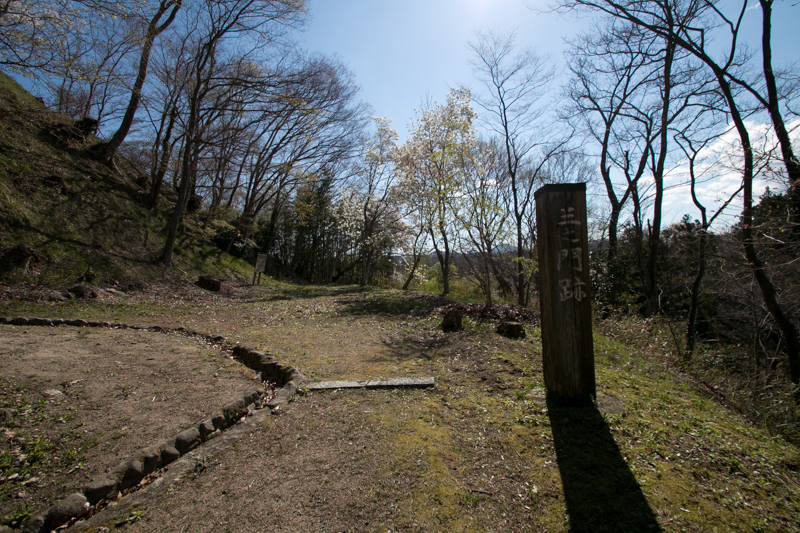 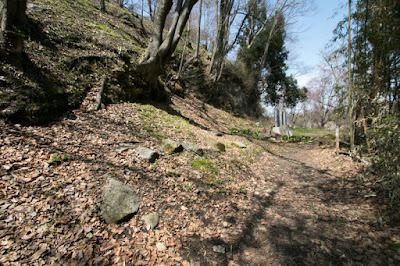 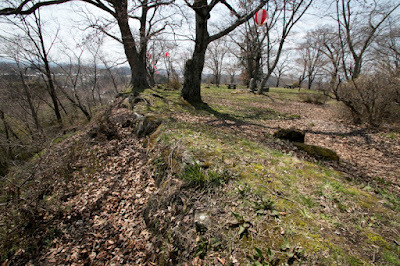 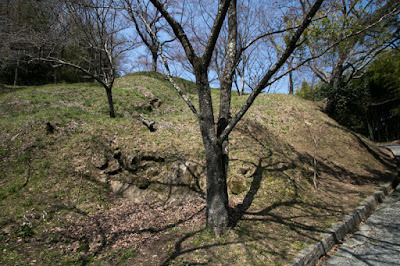 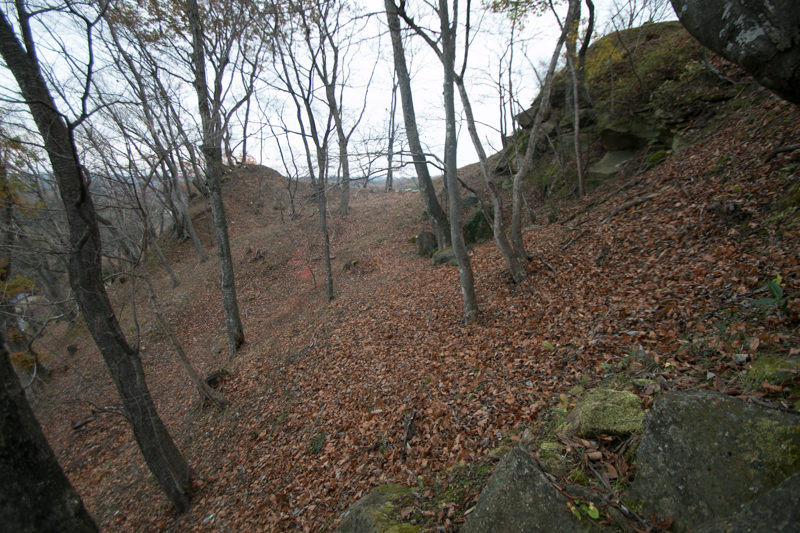 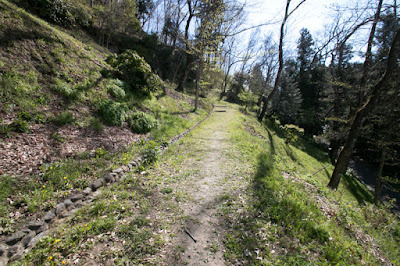 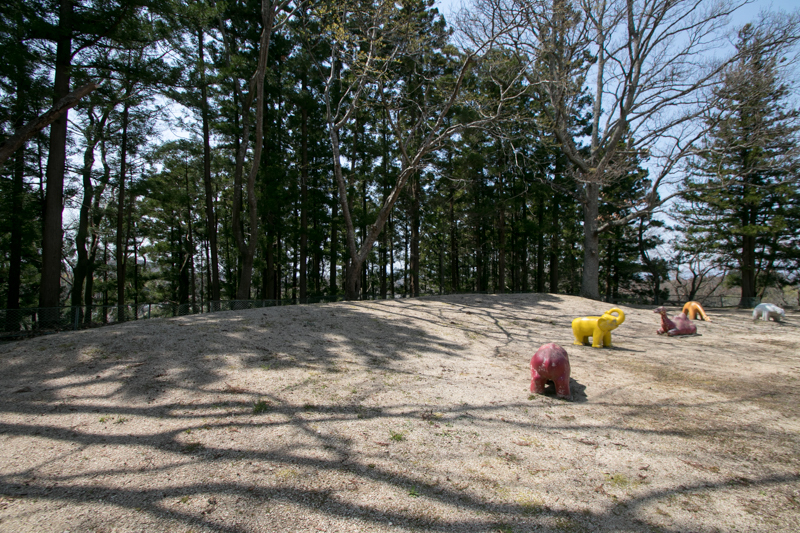 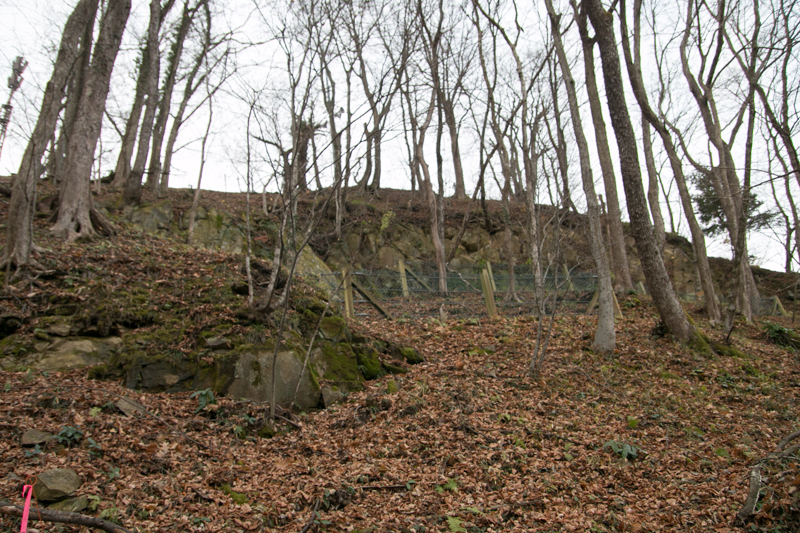 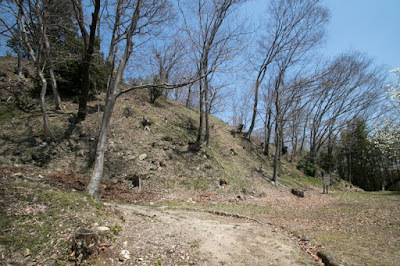 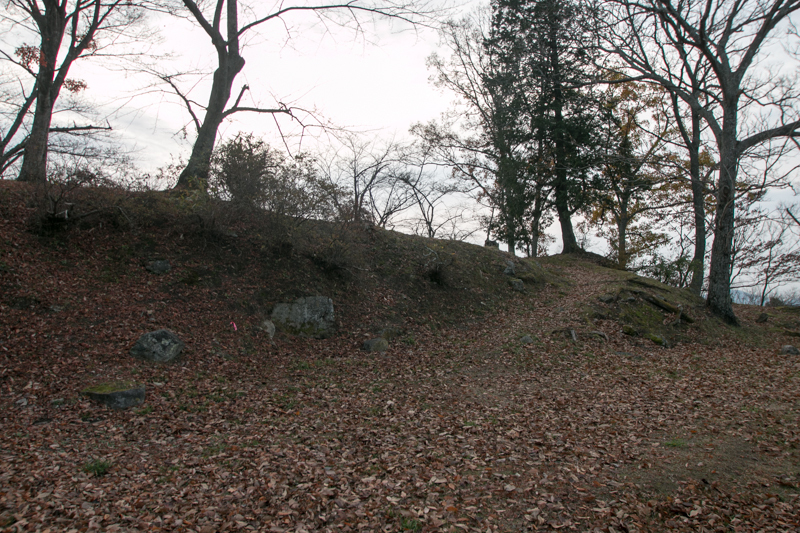 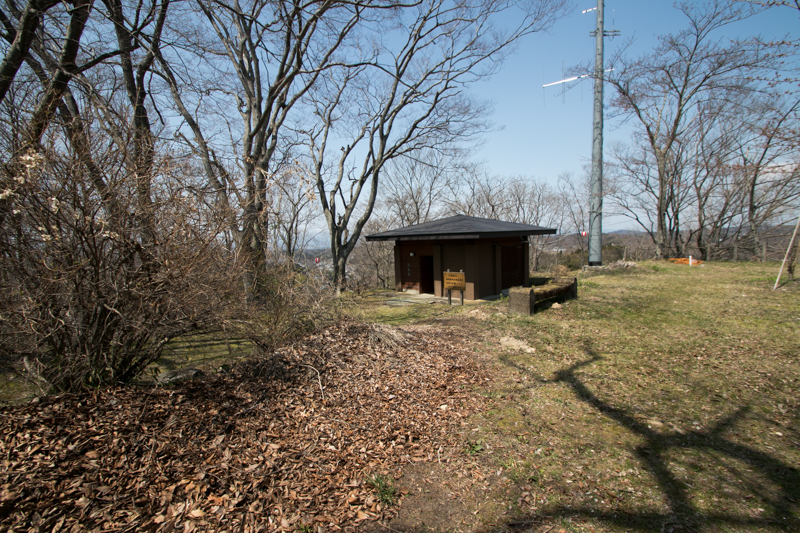 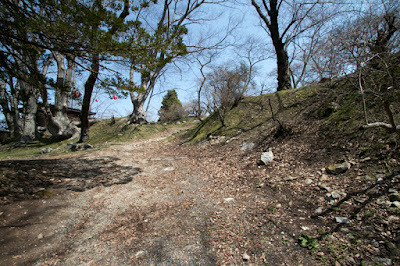 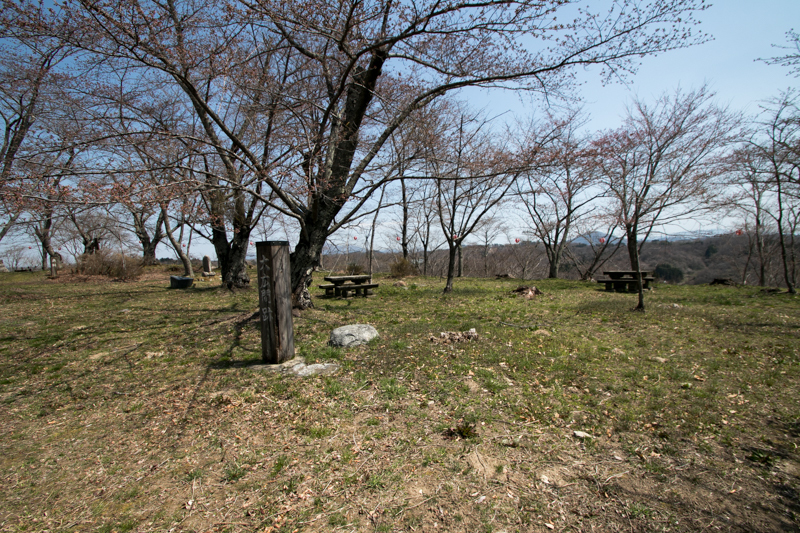 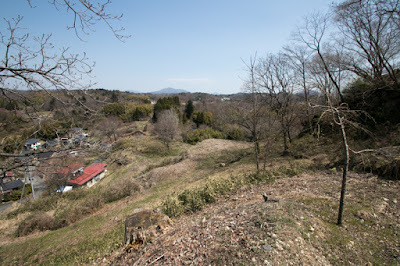 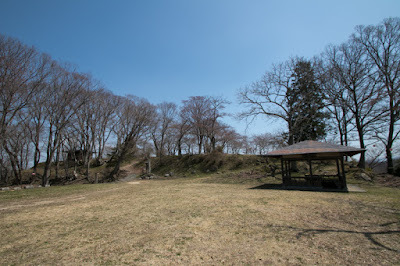 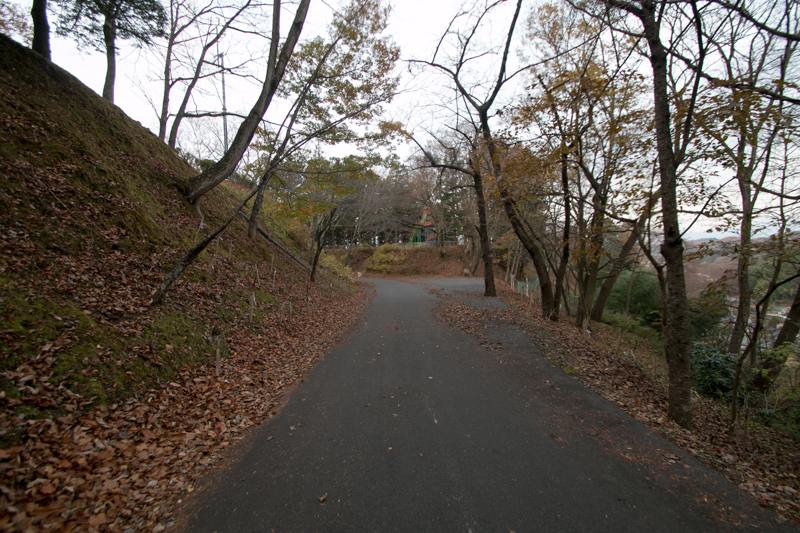 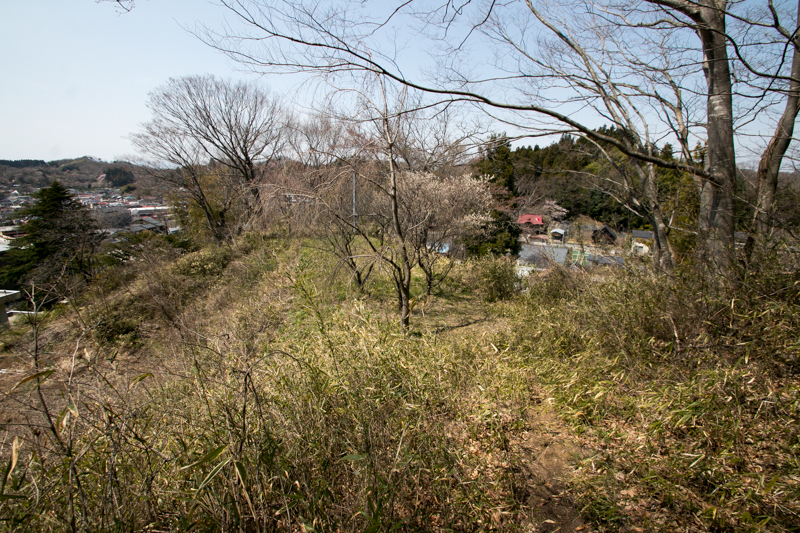 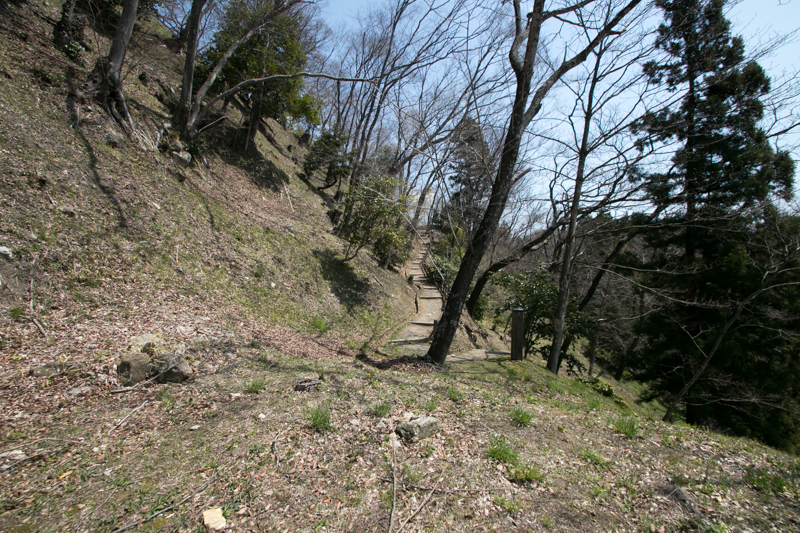 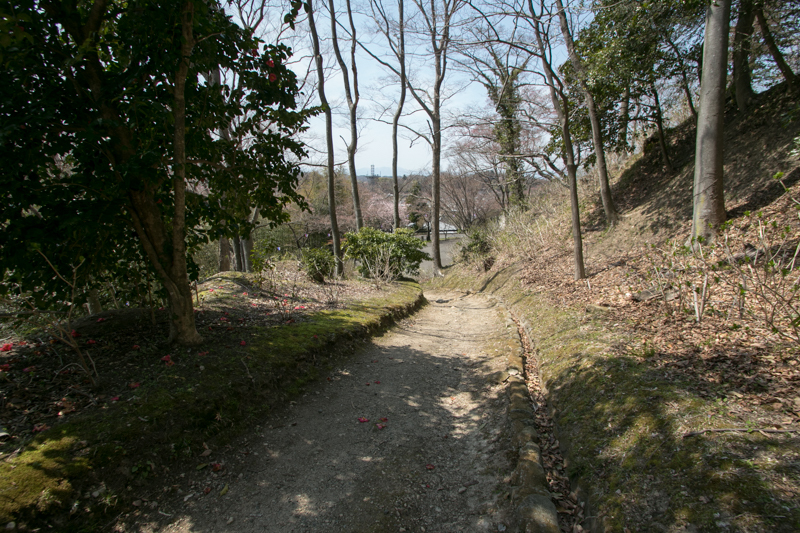 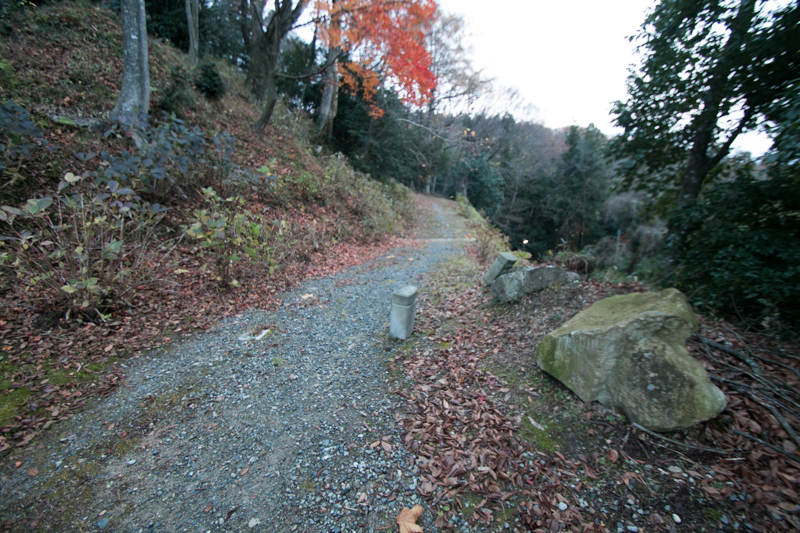 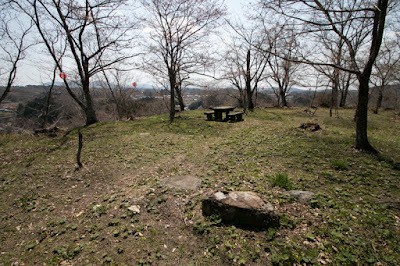 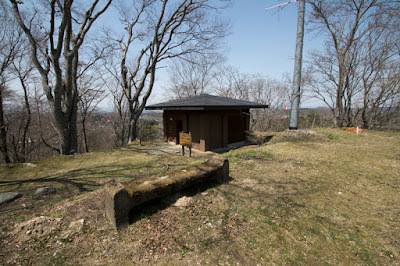 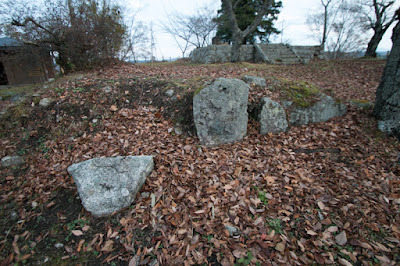 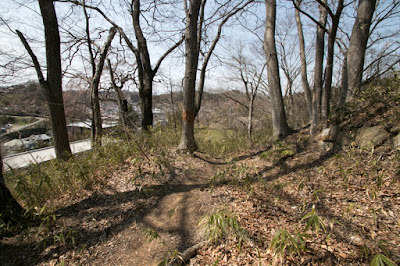 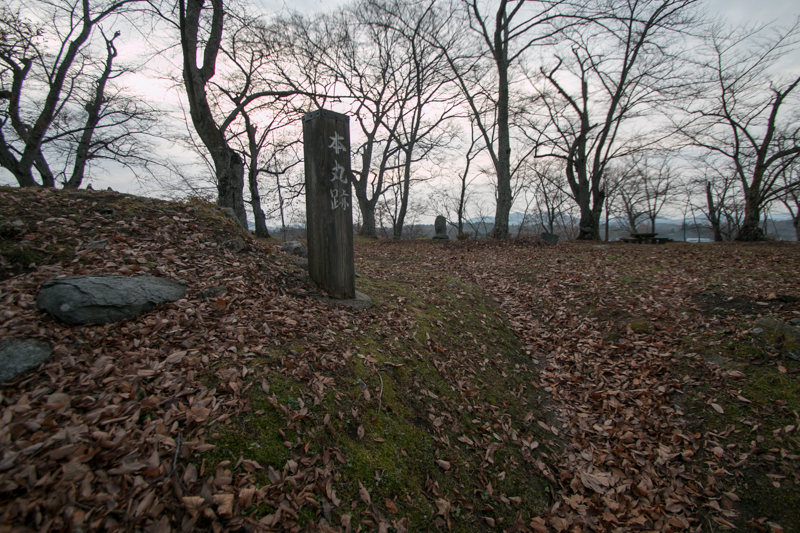 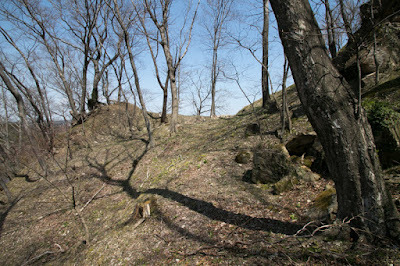 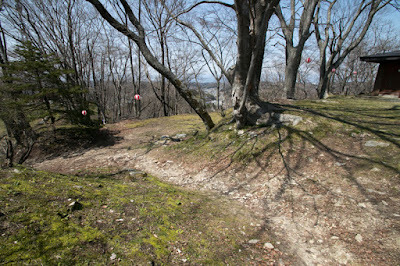 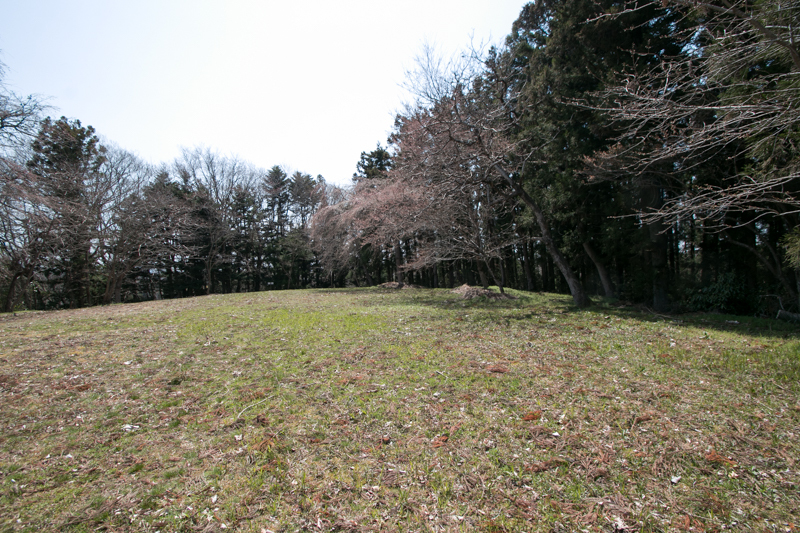 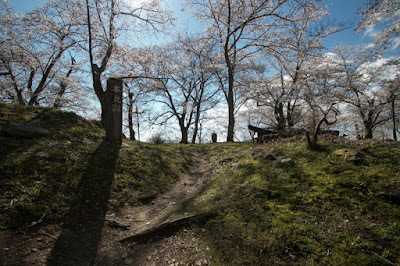 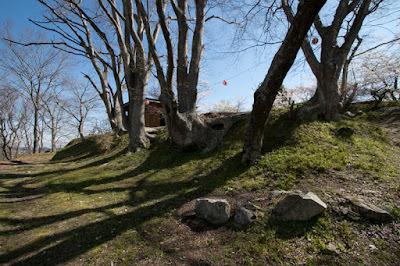 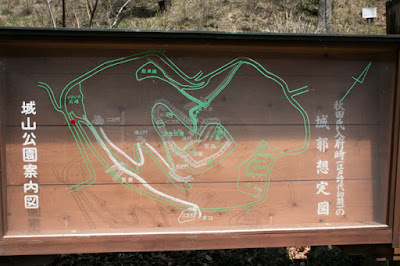 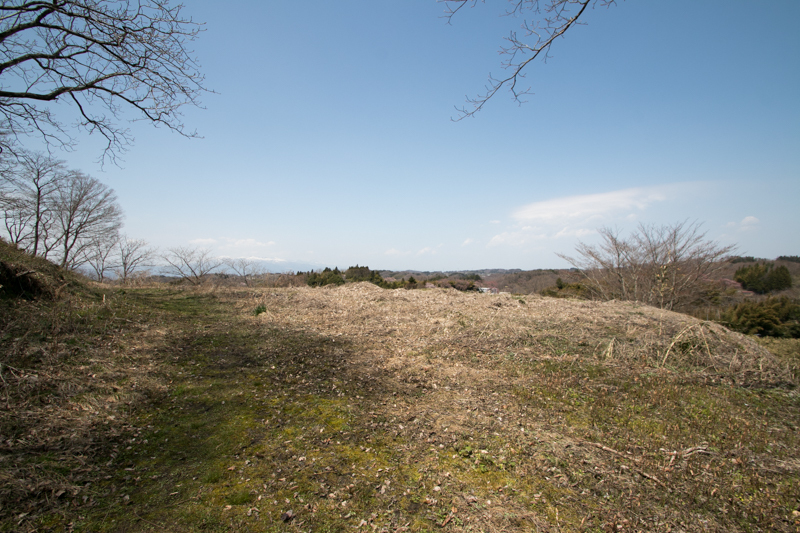 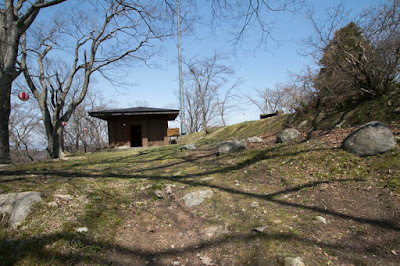 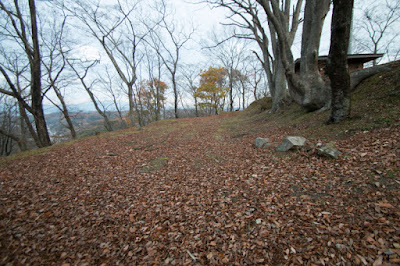 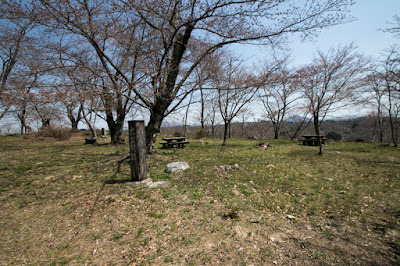 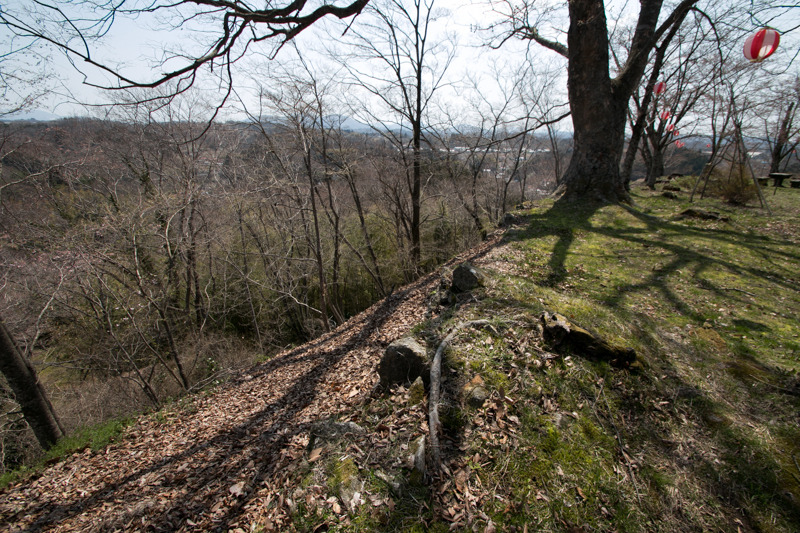 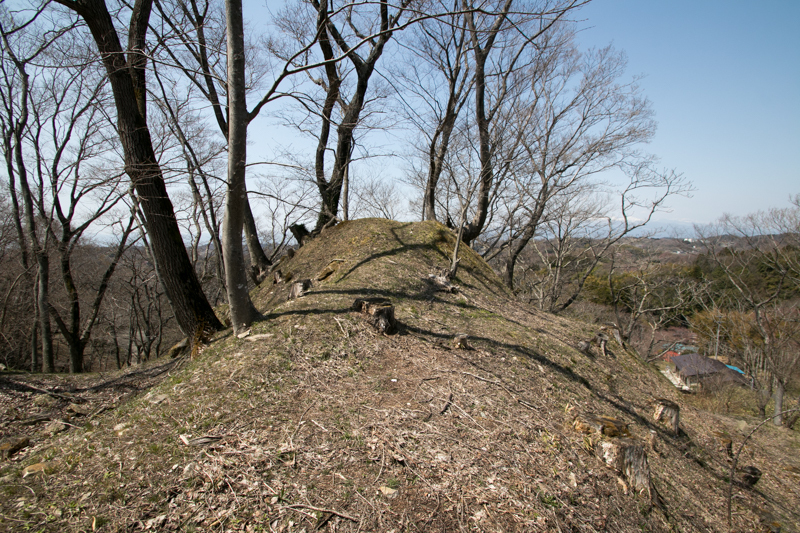 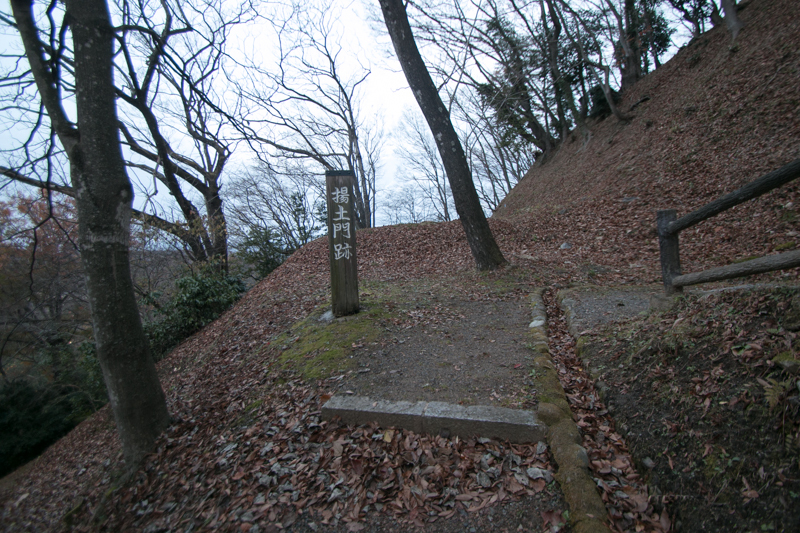 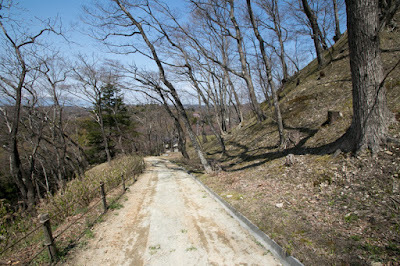 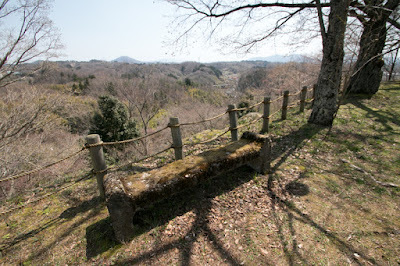 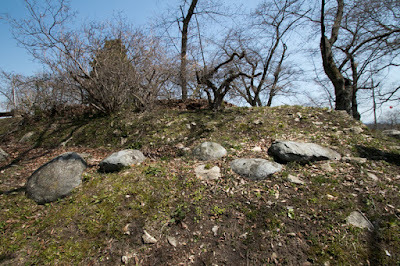 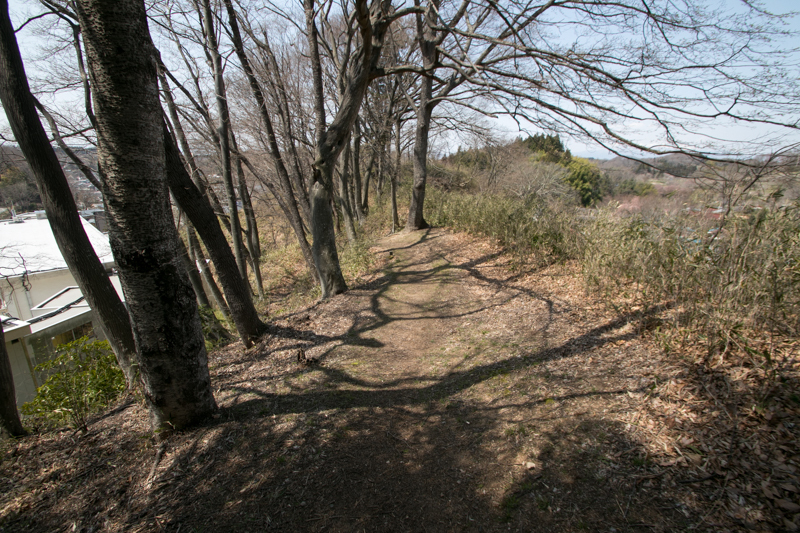 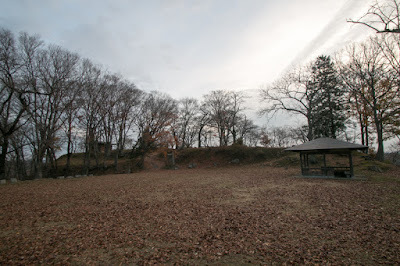 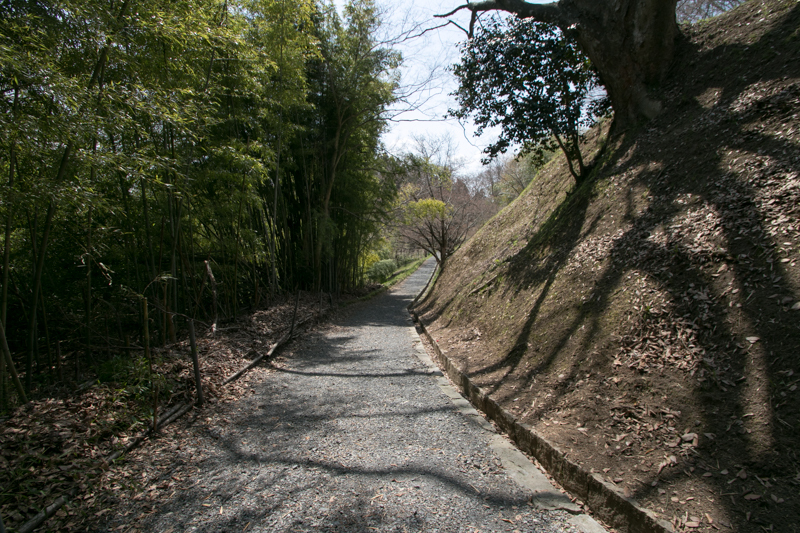 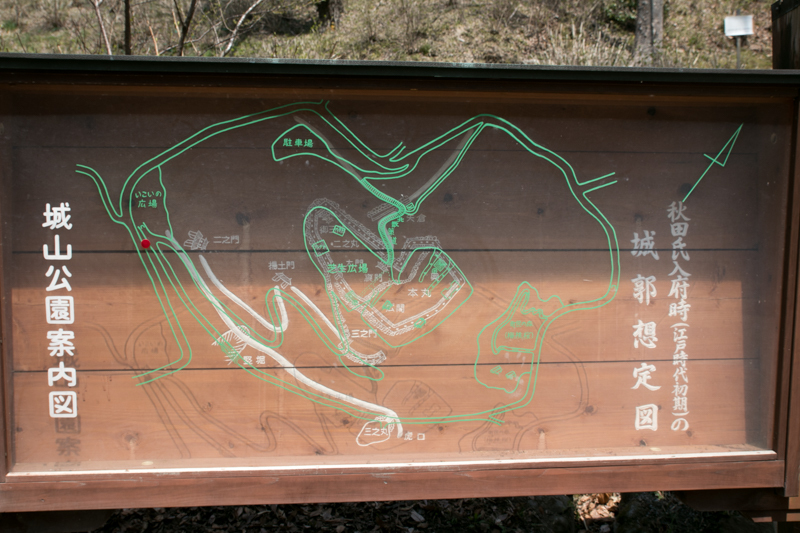 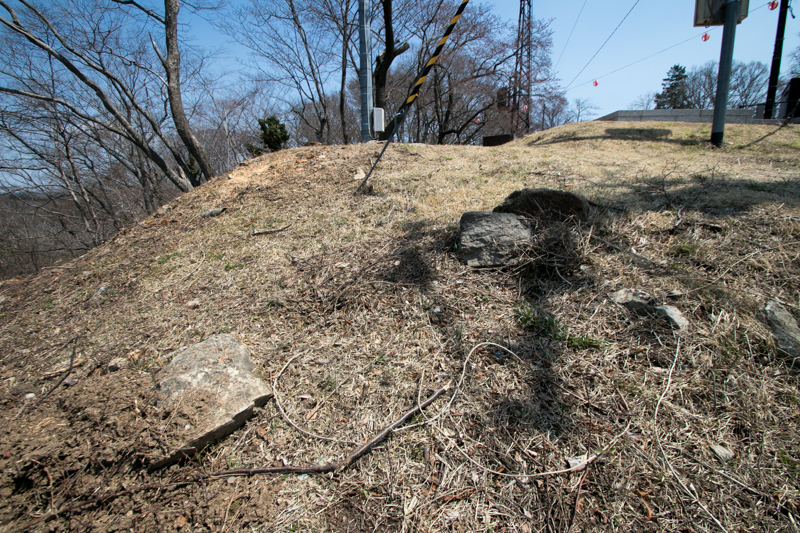 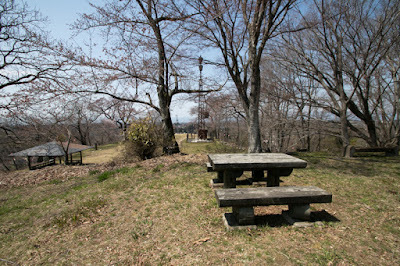 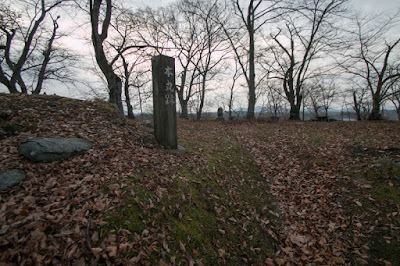 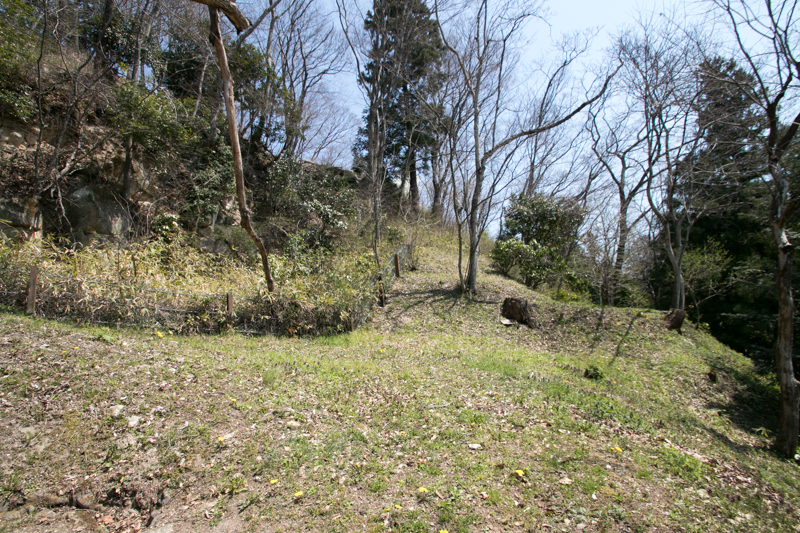 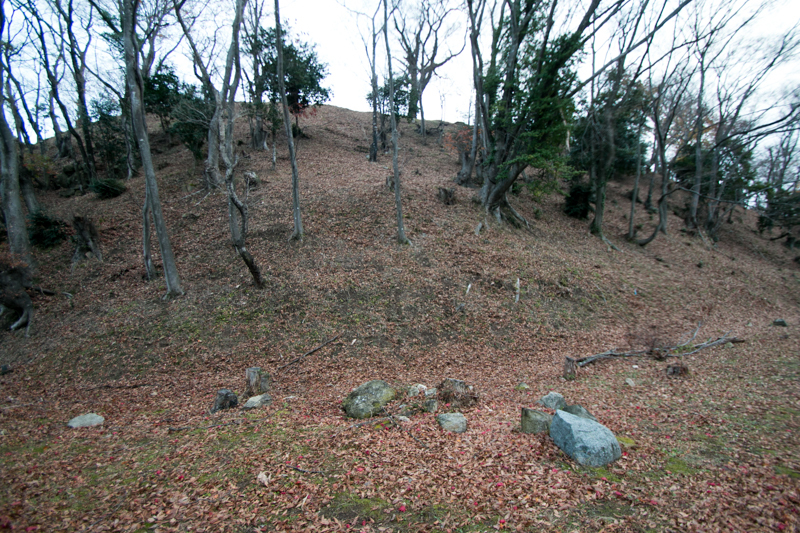 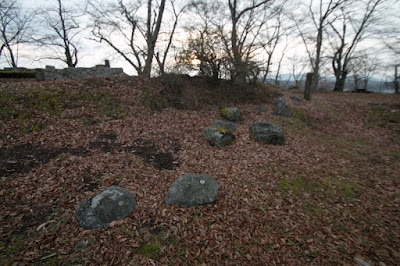 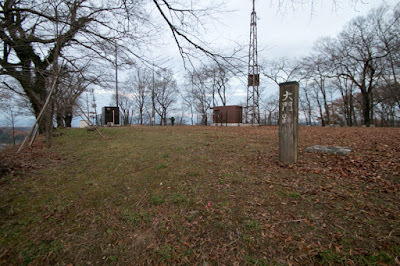 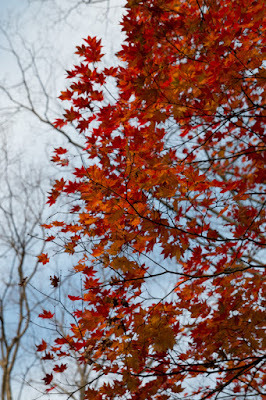 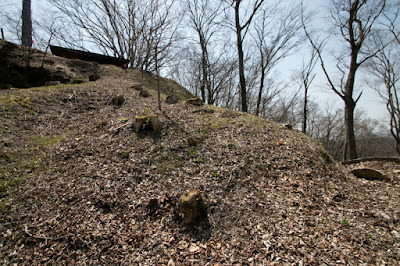 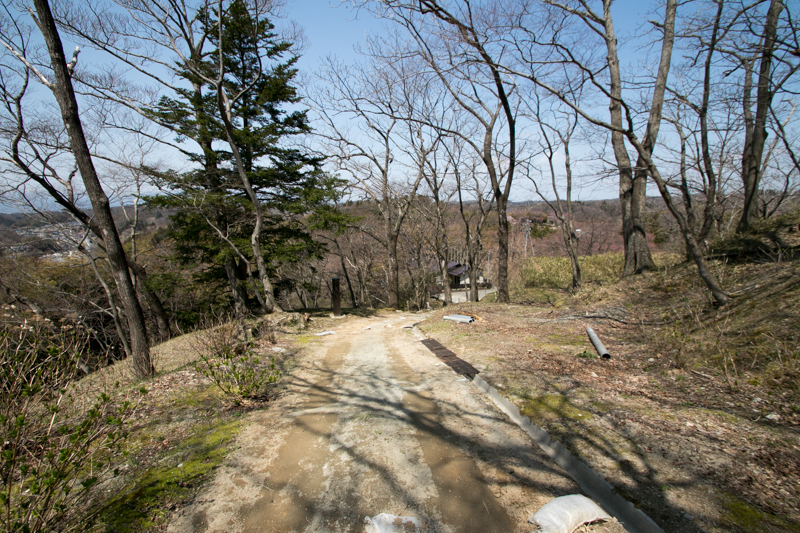 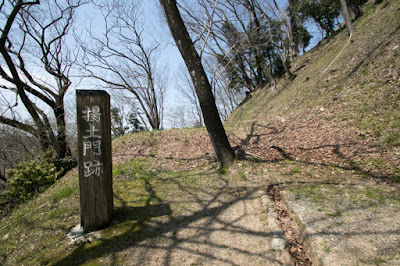 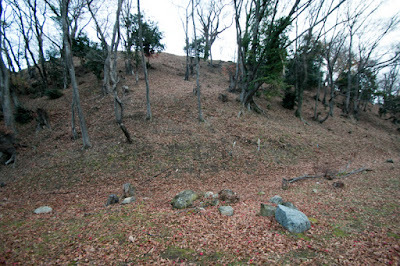 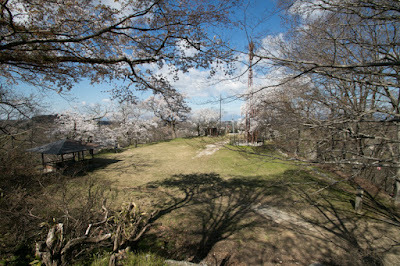 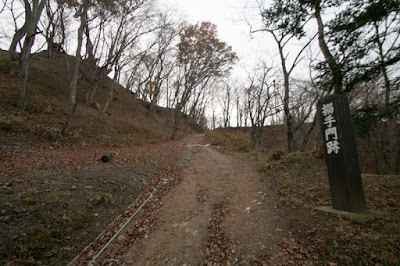 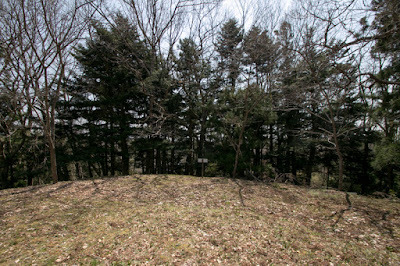 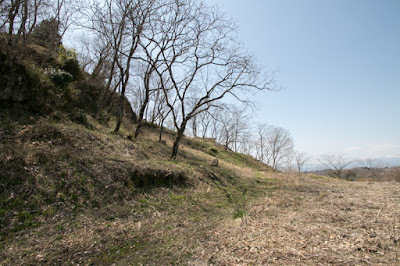 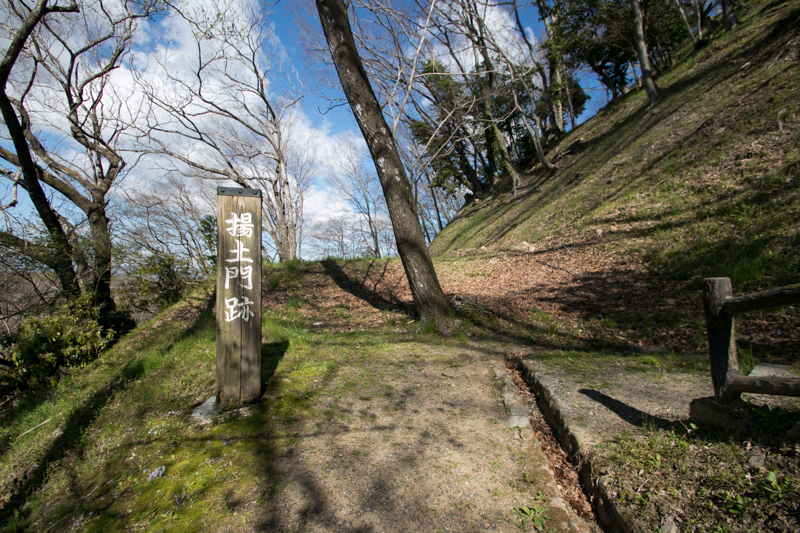 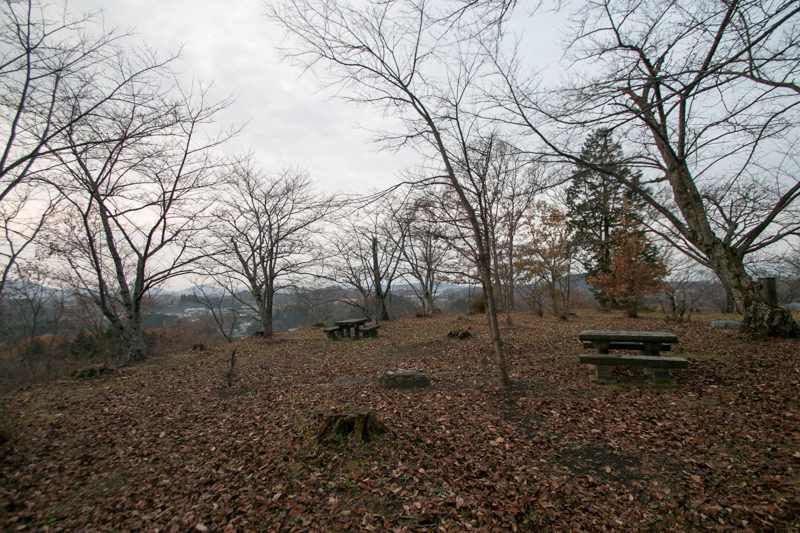 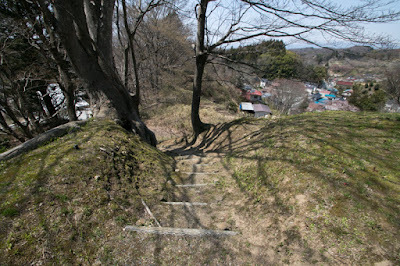 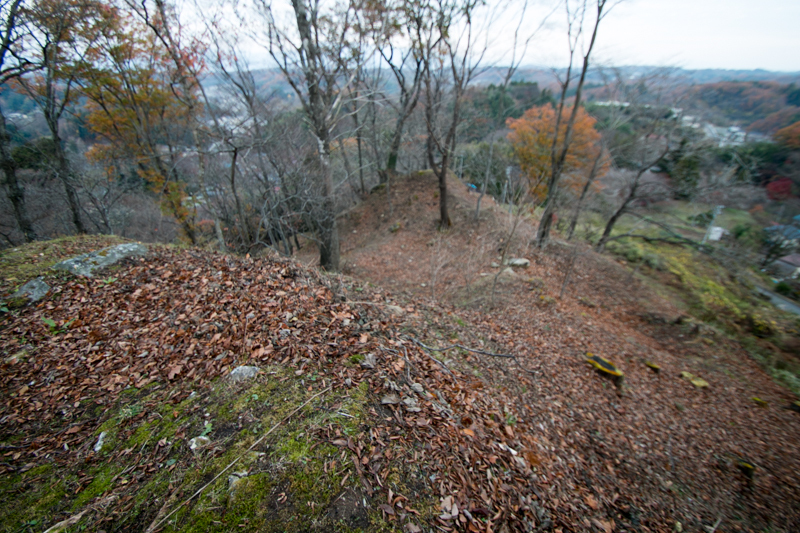 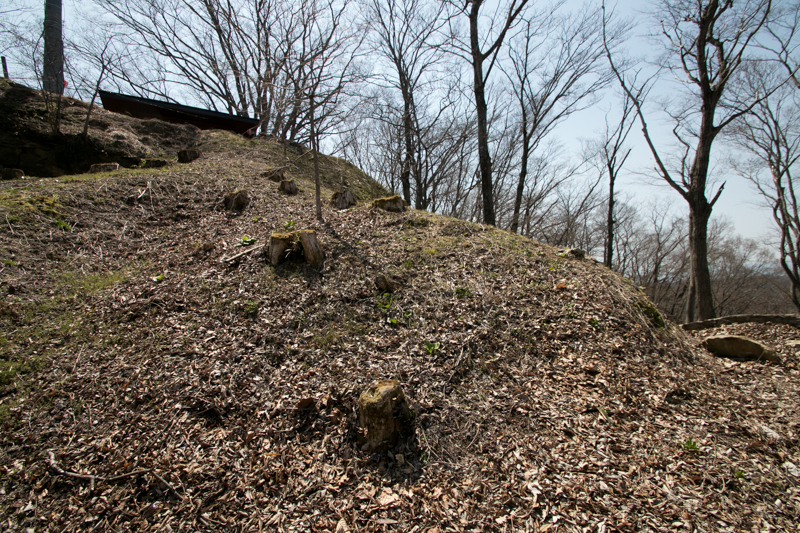 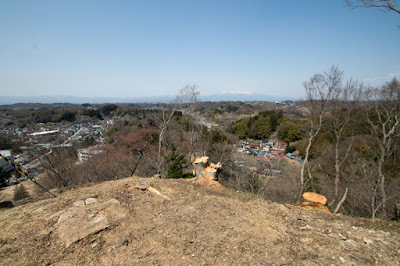 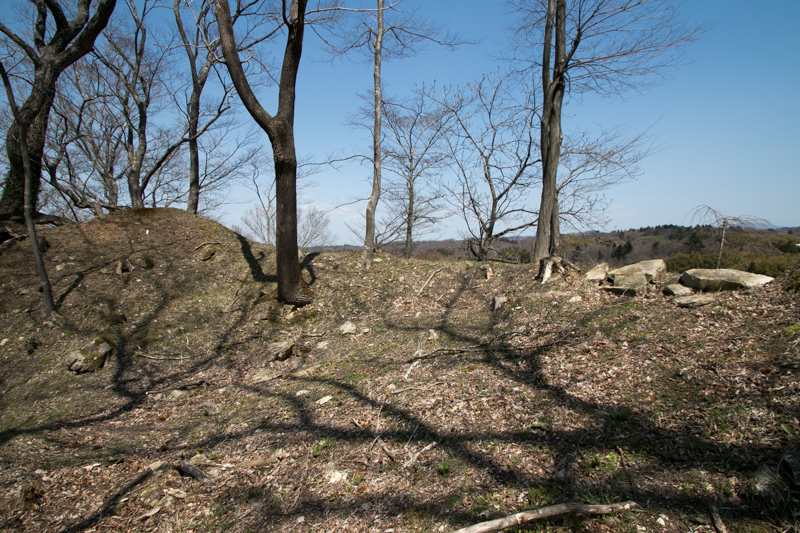 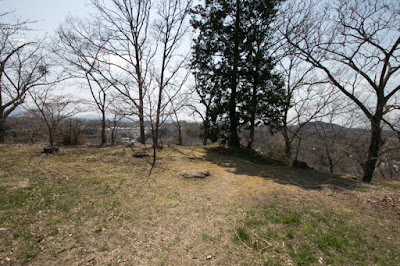 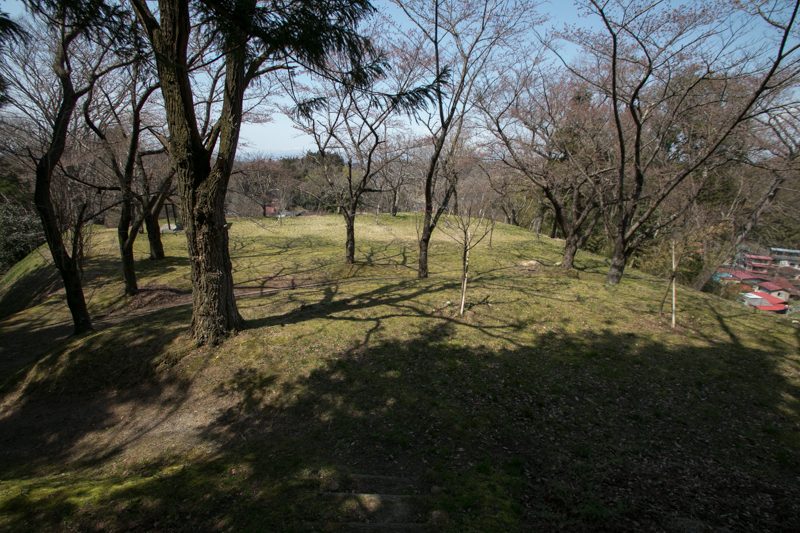 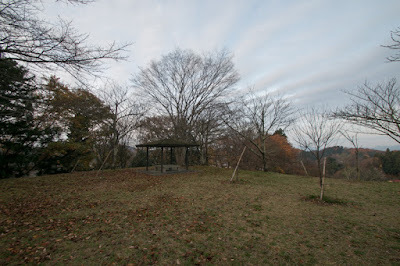 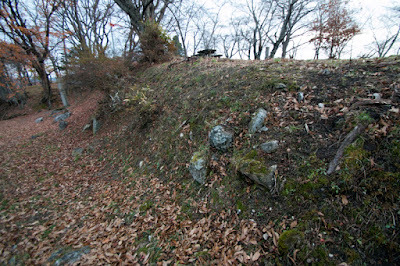 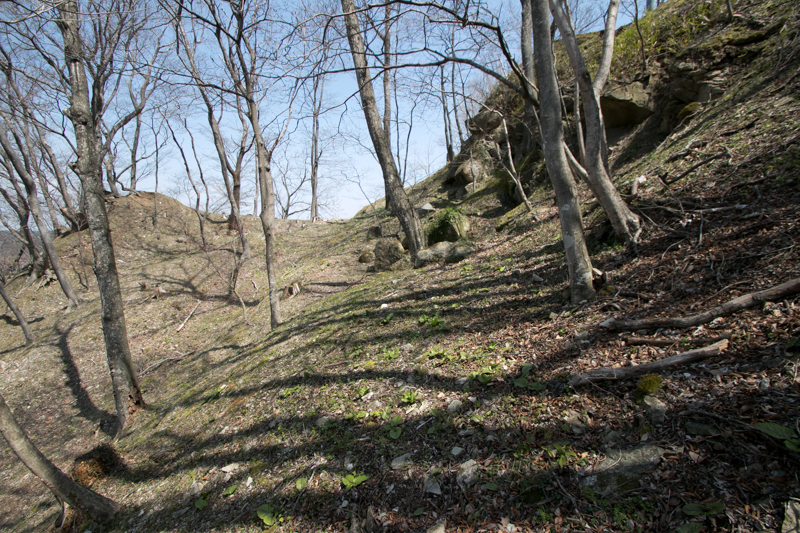 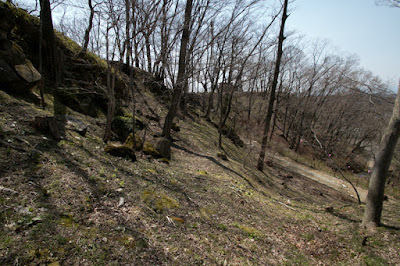 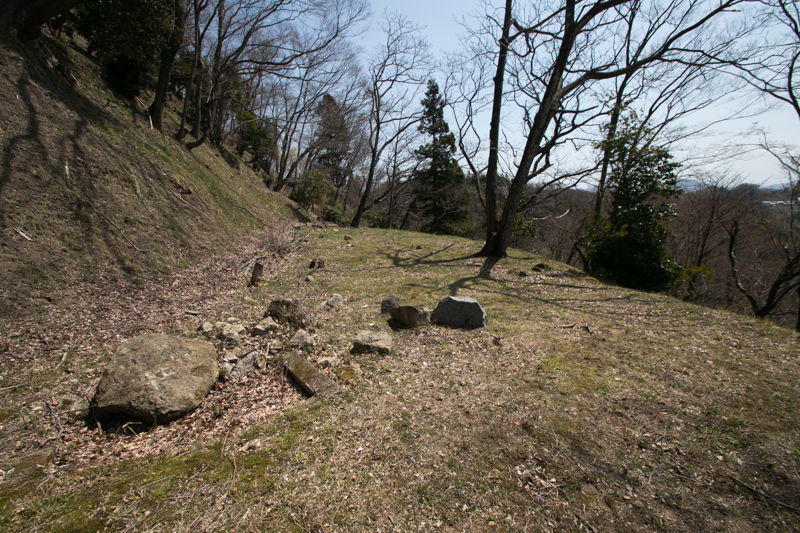 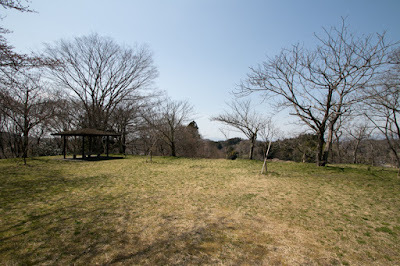 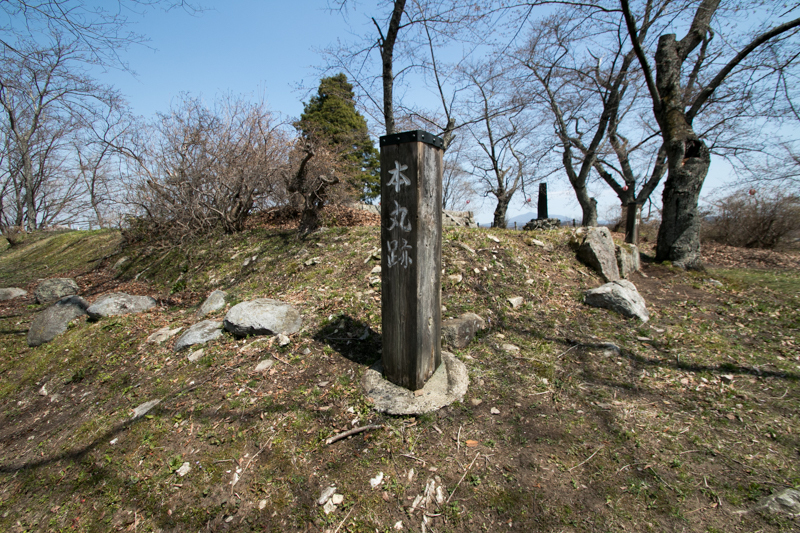 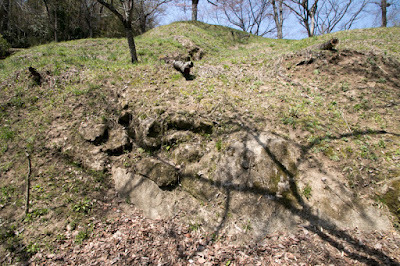 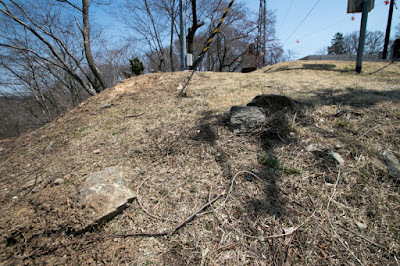 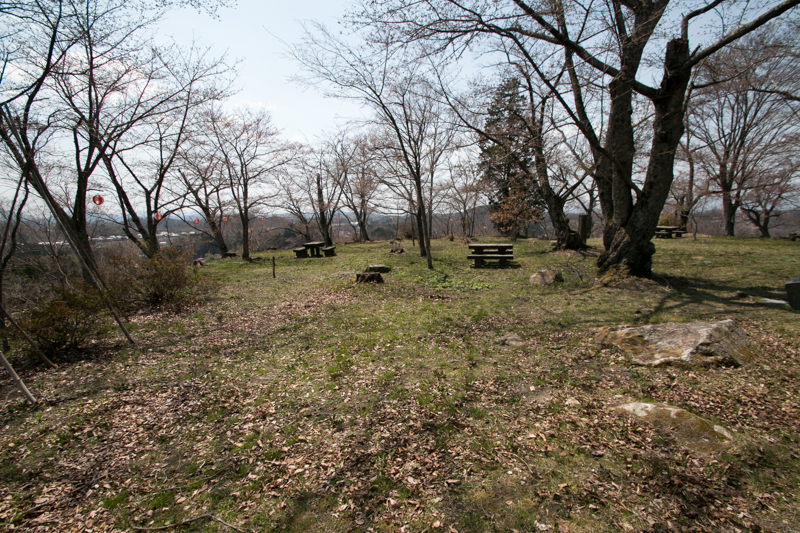 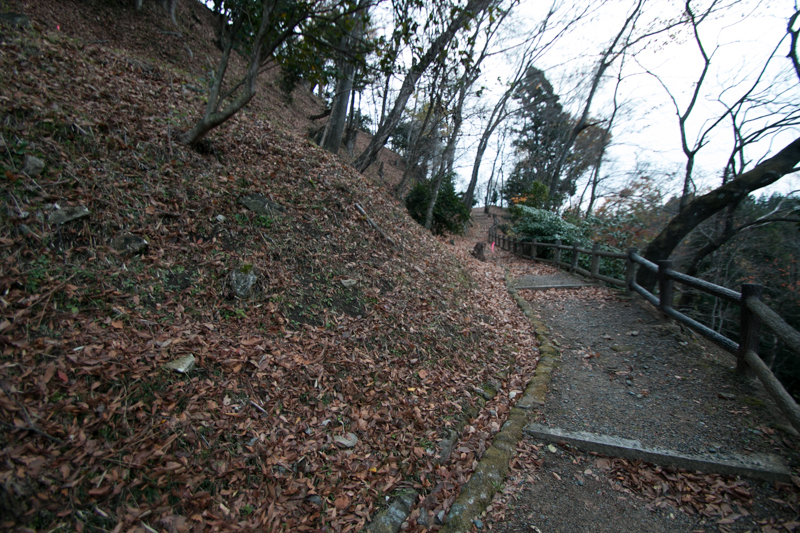 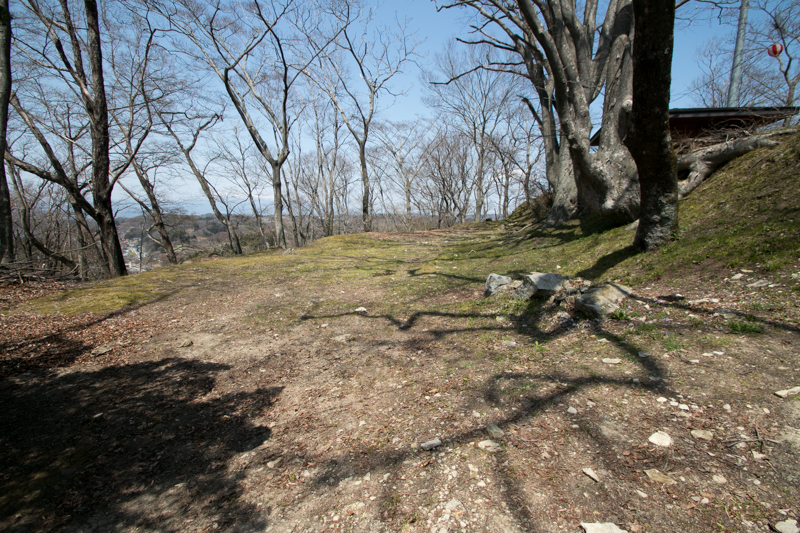 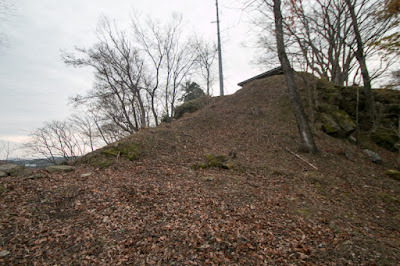 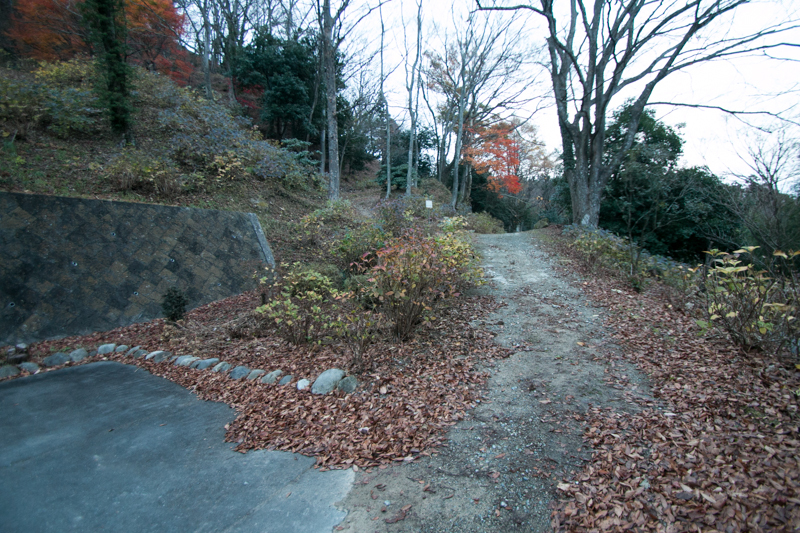 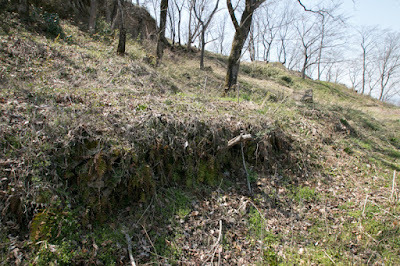 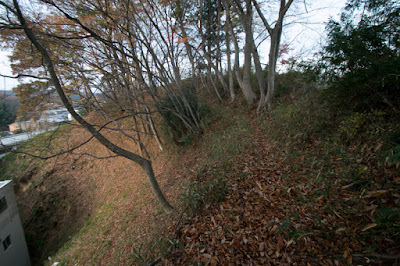 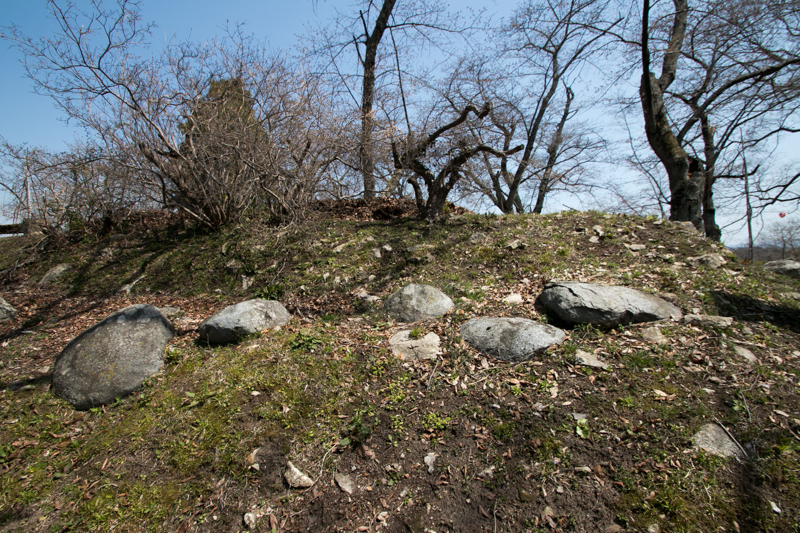 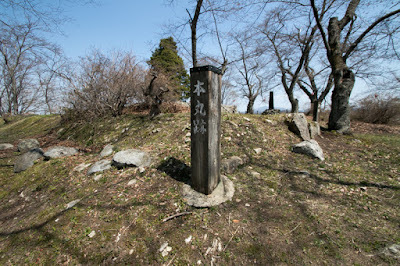 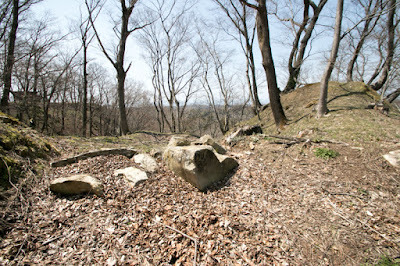 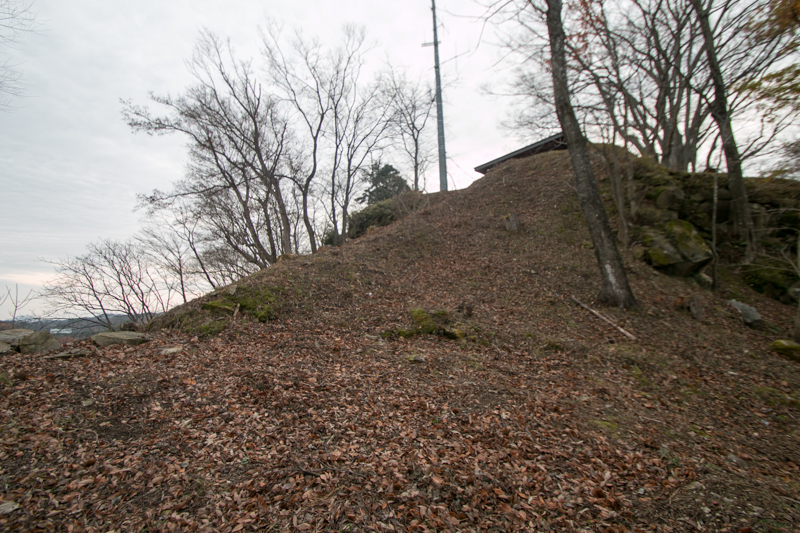 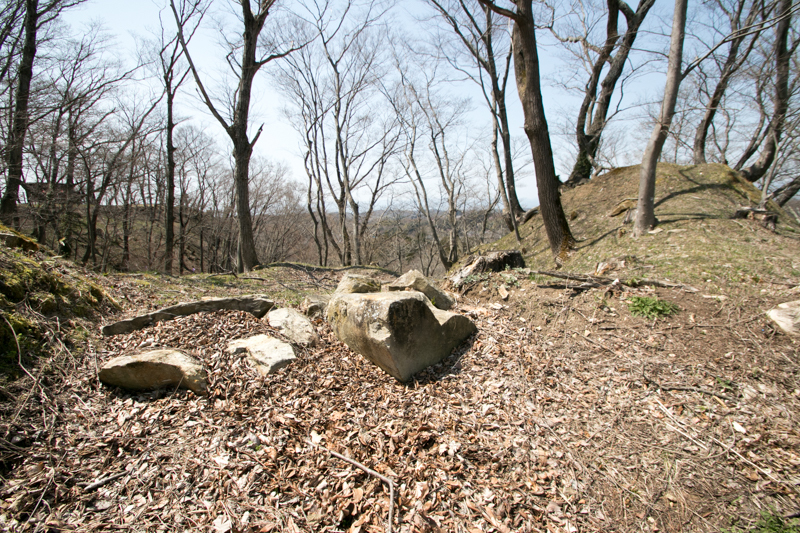 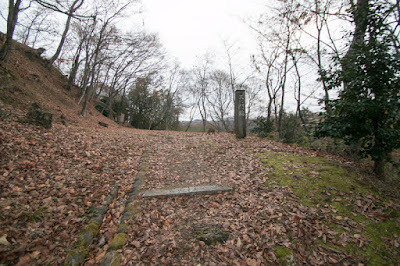 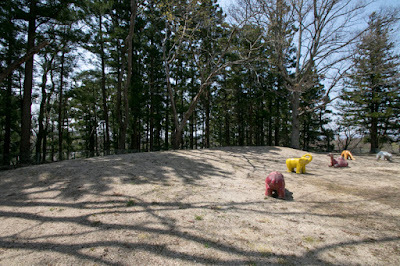 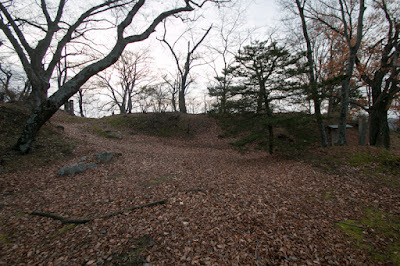 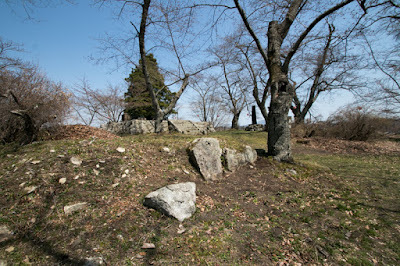 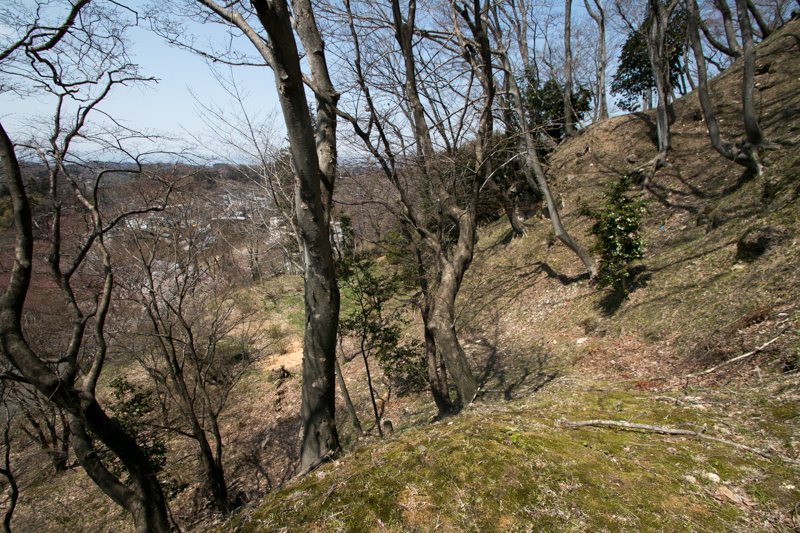 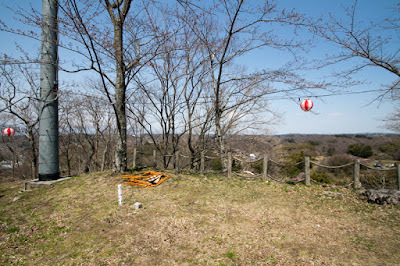 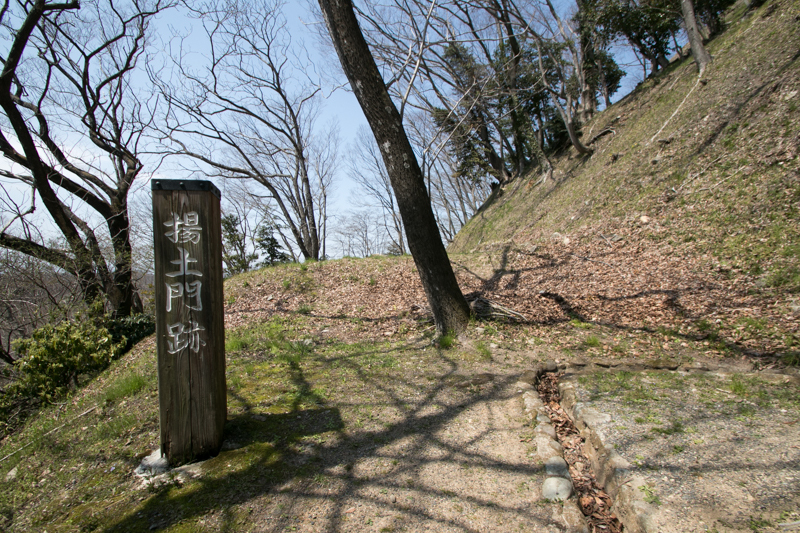 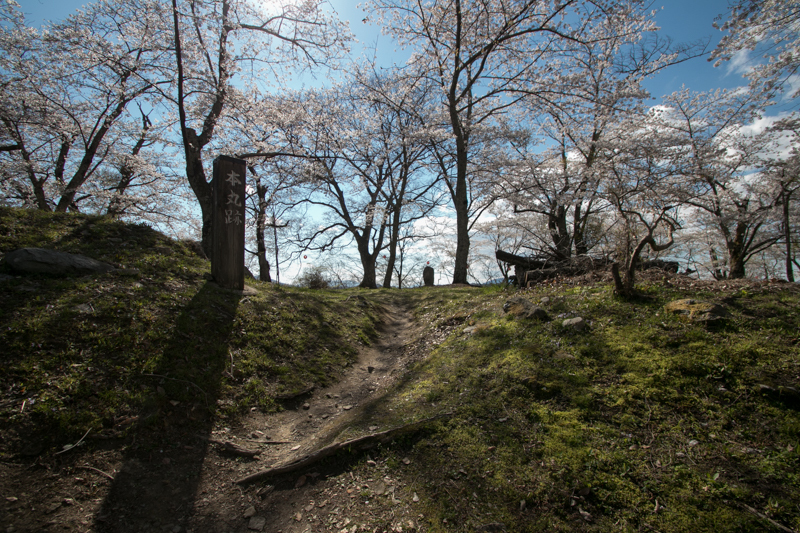 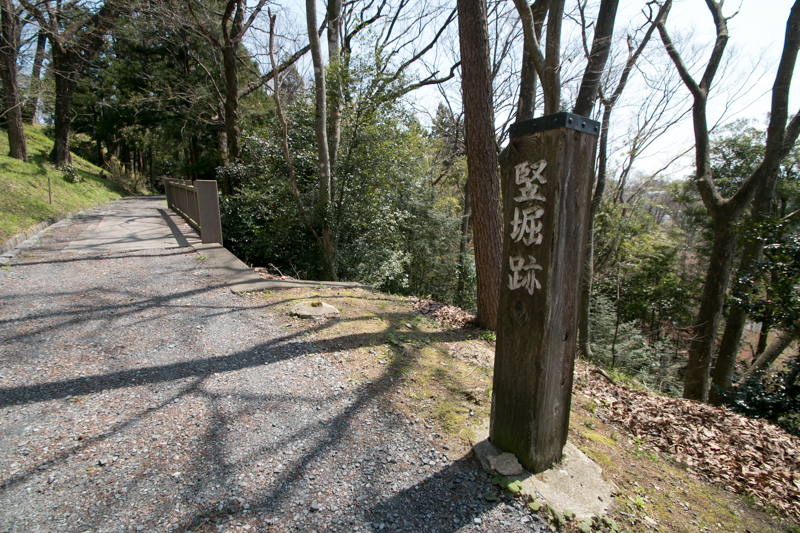 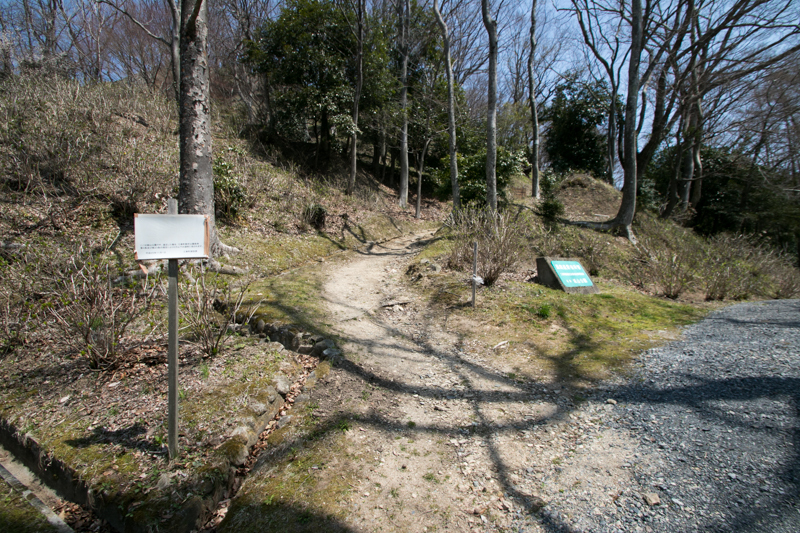 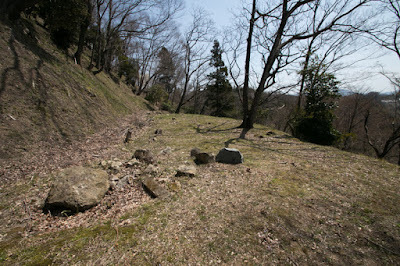 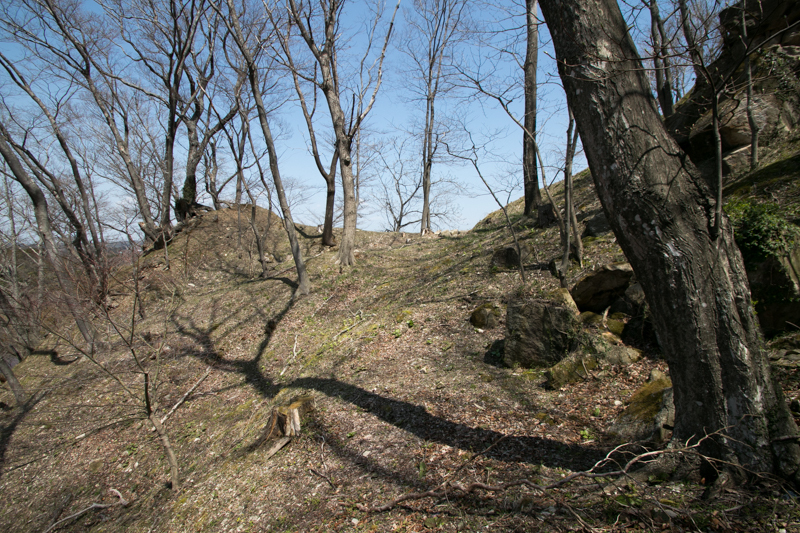 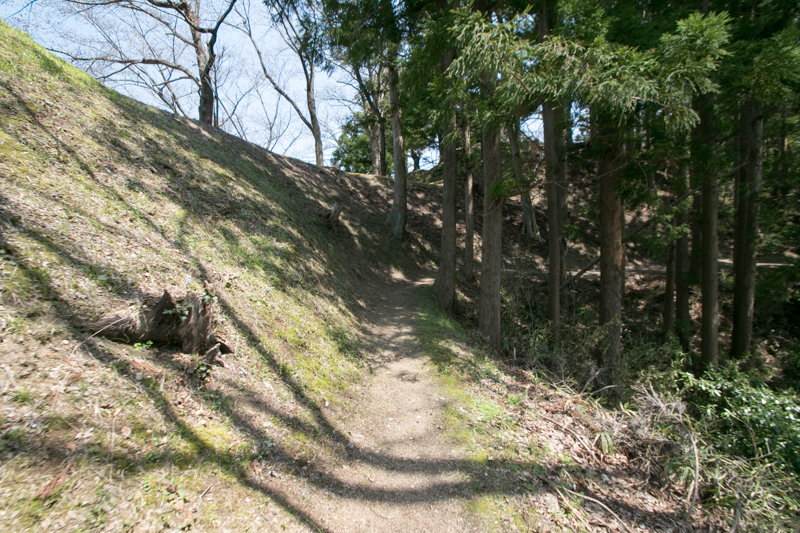 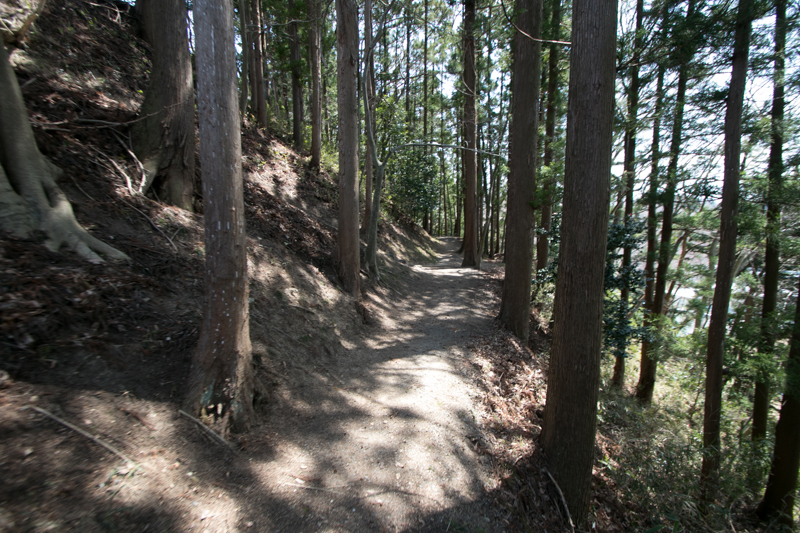 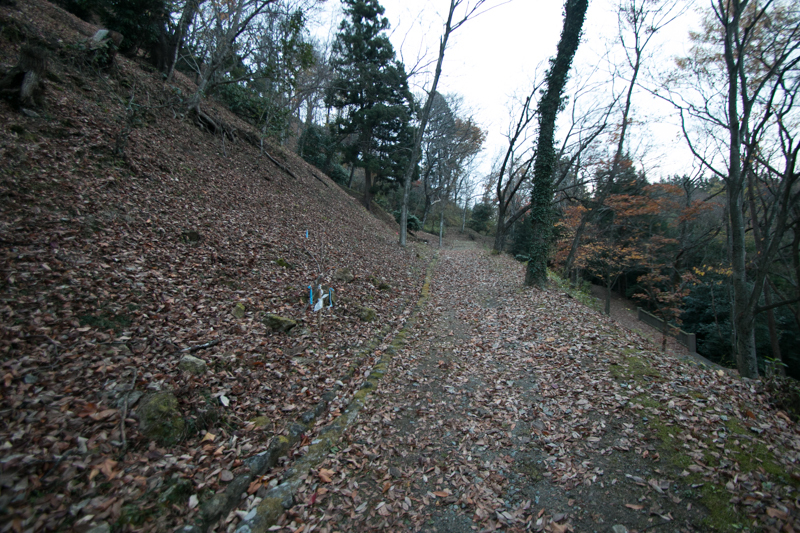 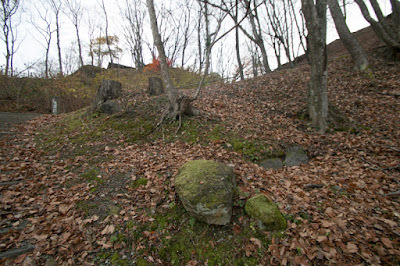 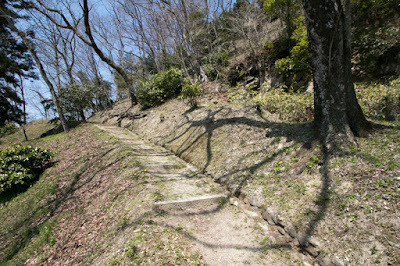 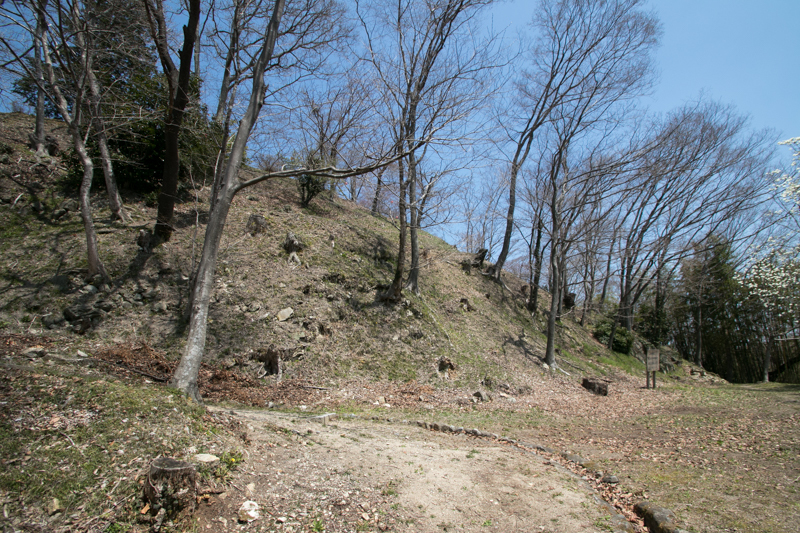 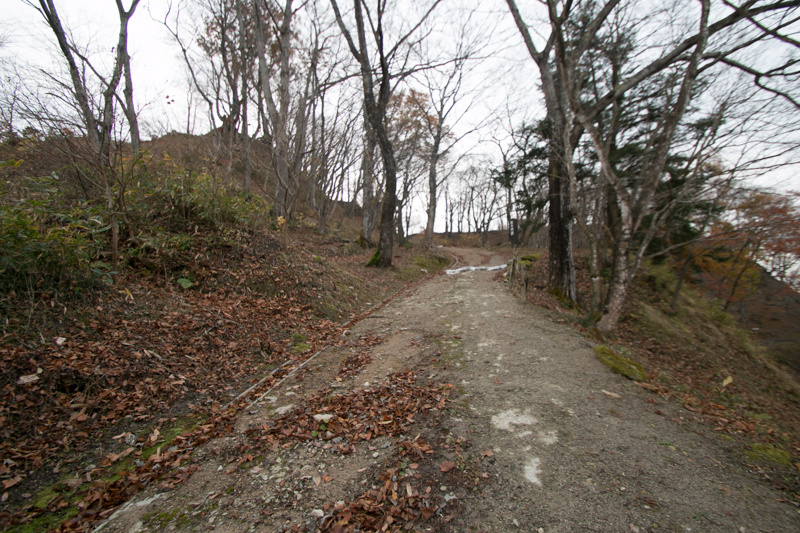 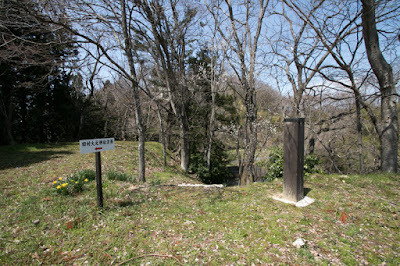 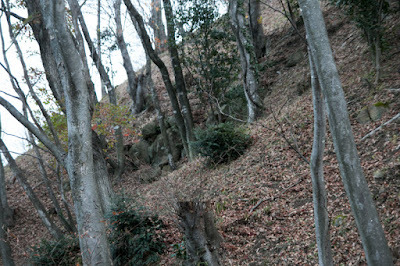 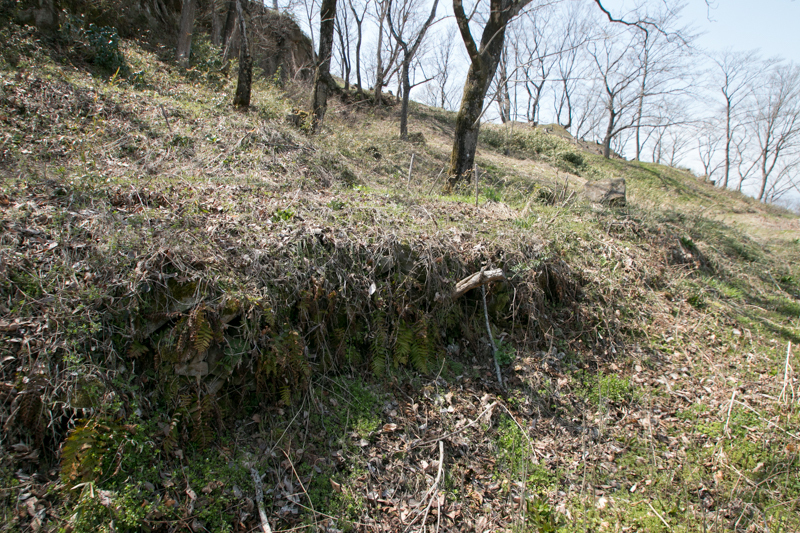 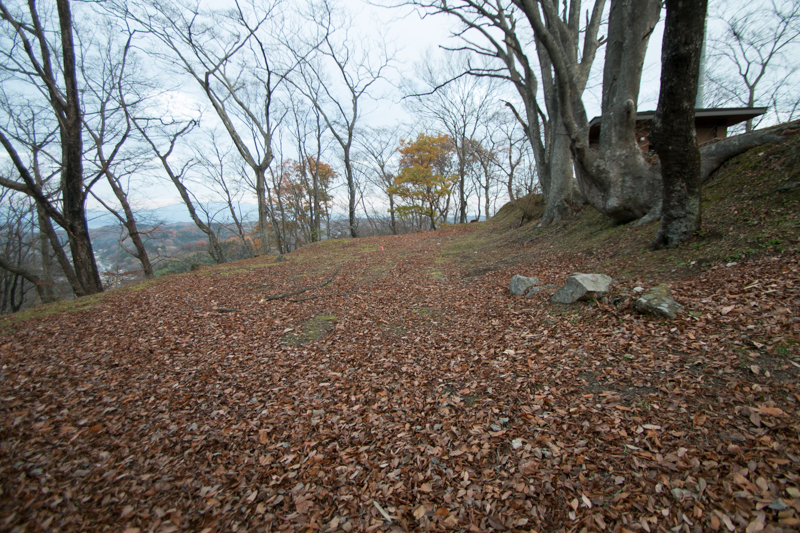 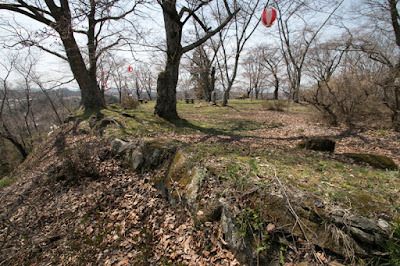 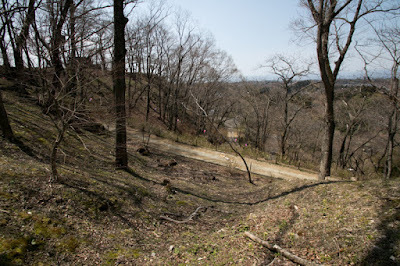 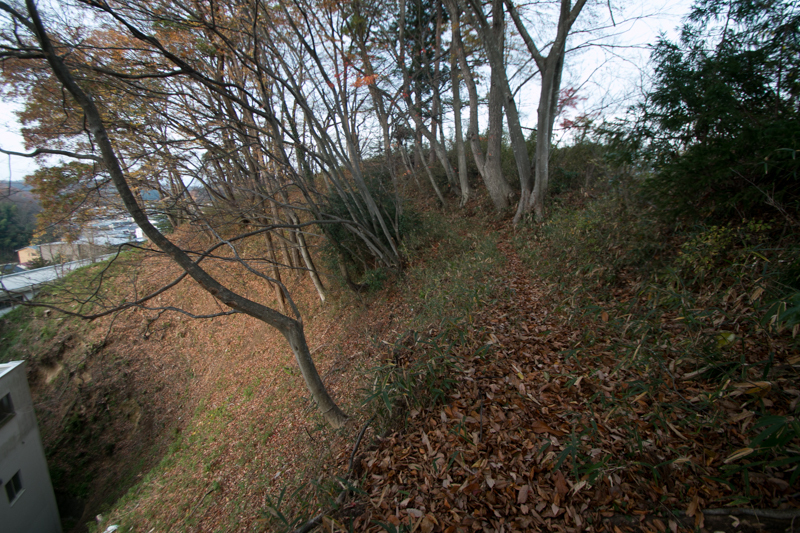 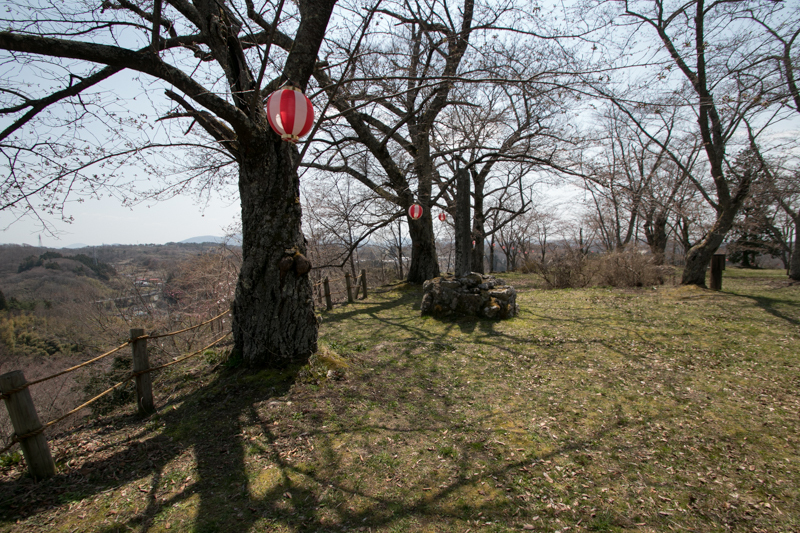 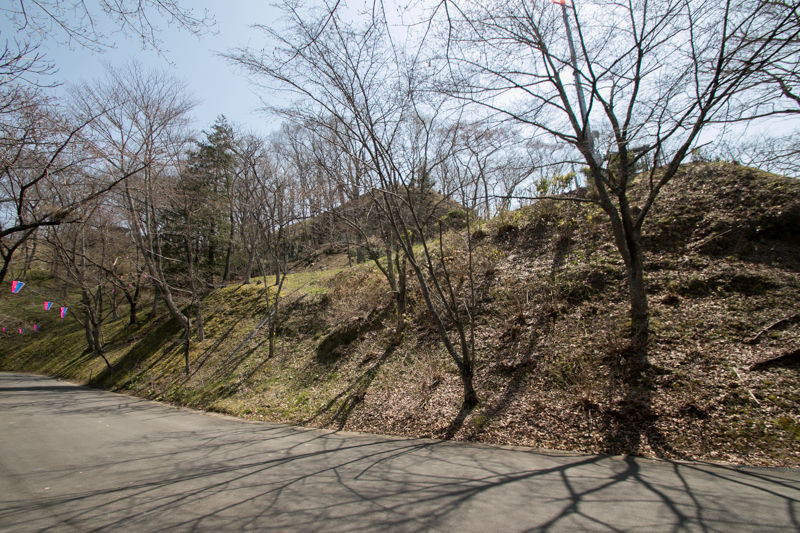 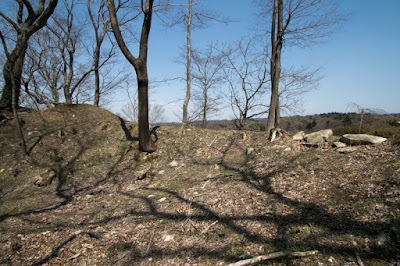 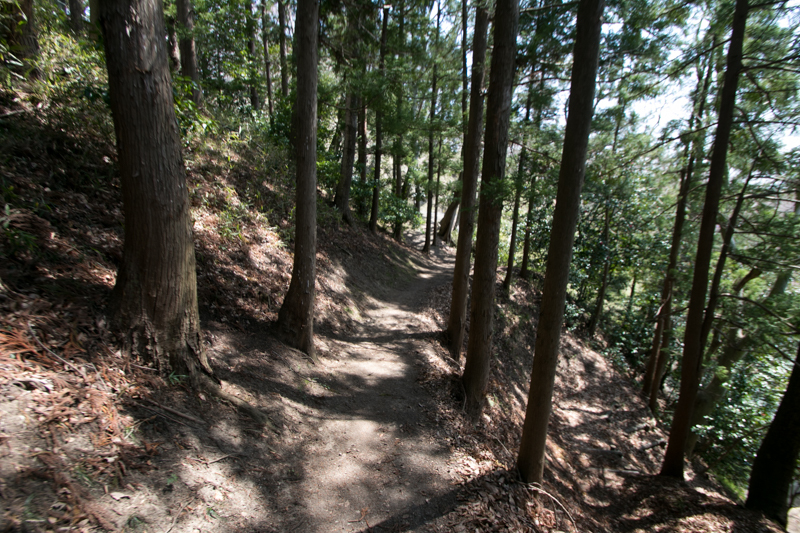 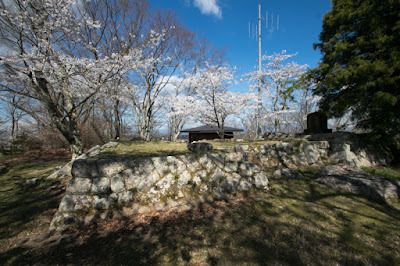 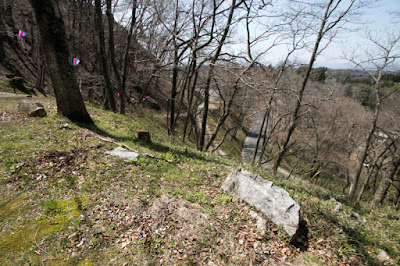 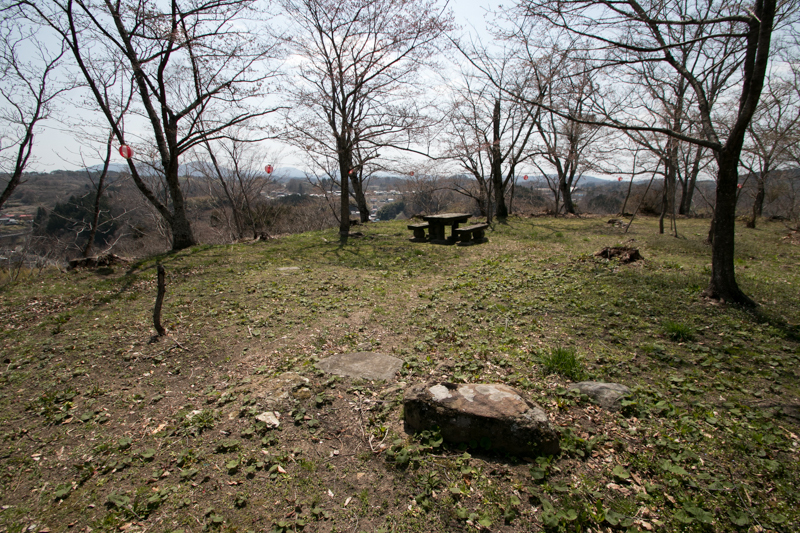 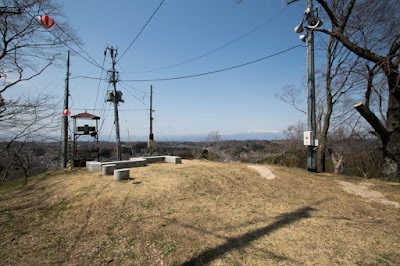 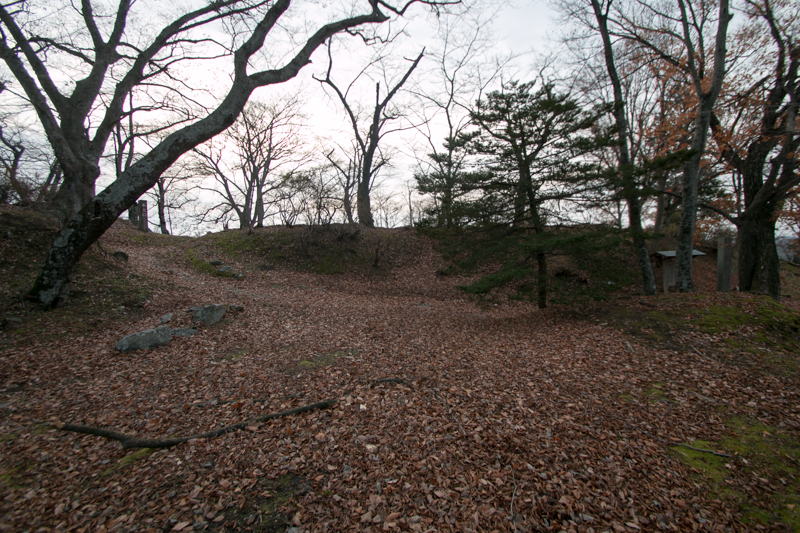 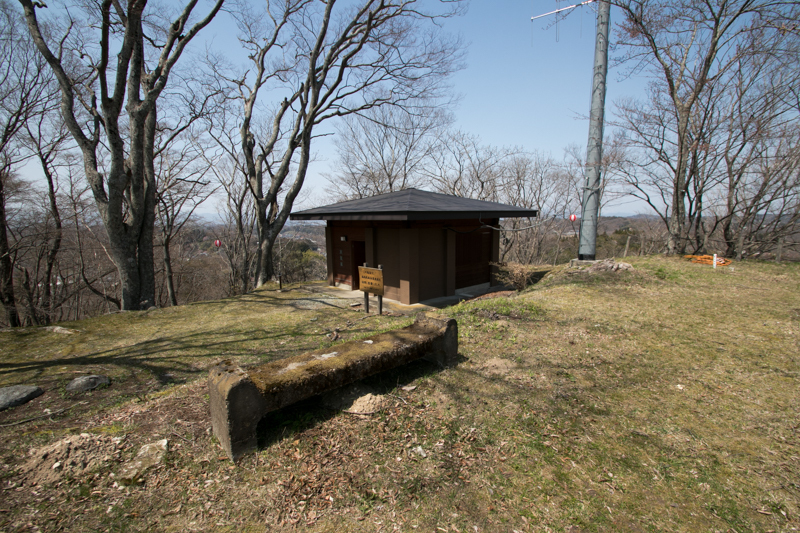 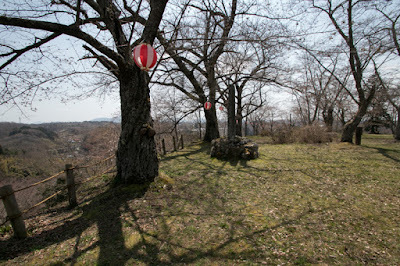 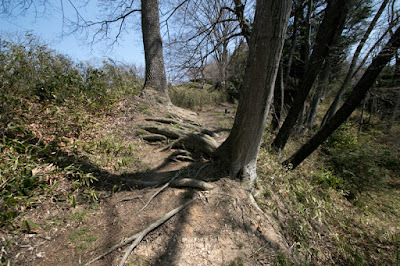 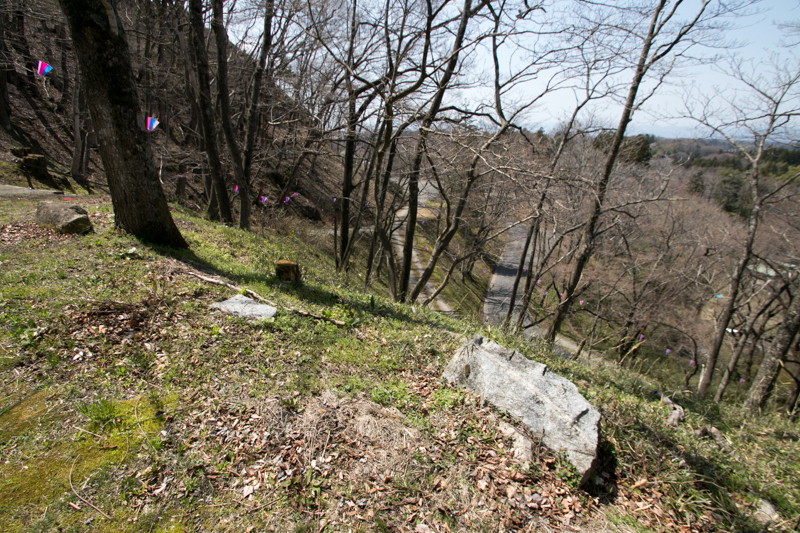 Although hill top area was kept but Akita clan built hillside residence and mainly lived there. Akita clan was not involved further trouble and kept Miharu castle by the end of Edo era. 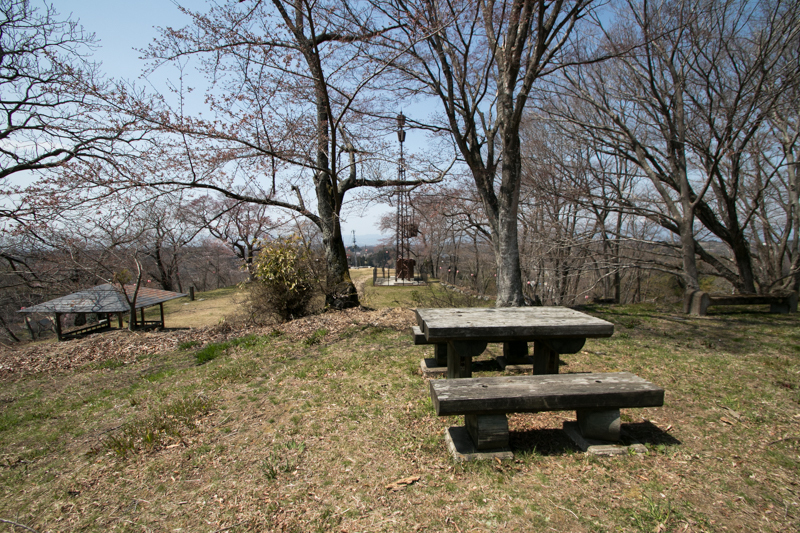 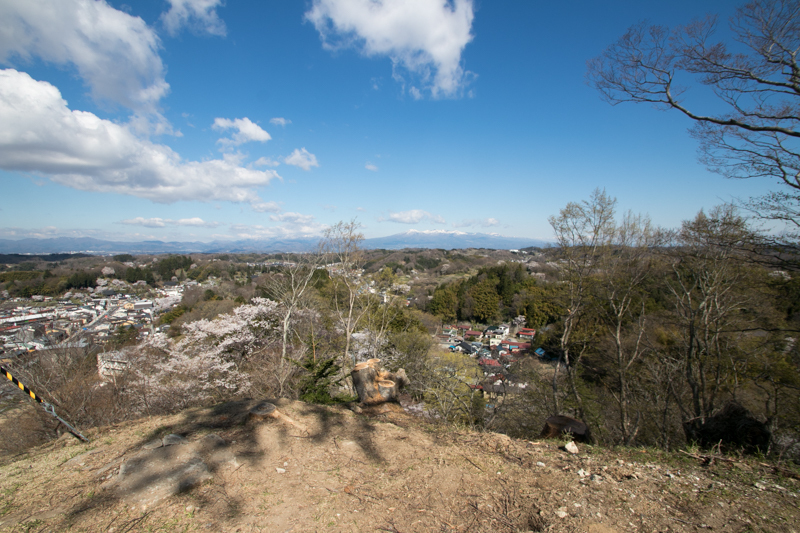 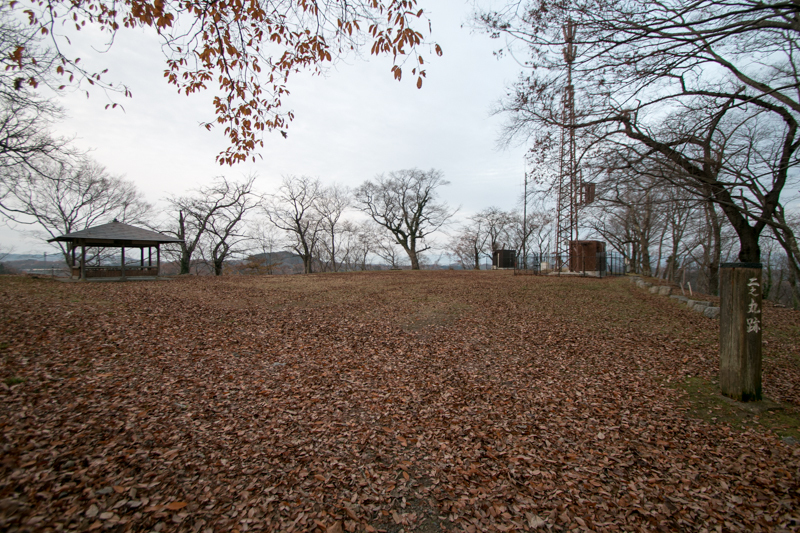 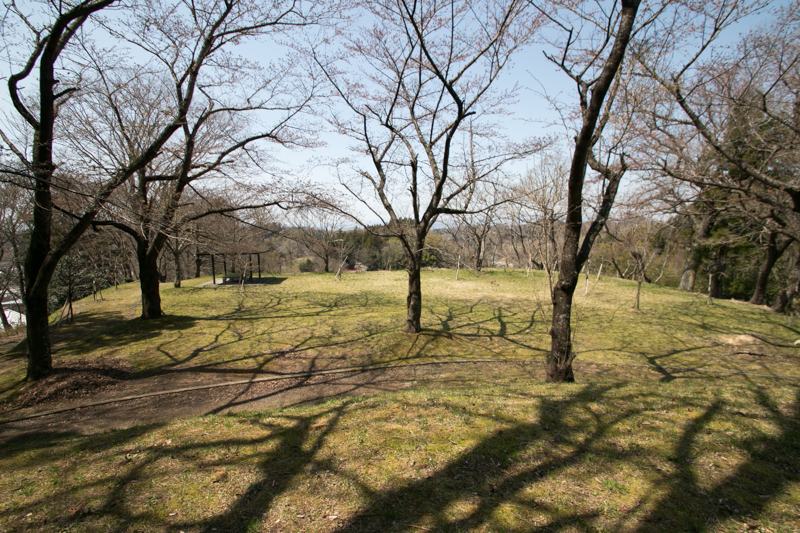 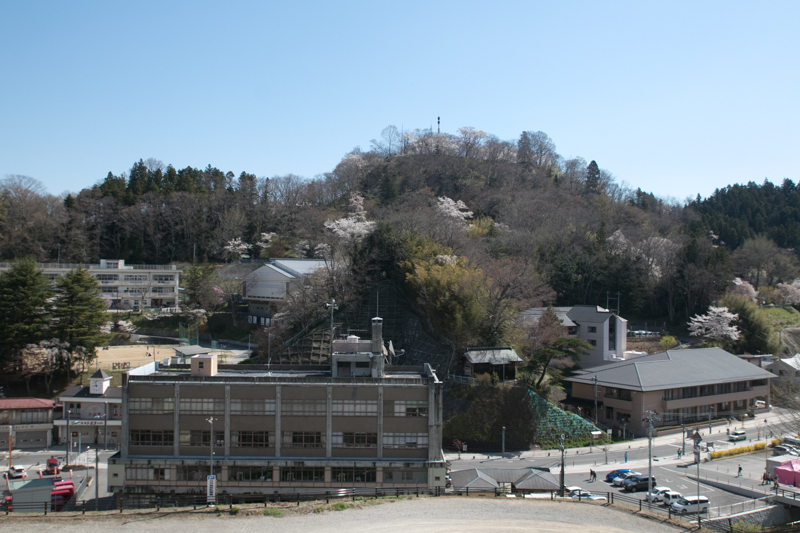 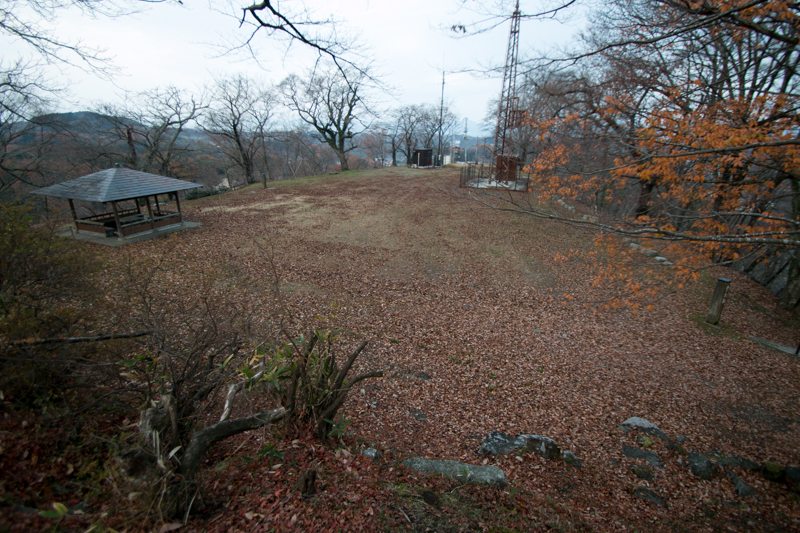 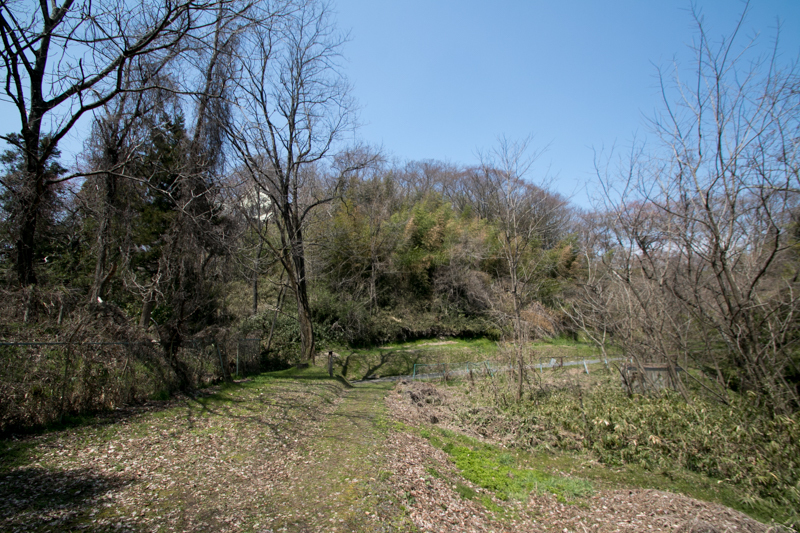 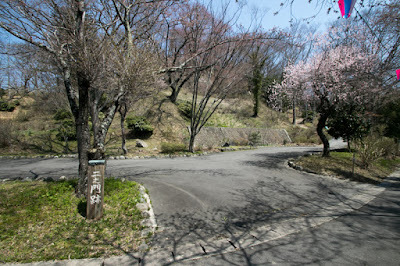 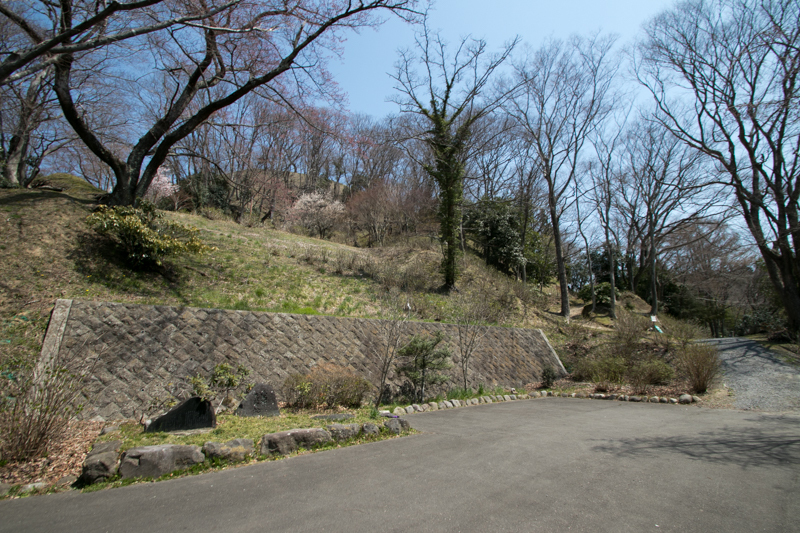 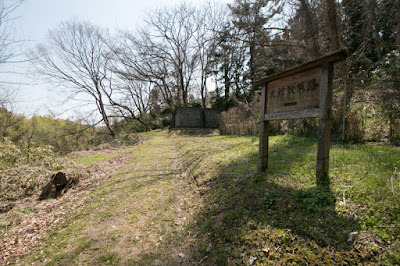 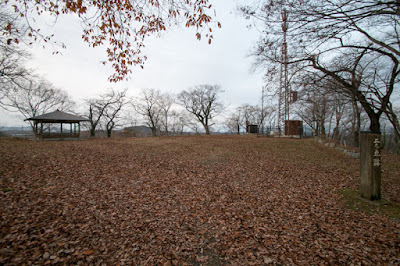 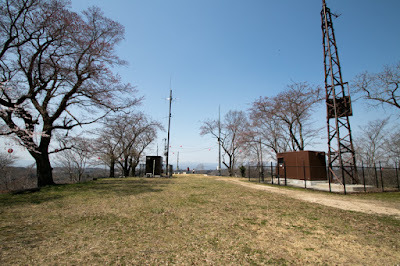 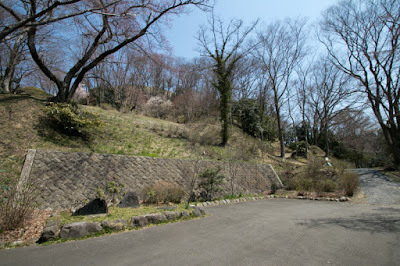 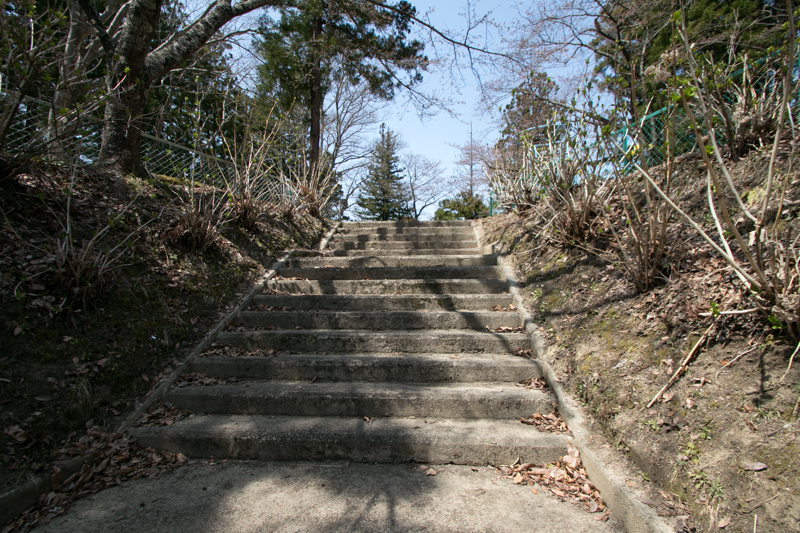 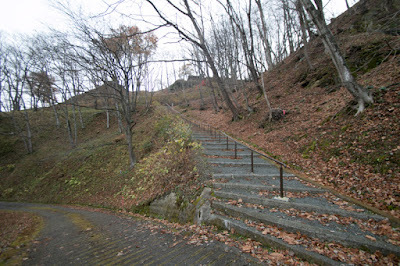 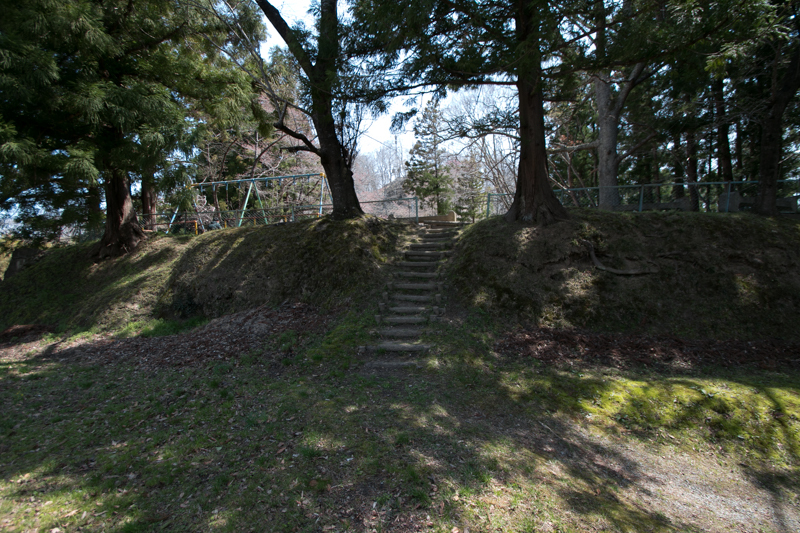 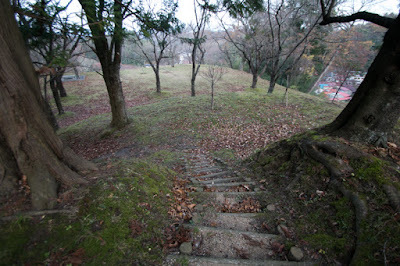 Subsequent to Meiji revolution, all building except for main gate of domain school was lost but shape of hilltop area is well kept by now and used as a park. 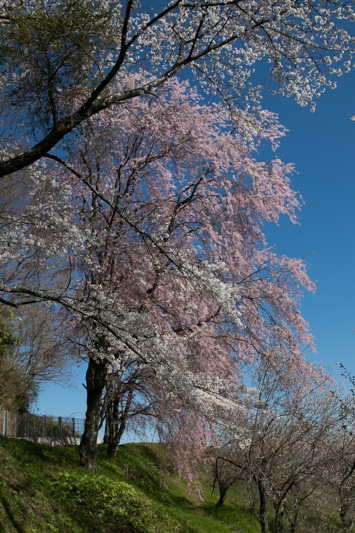 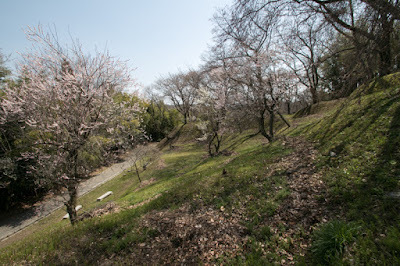 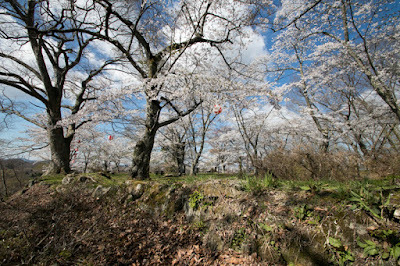 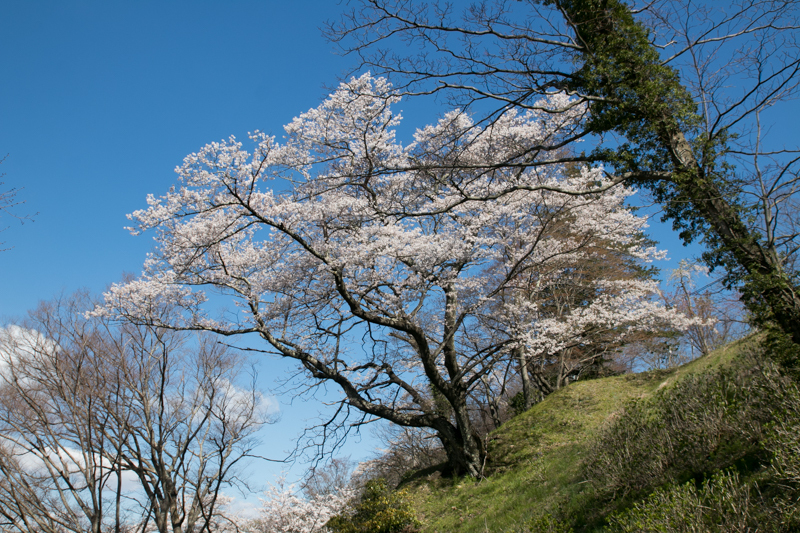 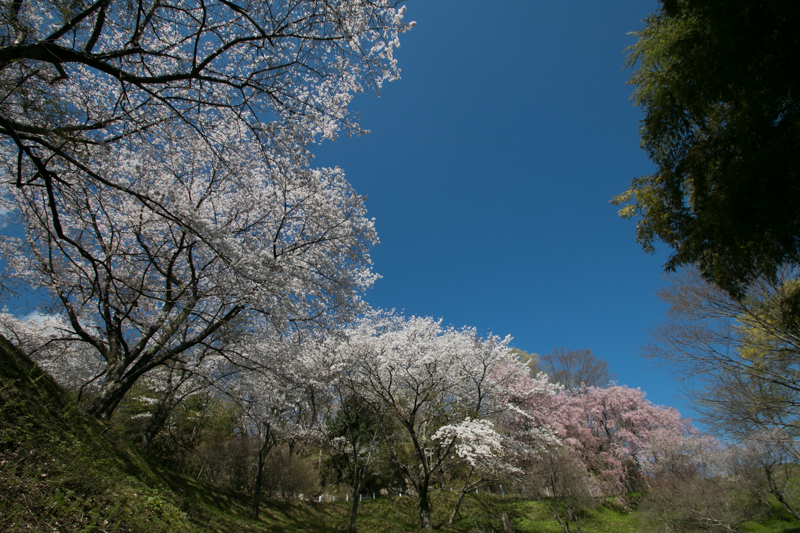 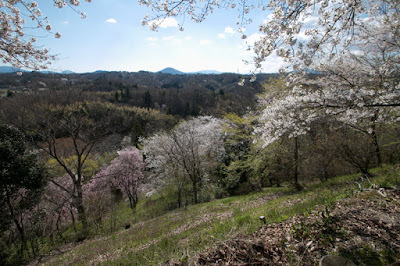 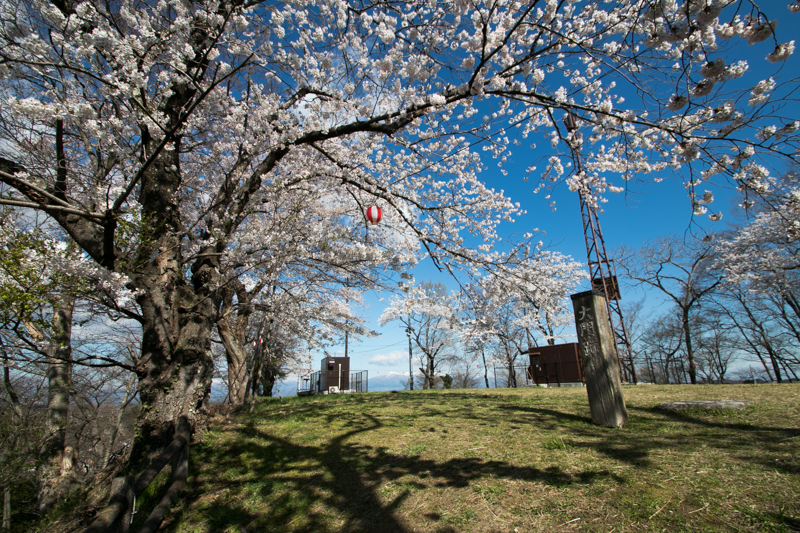 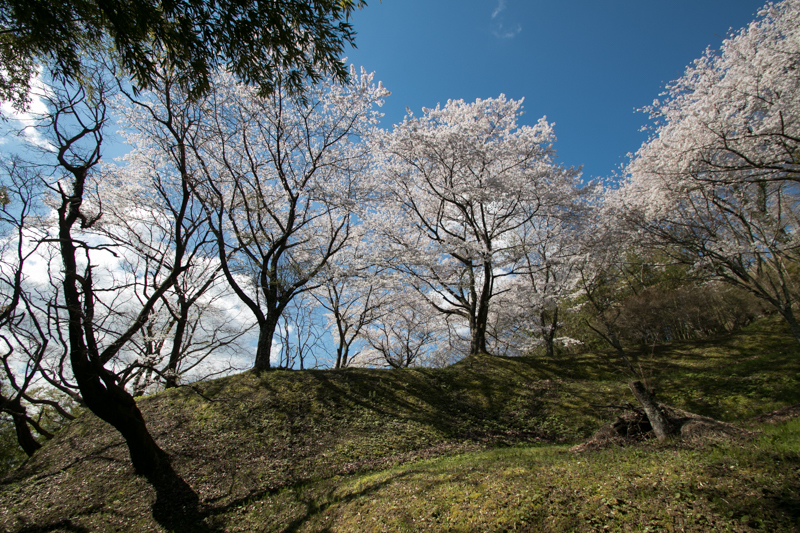 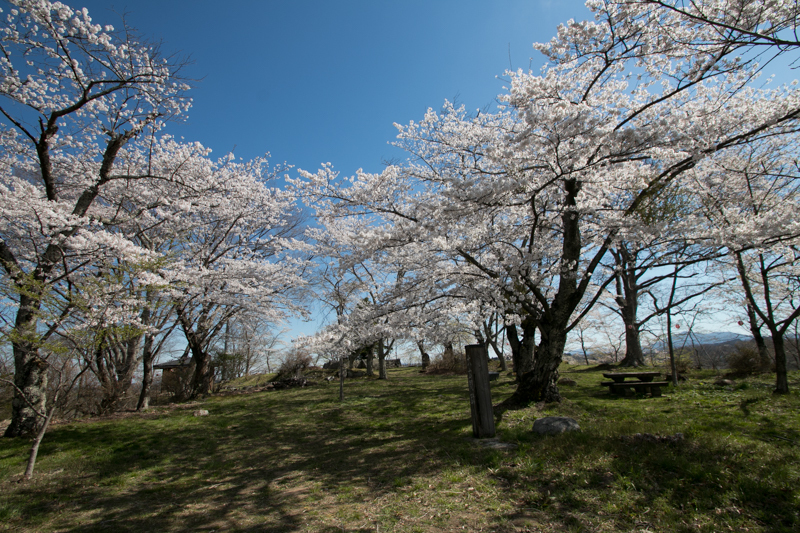 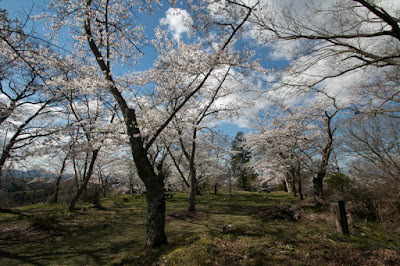 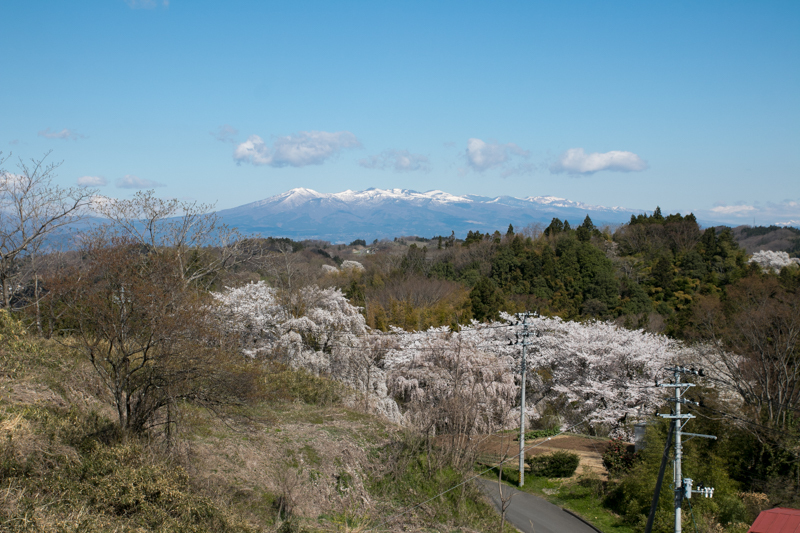 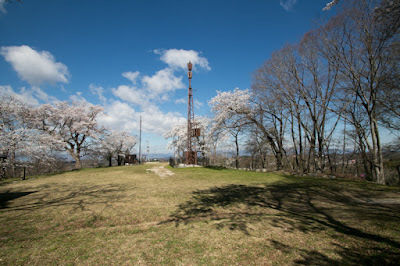 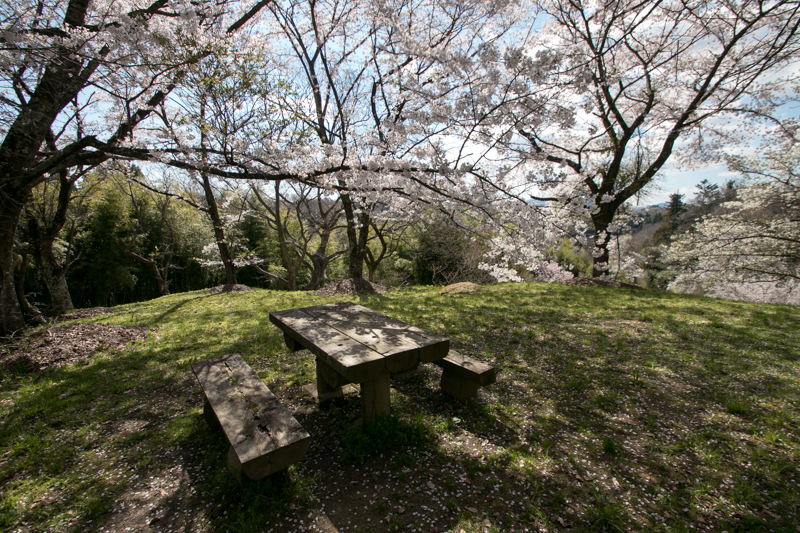 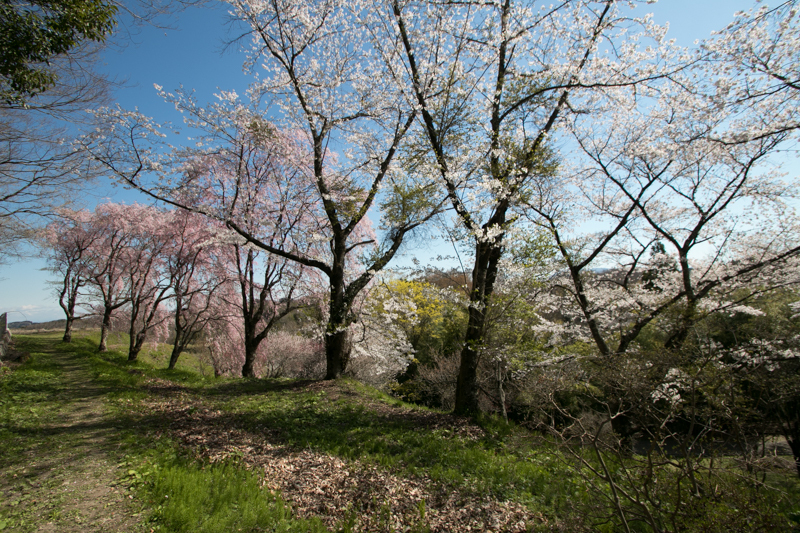 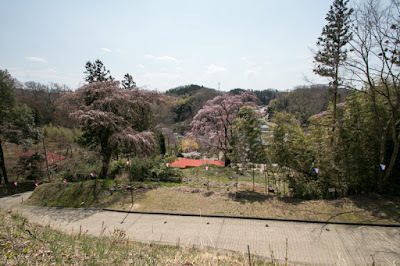 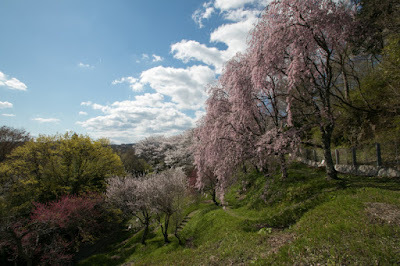 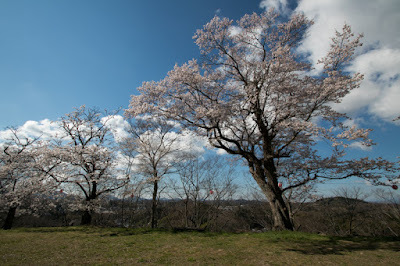 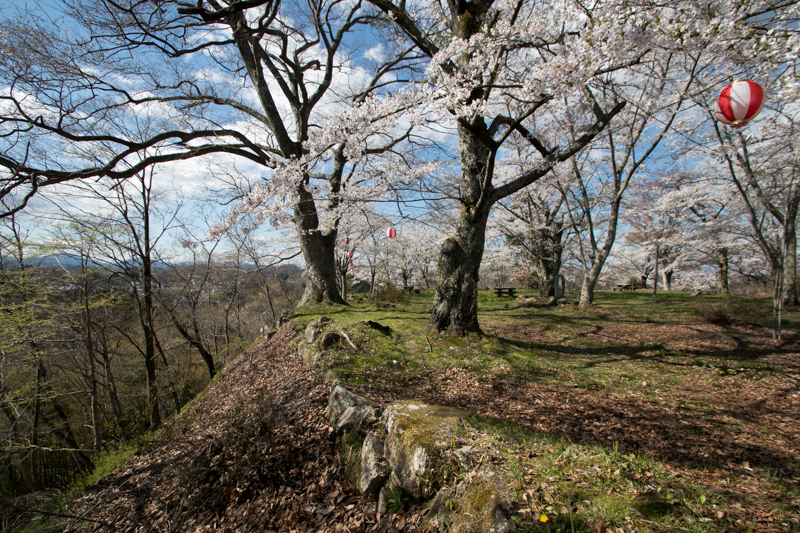 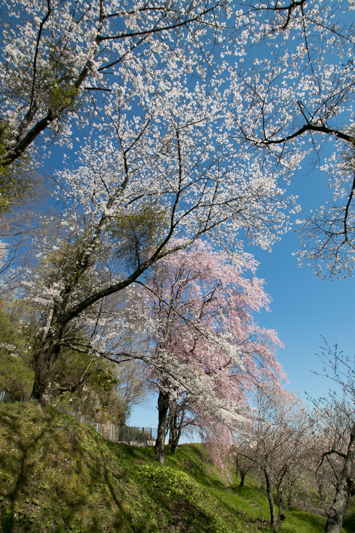 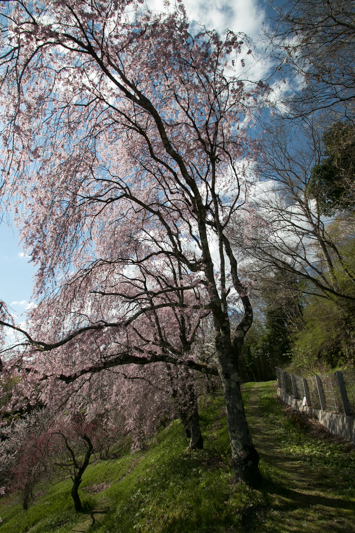 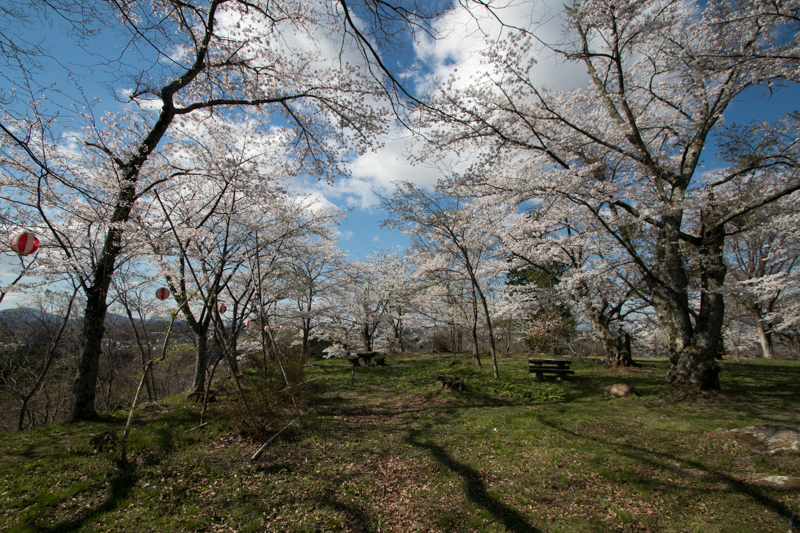 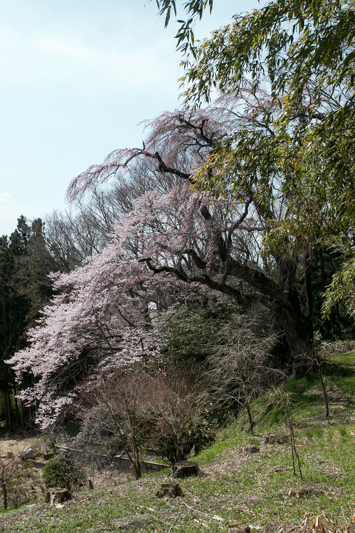 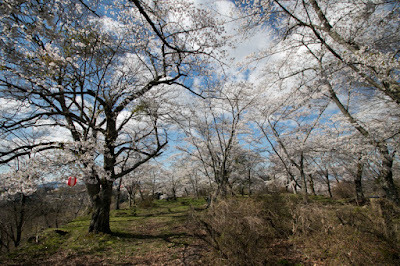 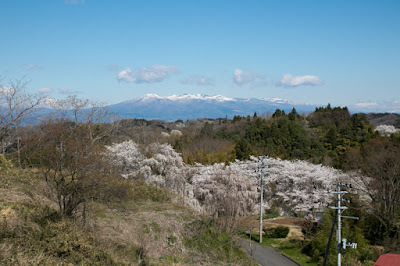 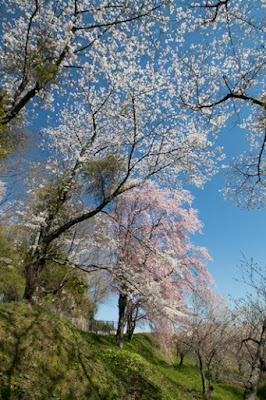 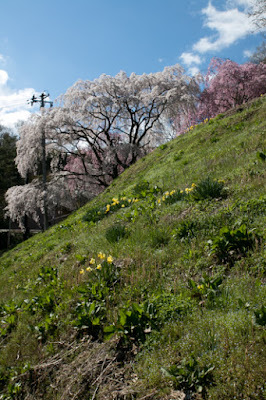 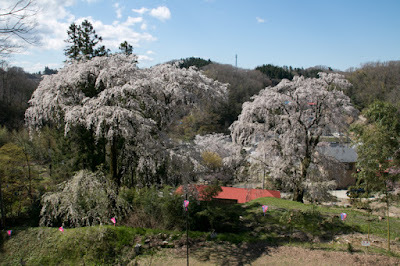 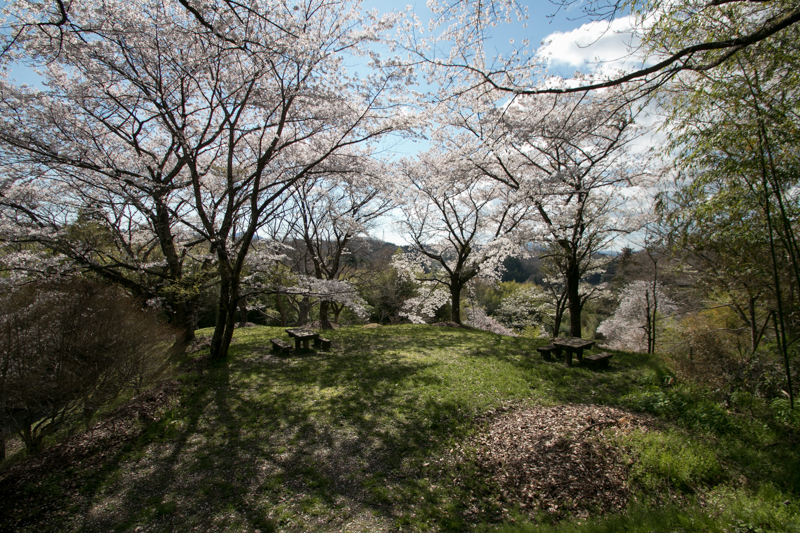 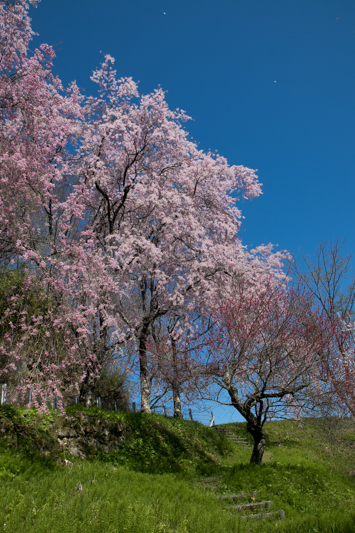 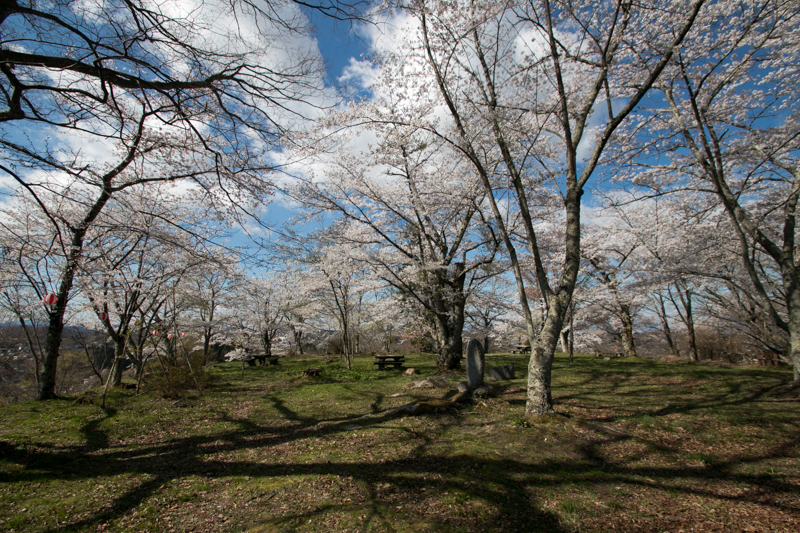 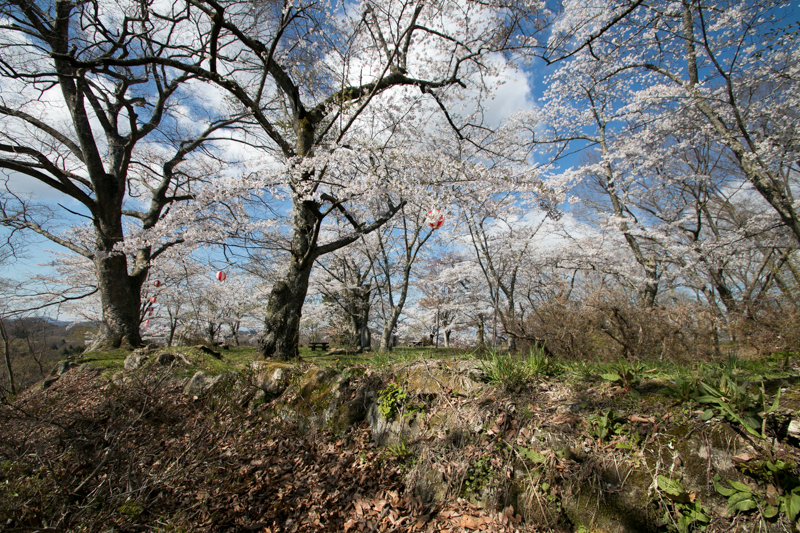 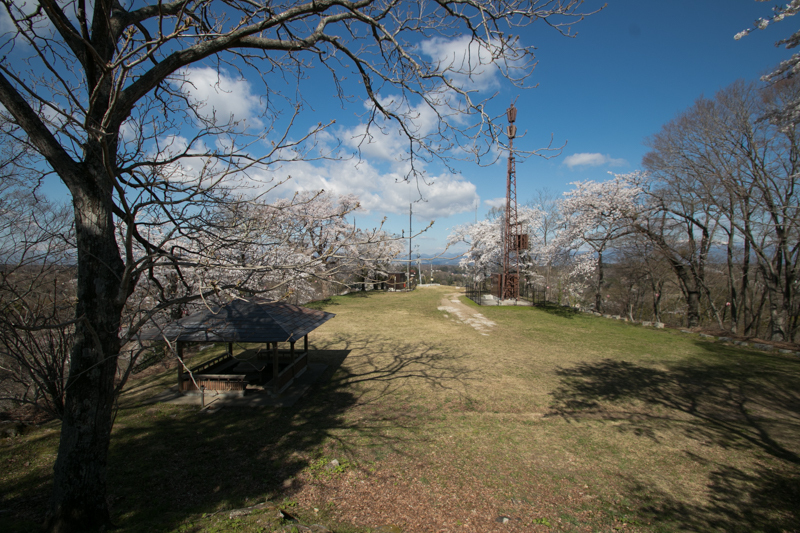 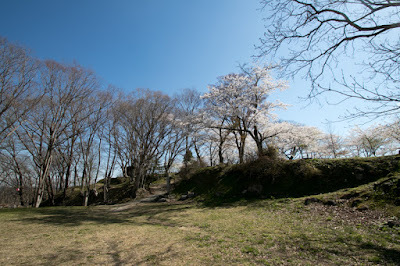 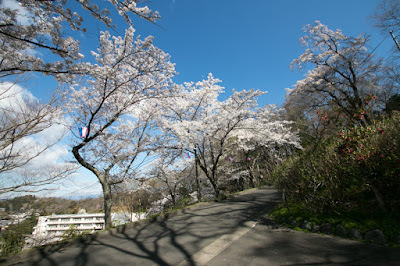 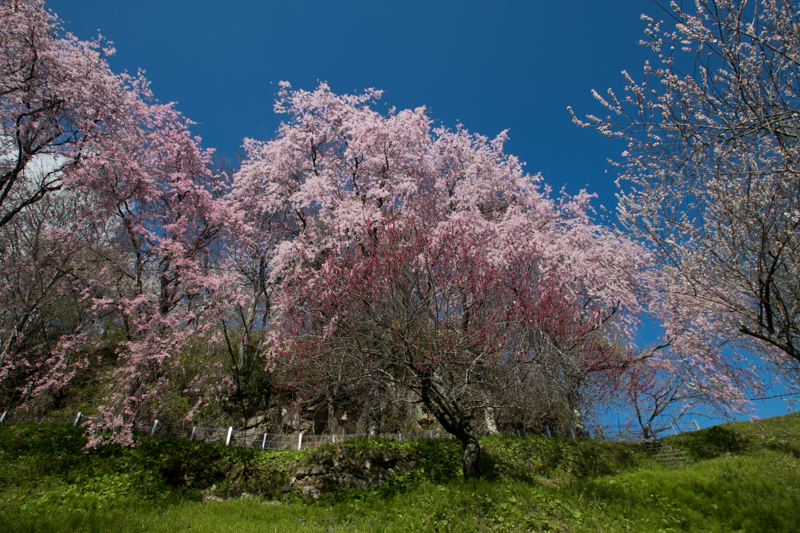 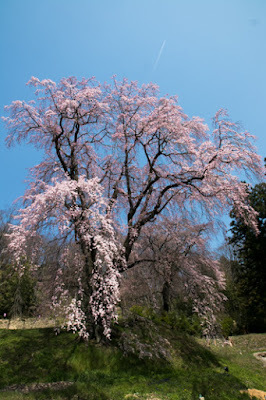 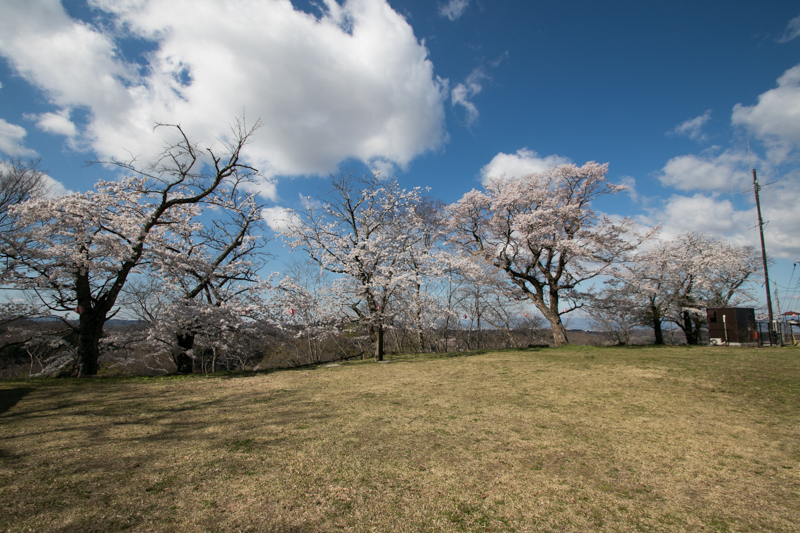 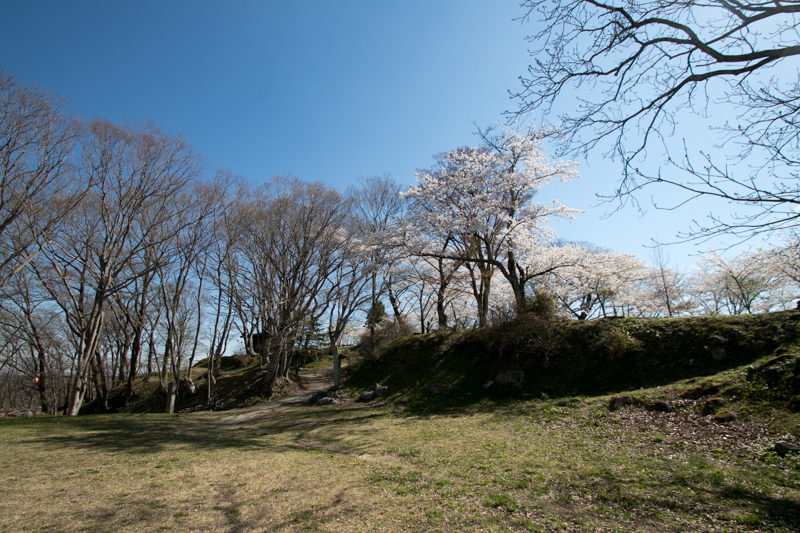 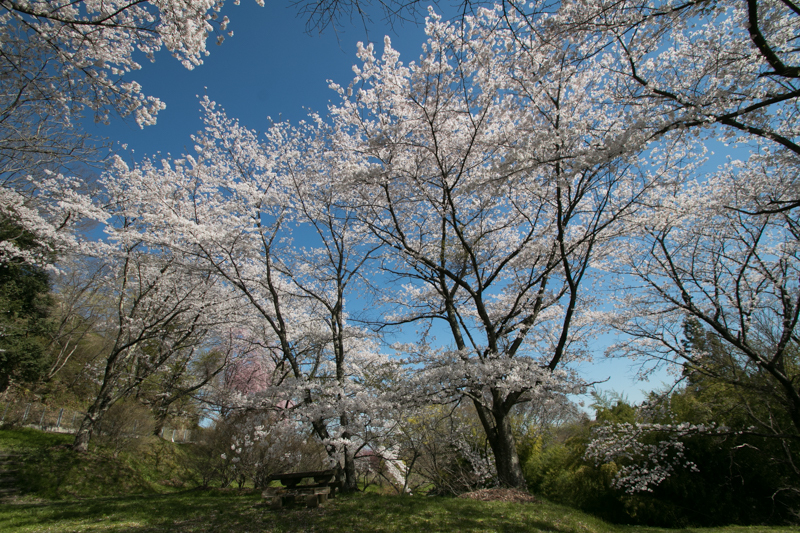 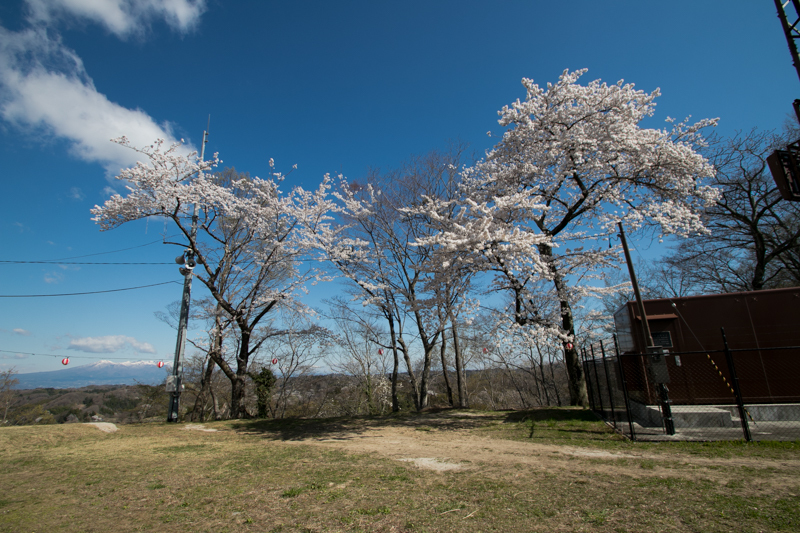 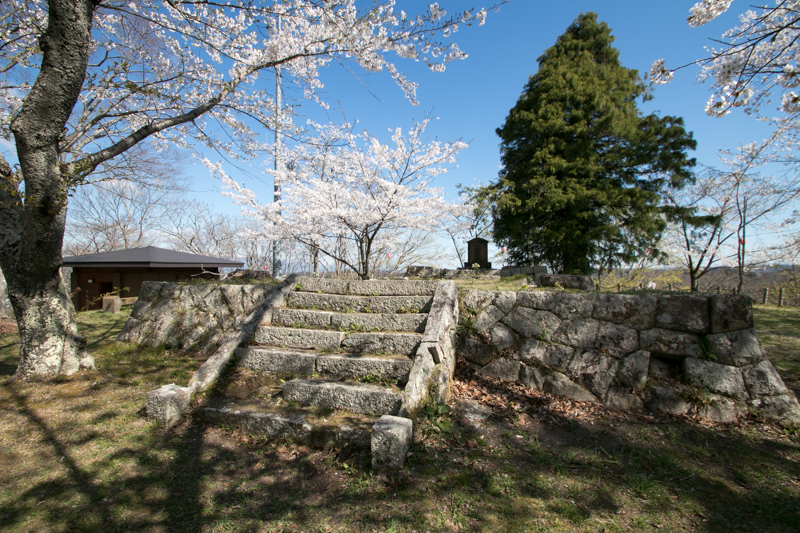 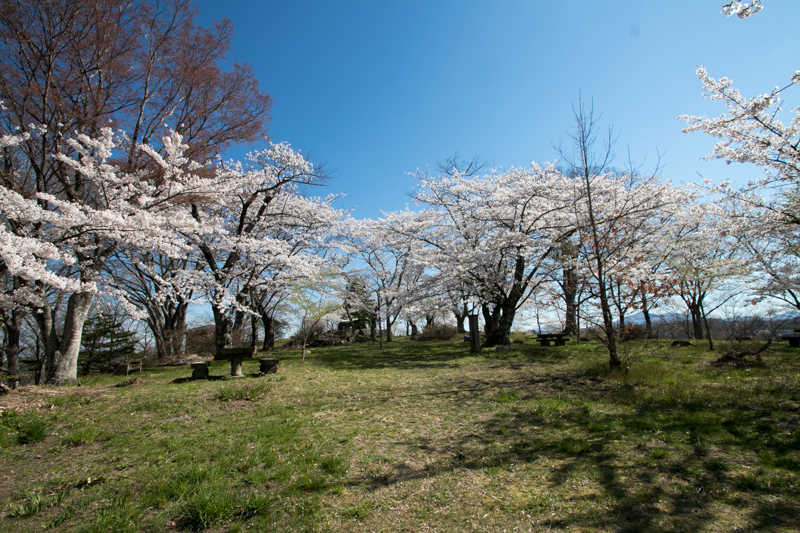 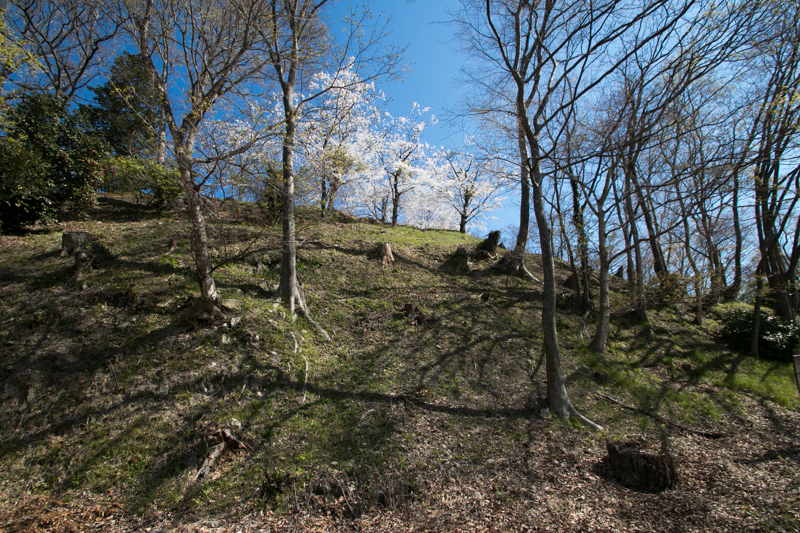 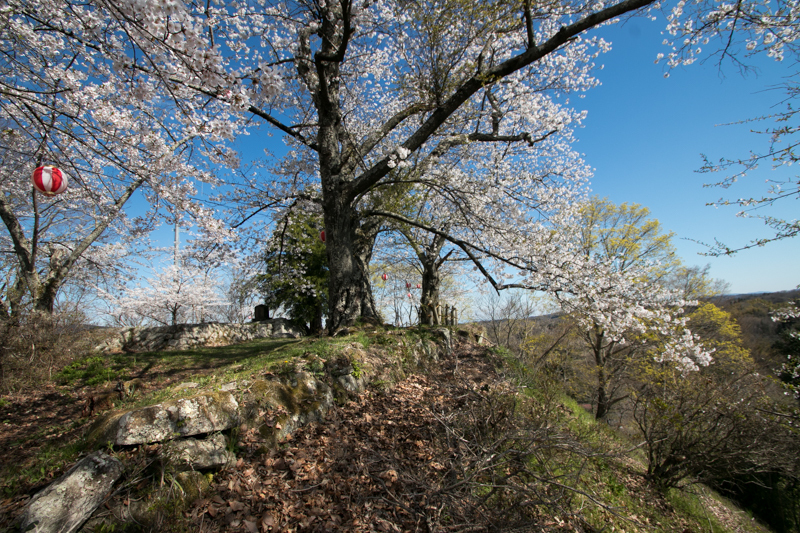 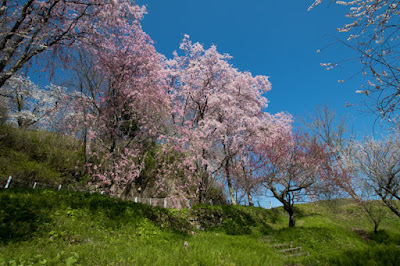 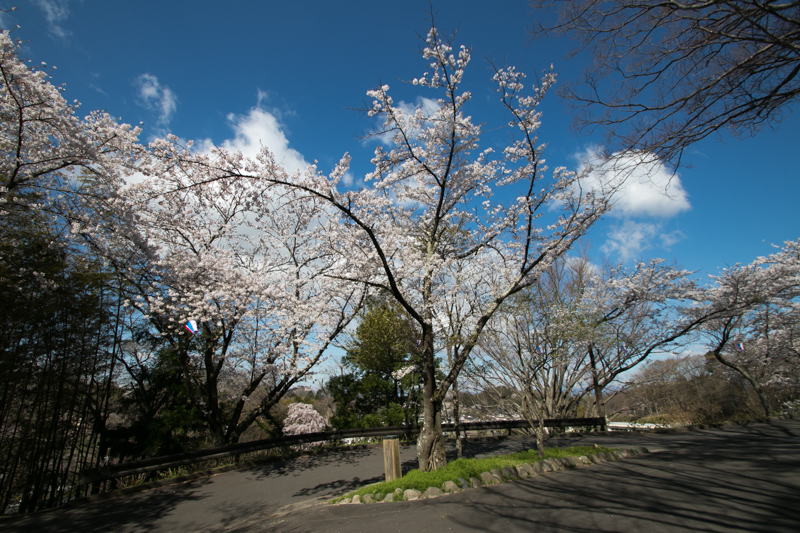 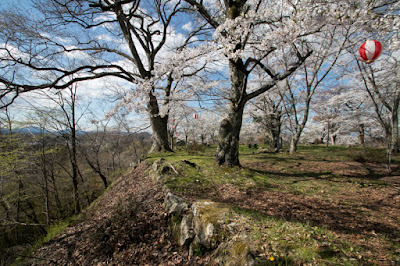 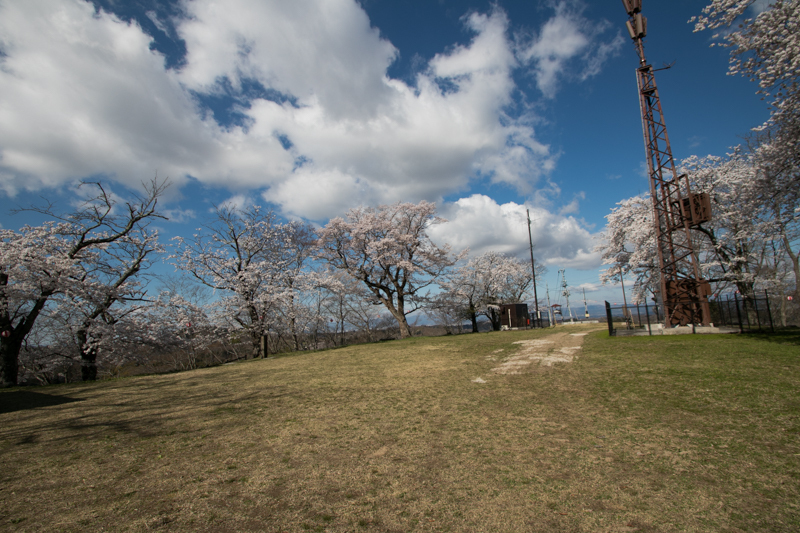 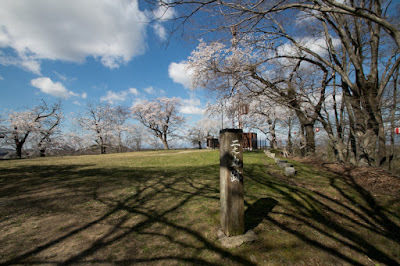 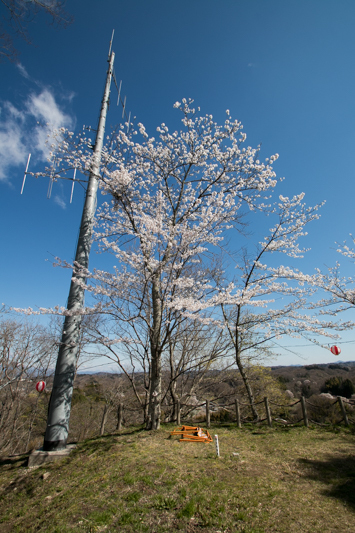 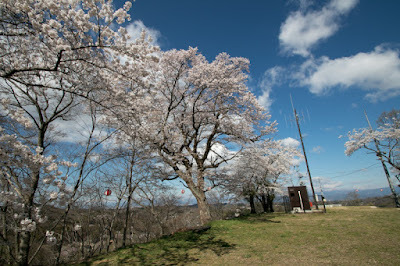 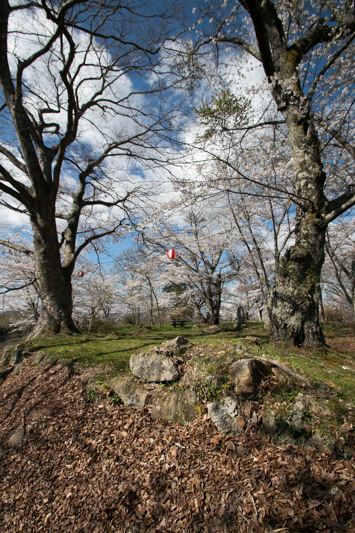 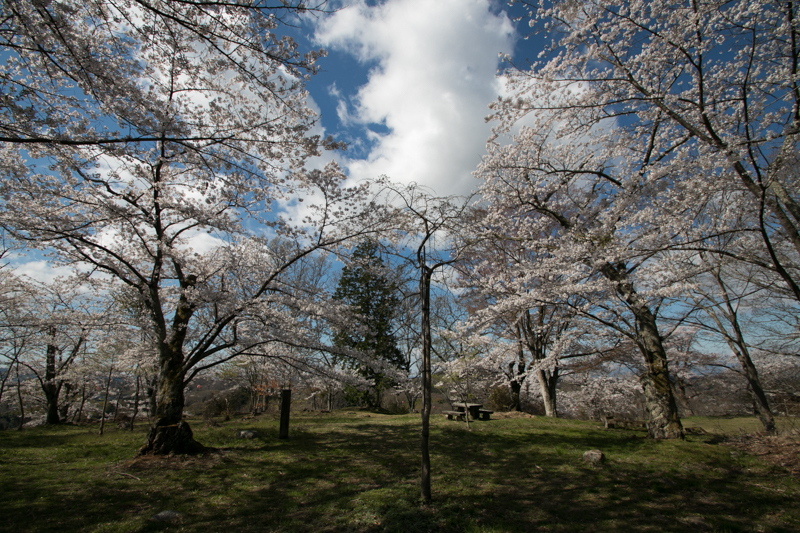 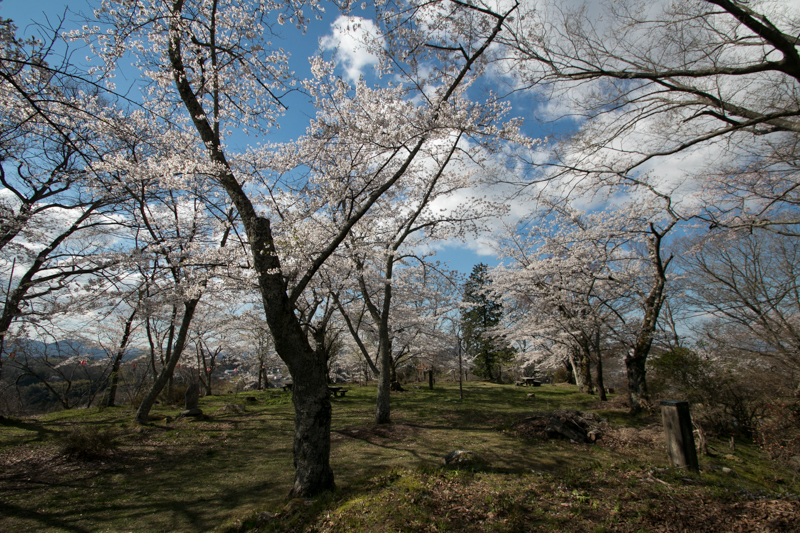 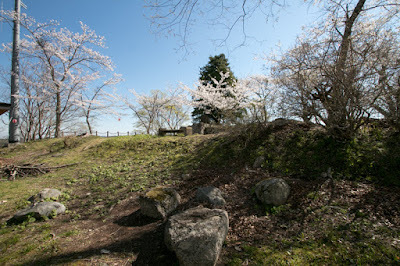 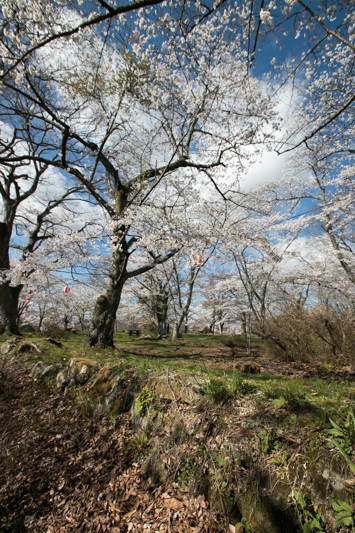 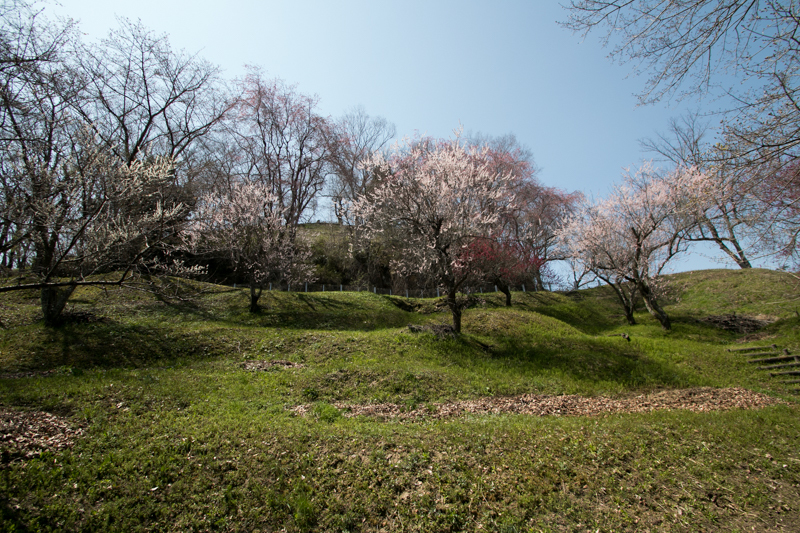 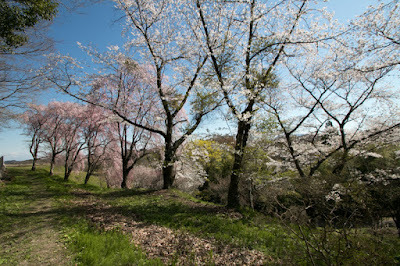 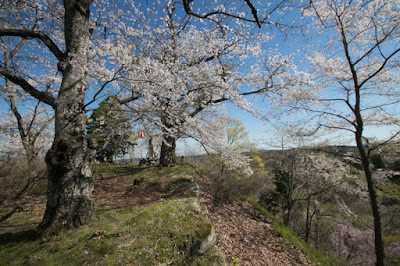 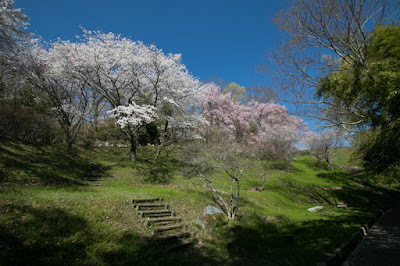 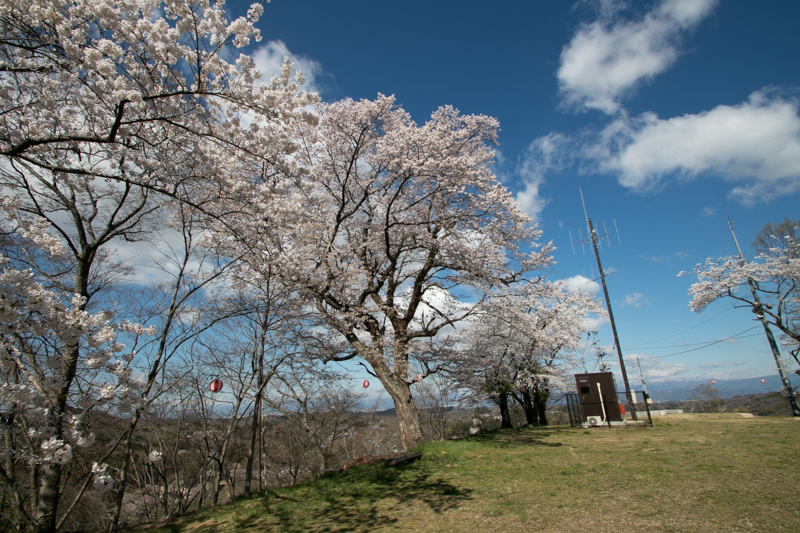 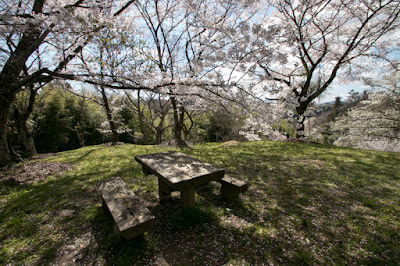 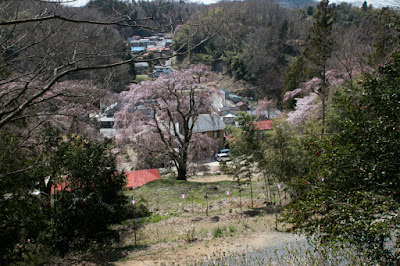 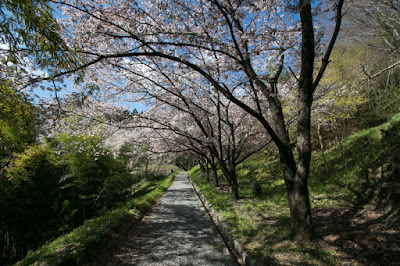 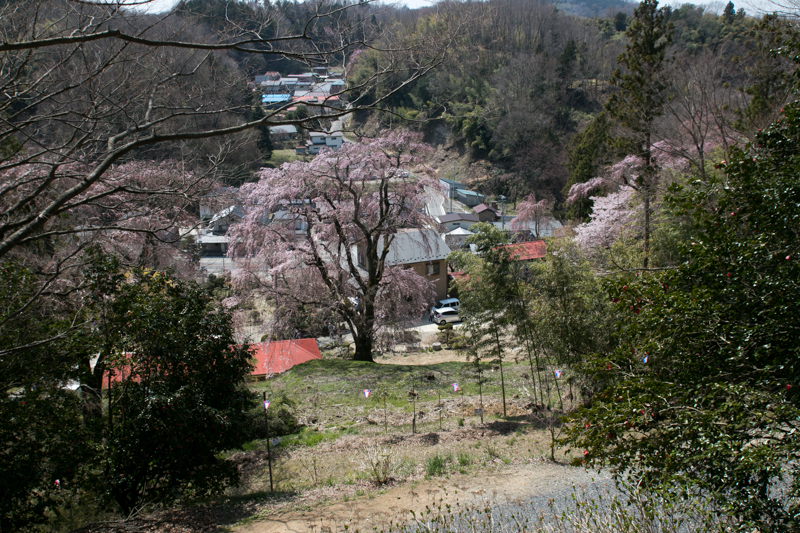 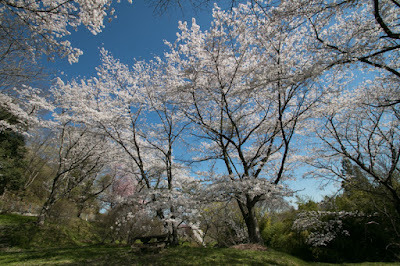 Many cherry trees planted around the castle, and in spring Shiroyama hill is covered by layer of beautiful cherry blossoms. 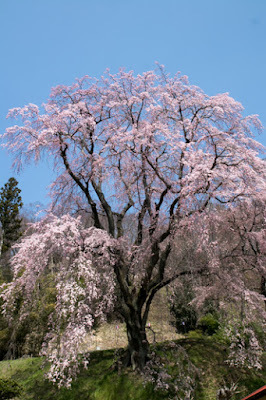 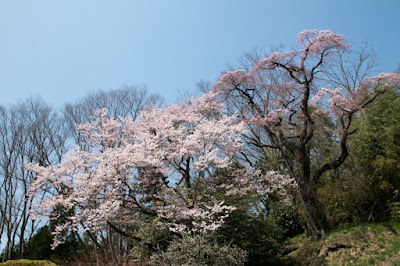 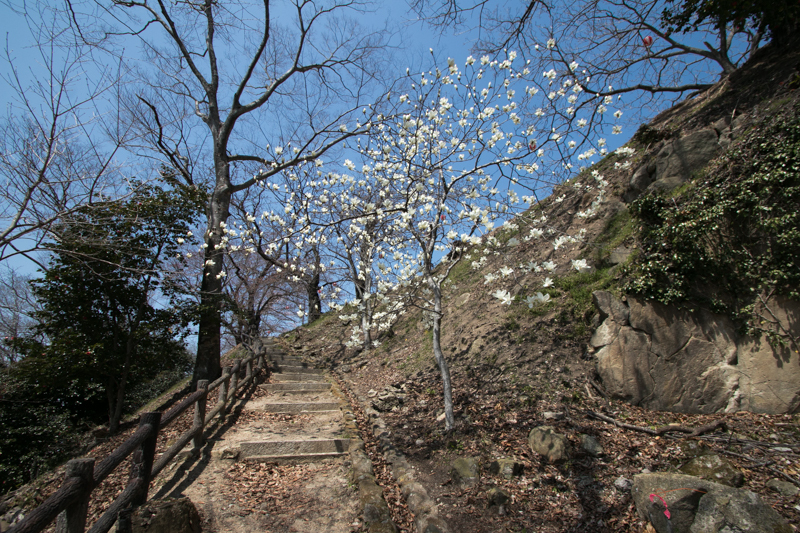 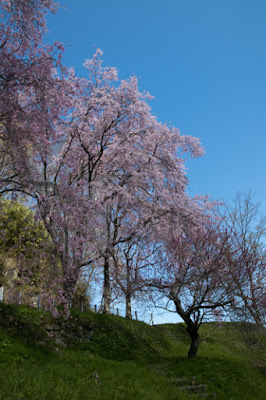 Along with Takizakura cherry tree, which is said as over 1000 years old and regarded as one of three huge cherry trees in Japan, and traditional castle town which is called as little Kamakura, ruin of Miharu castle still keeps friendly atmosphere of traditional castle town. 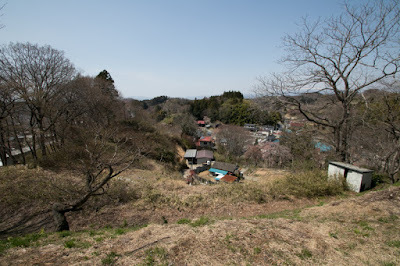 20 minutes walk from JR East Banetsu Higashi line Miharu station. 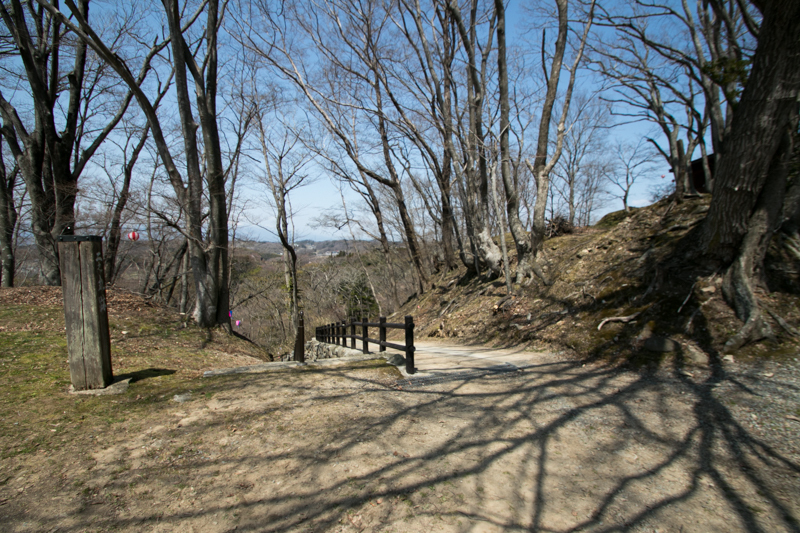 20 minutes drive from Banetsu Expressway Funabiki Miharu interchange to halfway parking. 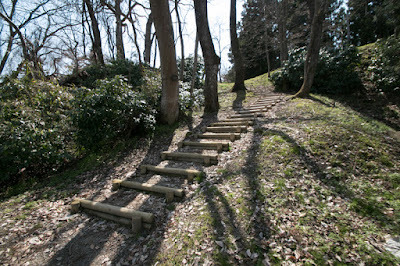 15 minutes walk from hillside to hilltop castle.